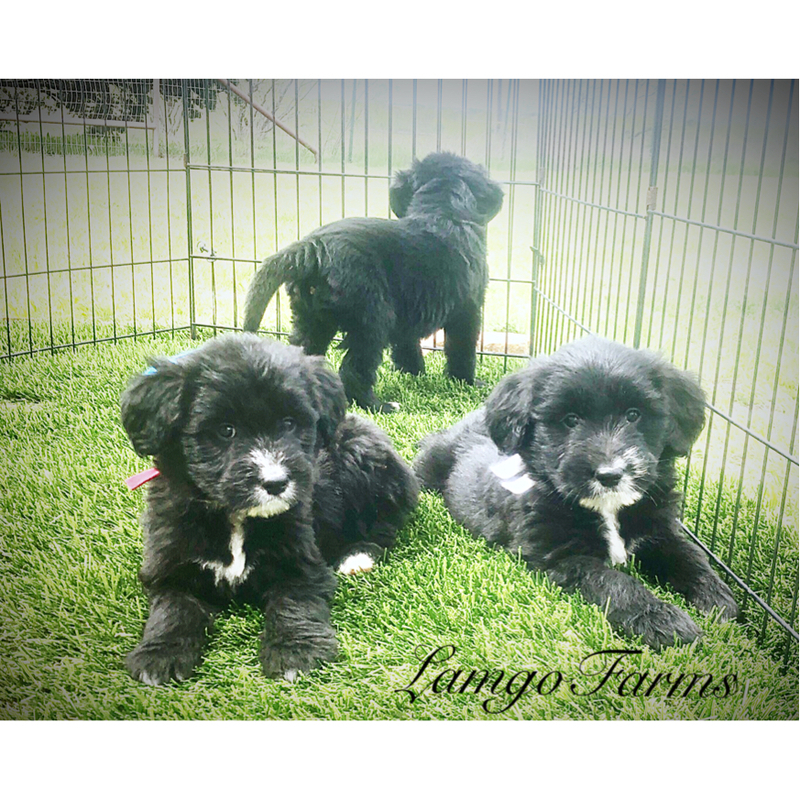 Welcome to this another update at Lamgo Farms! We’re glad you’ve stopped by to see just what is happening with our family, farm and furry friends. 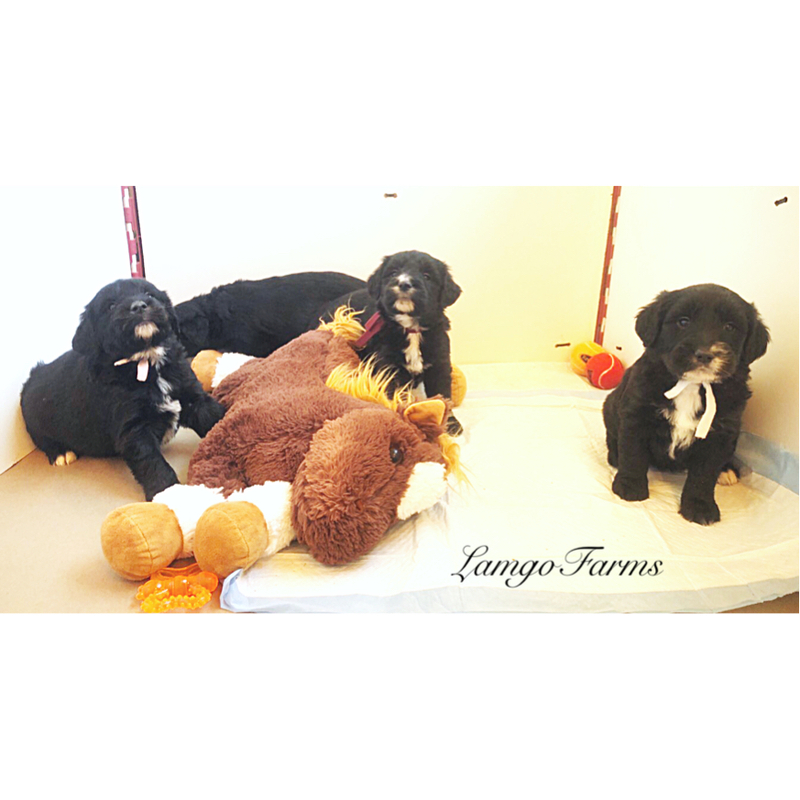 We are at the end of time with our current litters which start going home tomorrow! So with that being said, I will make this intro short so I can finish getting all of my paperwork out and packets organized. 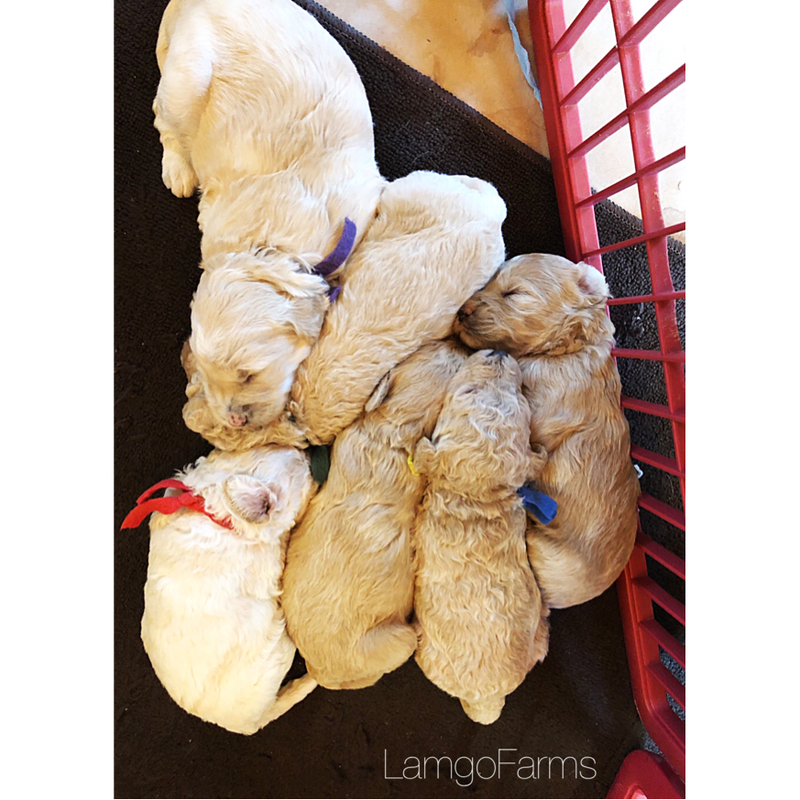 Right now we have puppies available to go home in our Golden Sheepie litter. All others are currently reserved. Our next breeding with available picking spots will be for our mini’s and mediums that will be bred between June and July. Once we get through this current season, we will list our Fall/Winter 2019/20 season. 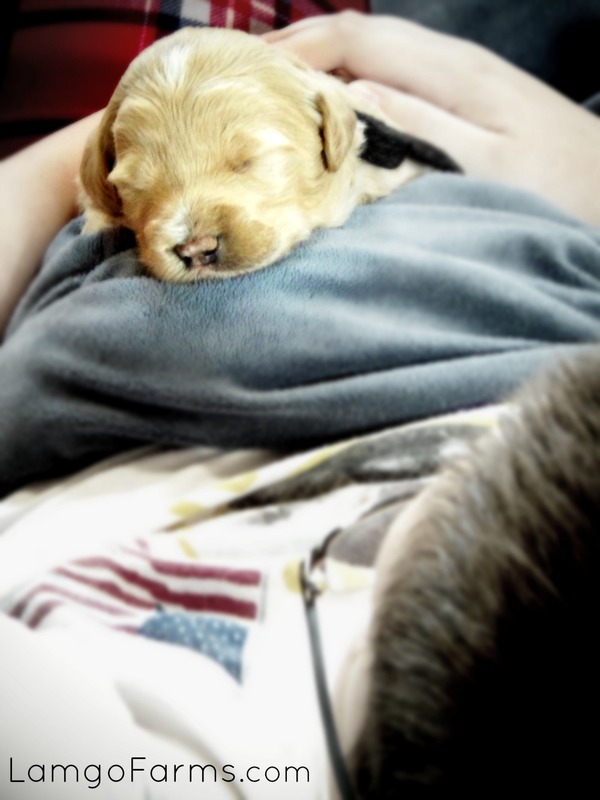 We can’t wait for everyone to meet their puppies! 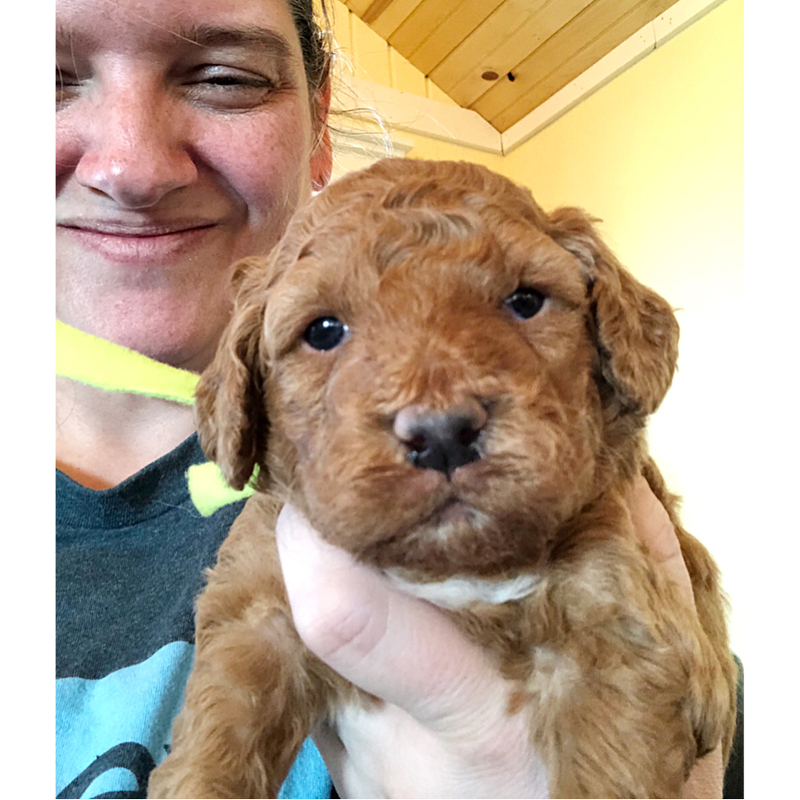 Scroll on down for information on how to reserve a picking spot, pricing, and to see just what we will be breeding next. . . Here is what we have now and have planned: scroll down to the FAQ section to see how to place a deposit, pricing and to answer many questions. 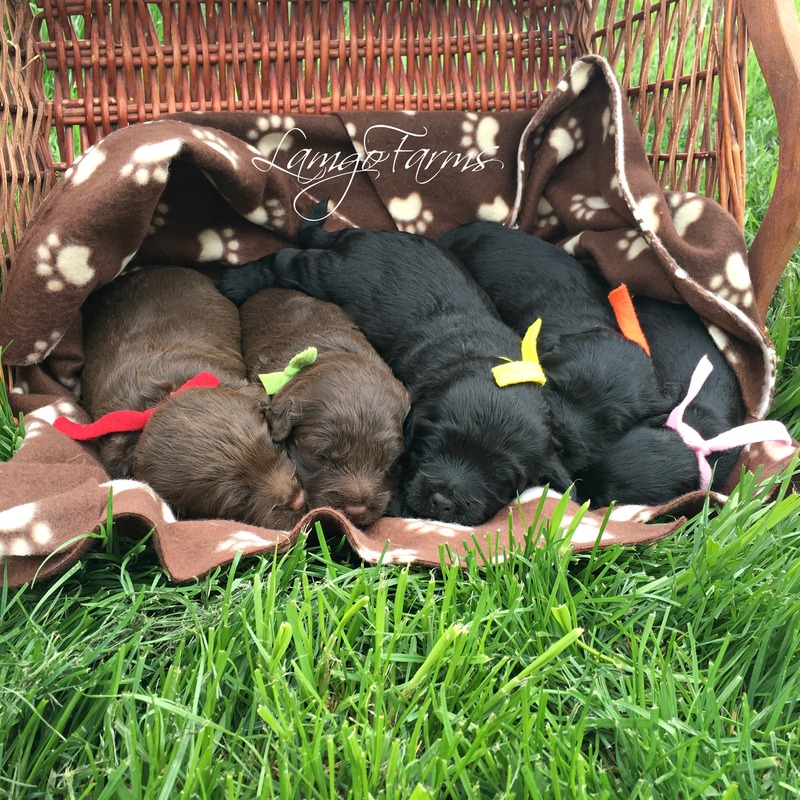 This is a first breeding for this litter so no past puppy pictures. 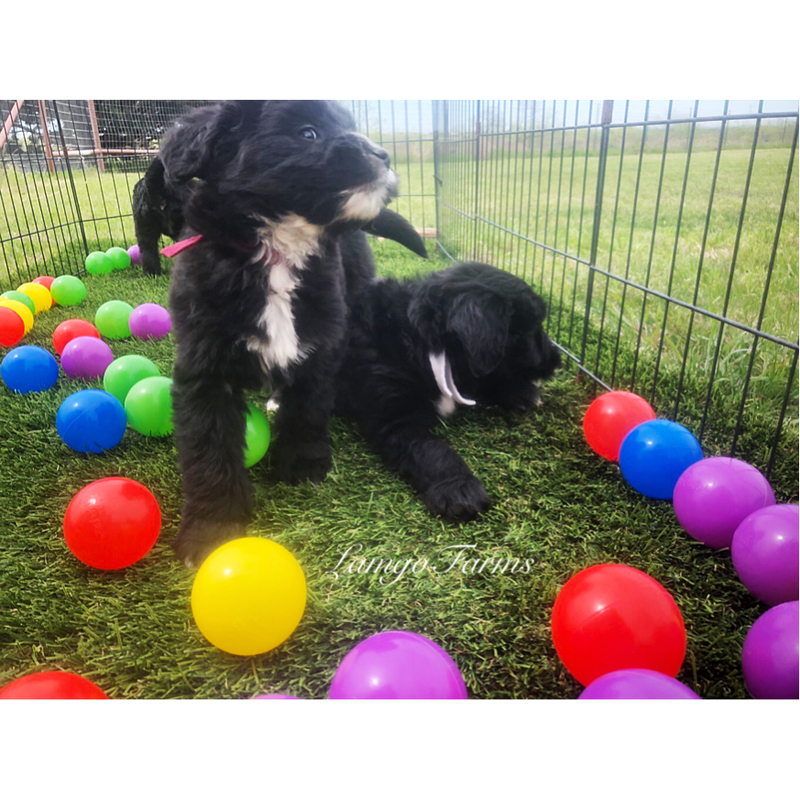 Poppins is a standard AKC registered Black and White Tuxedo Poodle and Banks is an AKC Registered Old English Sheep Dog. Poppins is beyond smart and sweet and Banks is just about the best dog we have ever had. 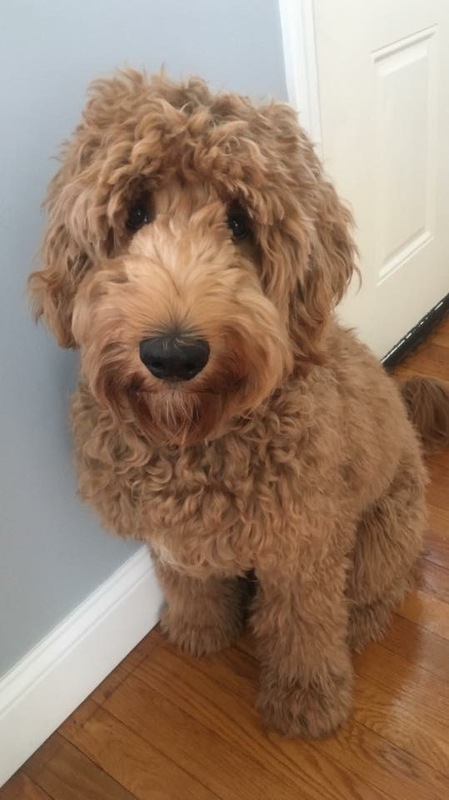 He is super sweet to our toddlers and baby and is gentle and kind. We estimate these puppies to mature between 55-65 lbs. 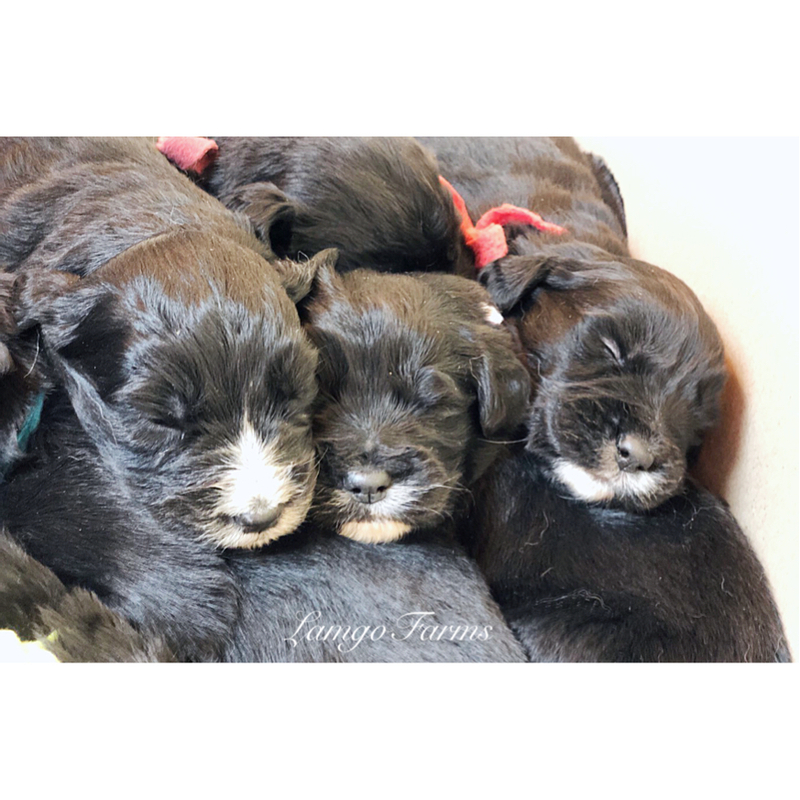 Poppins delivered 3 girls and 4 boys on Friday, February 22nd. All puppies are doing great! 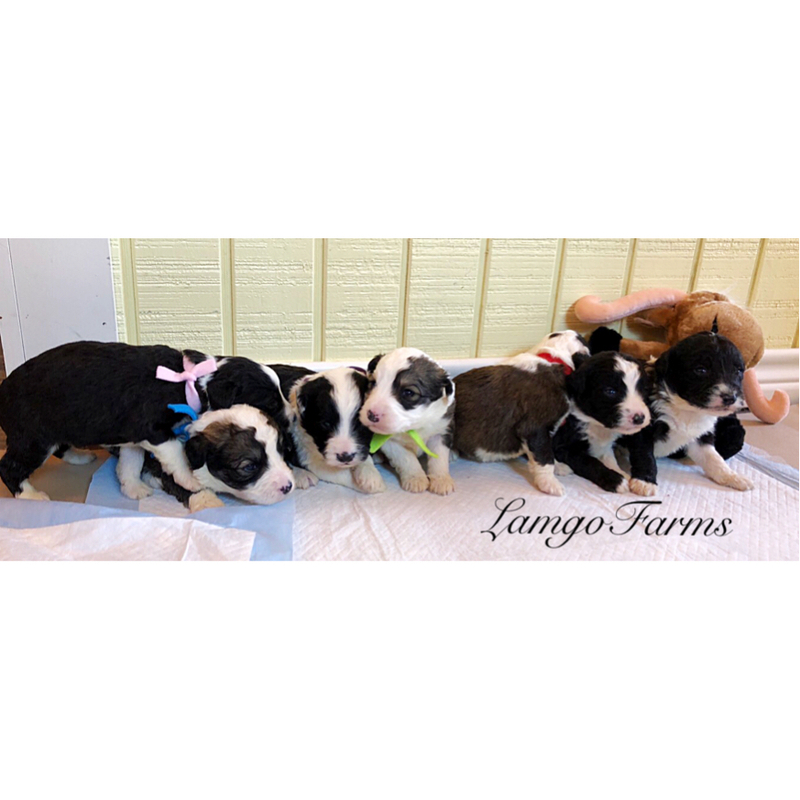 We have 3 “brindle” and white and 4 black and white. 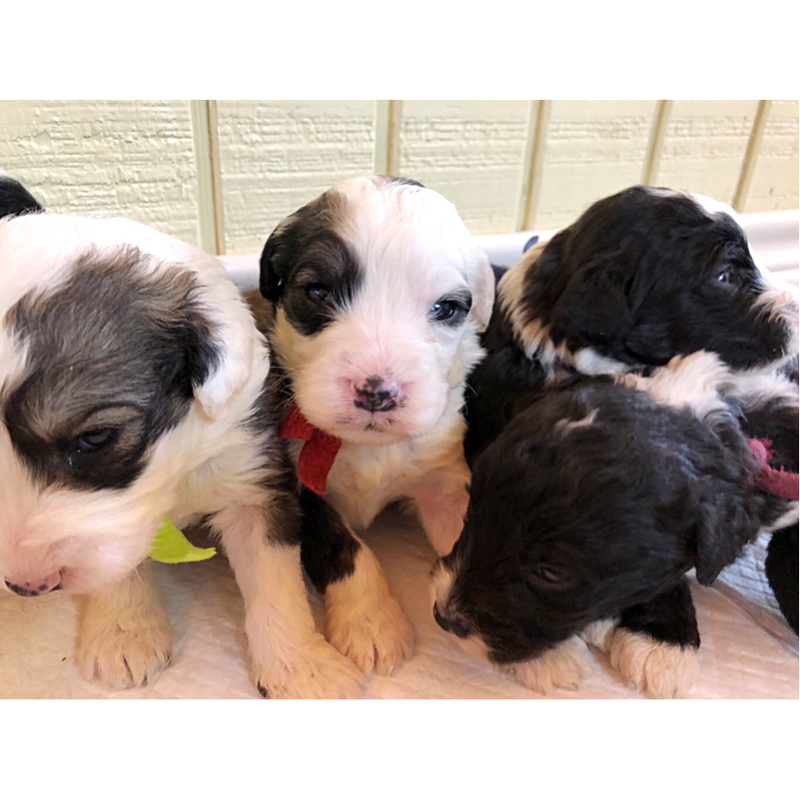 Keep in mind that most Old English Sheep Dogs do turn gray, therefore, the black and whites will most likely turn gray and white. With Poppins being a black and white tuxedo- some black coats could stay black. Time will tell. 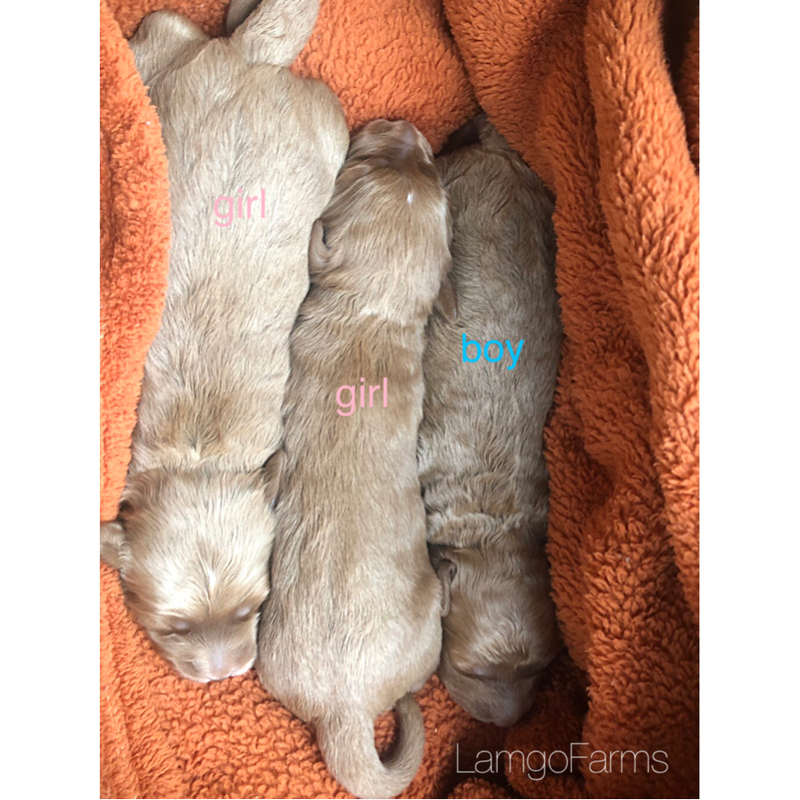 The girls’ collar colors are Bright blue (turquoise), Light Pink and Purple. The boys are Dark Blue, Lime Green, Red and Burgundy. Oh these little Pandas! They are all so precious. Right now we are working on crate training and potty training. Everyone should have received emails with directions to Lamgo Farms, picking instructions and reading material. Upcoming emails will have pick up instructions along with just what is in each of your puppy packets. Please let me know if I’ve skipped over anyone. Next week we will have more pictures and another video. 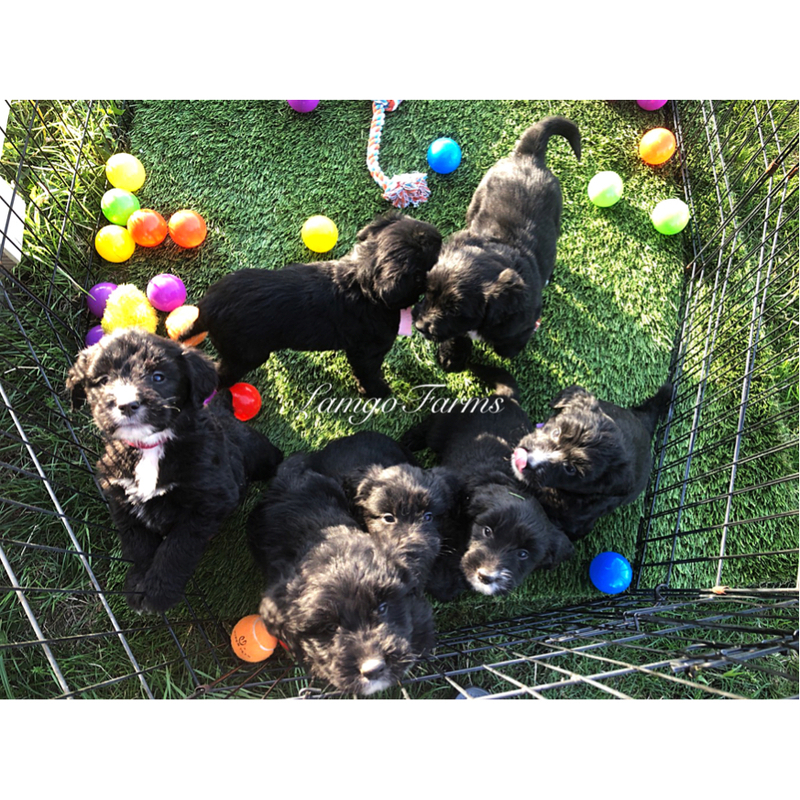 The puppies will continue crate training by themselves and we’ll begin a few commands and work on manners. The week will fly by for me! 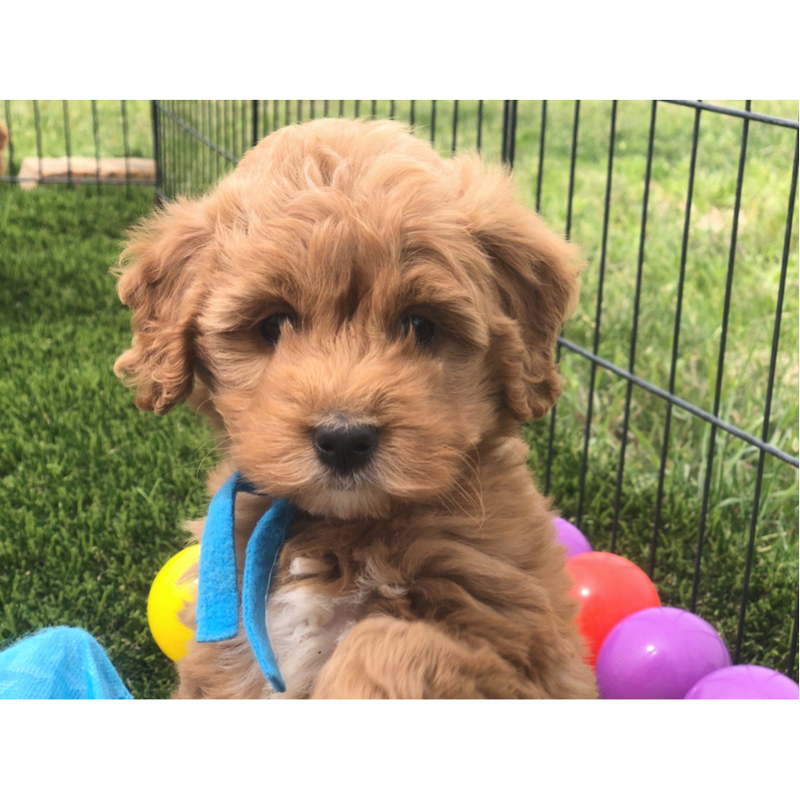 Puppy Picking/Pick up Schedule: We are having our picking and pick up on the same day this season. We are scheduling on Friday, April 19th and Saturday the 20th. 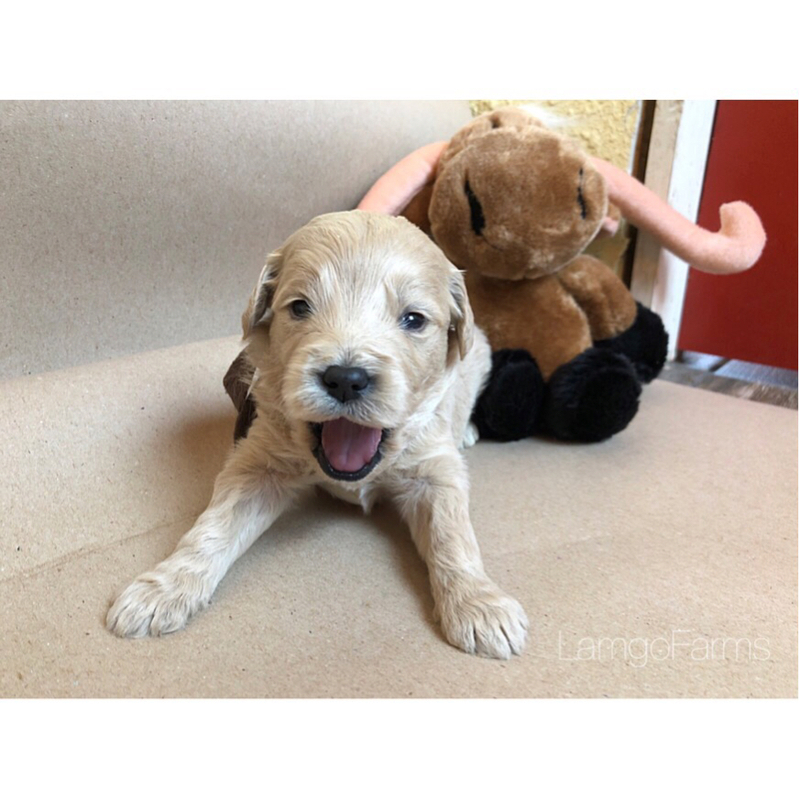 English Golden Sheepies are a mixture of our AKC Registered English Creme Golden Retriever Dam and our AKC Registered Old English Sheep Dog Sire. 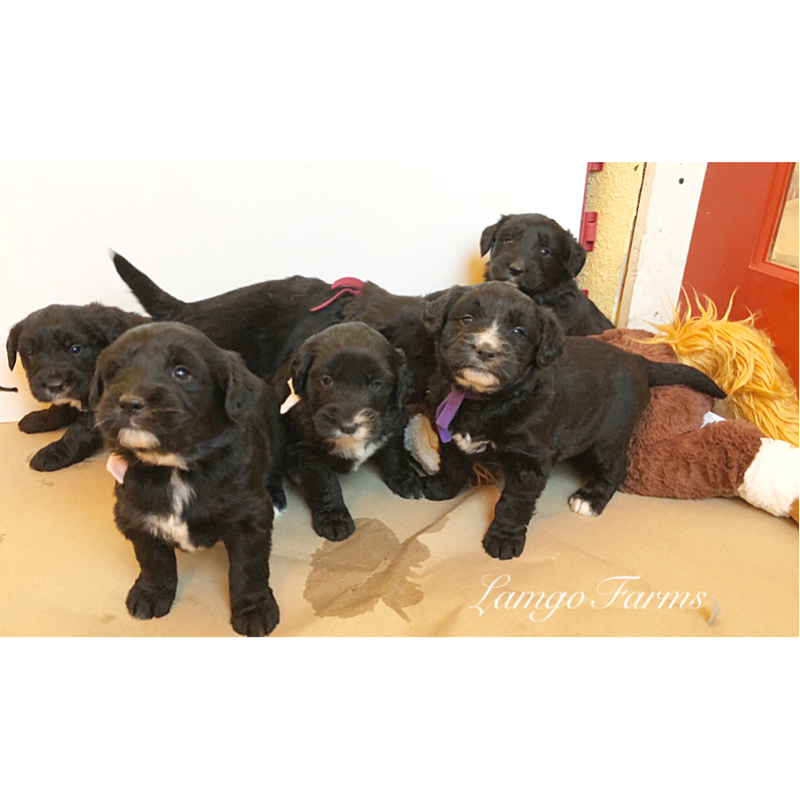 This is a first litter, so we do not have past puppy pictures, but a few links to a few Instagram pages for you to see what one of these beauties looks like fully mature. 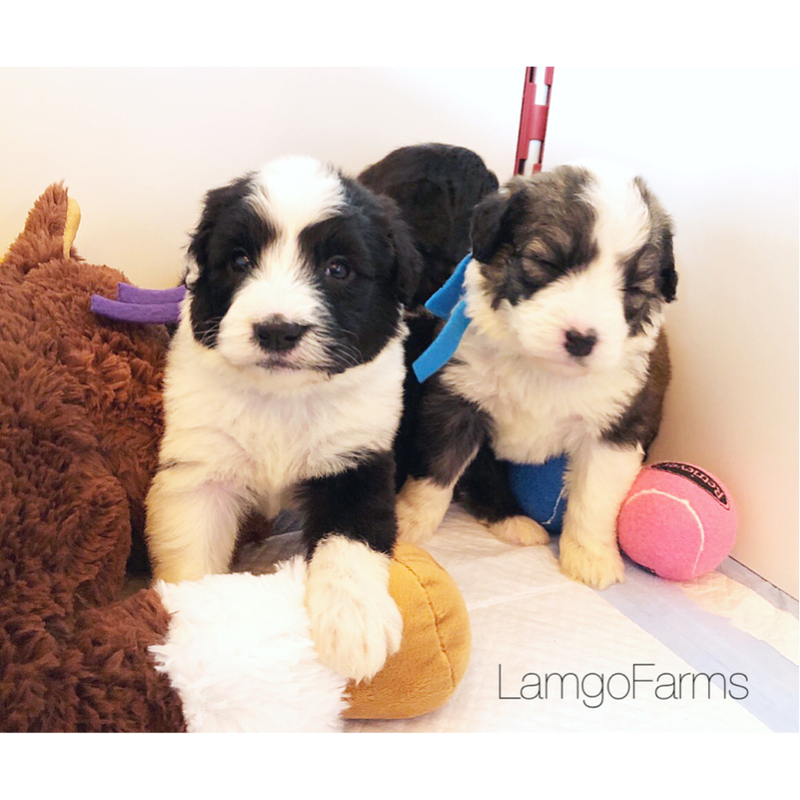 They are black and white and will have the coat of a Sheepdog with the facial features of a retriever. 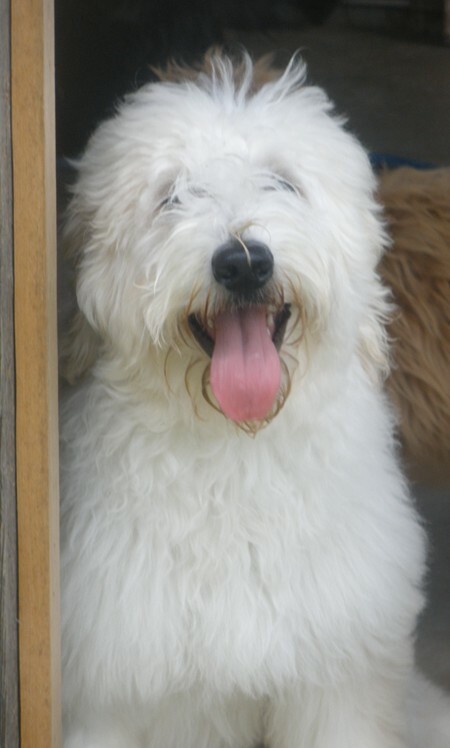 Old English Sheep dogs shed lightly when brushed well. Brushing limits shedding greatly. The Retriever part will shed a lot. We have learned that brushing this particular mix does help with shedding greatly. But bear in mind, there will be a certain amount of shedding. Golden Sheepies are know to be incredibly docile, brilliant, obedient, easy to train, laid back with a longevity of approximately 18 years. 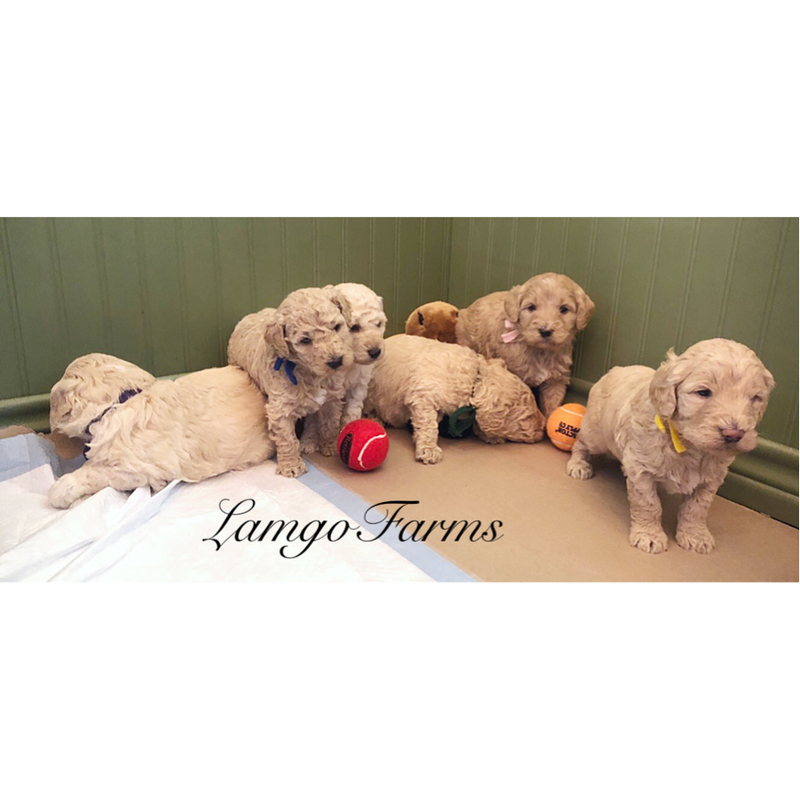 Lamgo Farms is keeping the first pick of the litter. For pricing, please scroll to the FAQ section. 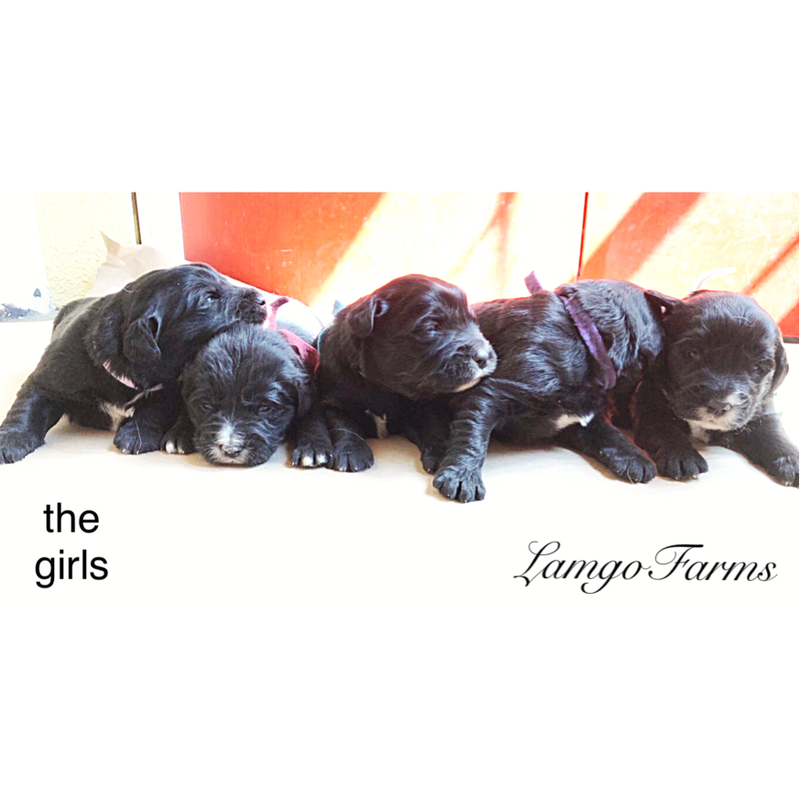 The girls’ collar colors are: Bright Blue, Light Pink, Purple, White, and Burgundy. 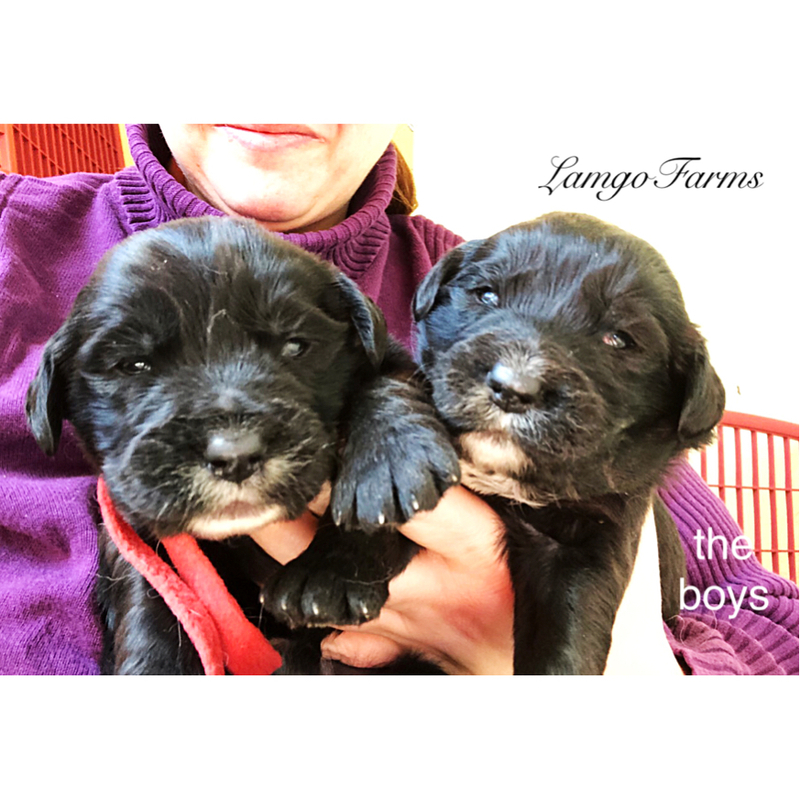 The boy’s collar colors are lime green and red. Well, the time has come! Puppies are ready to go home! 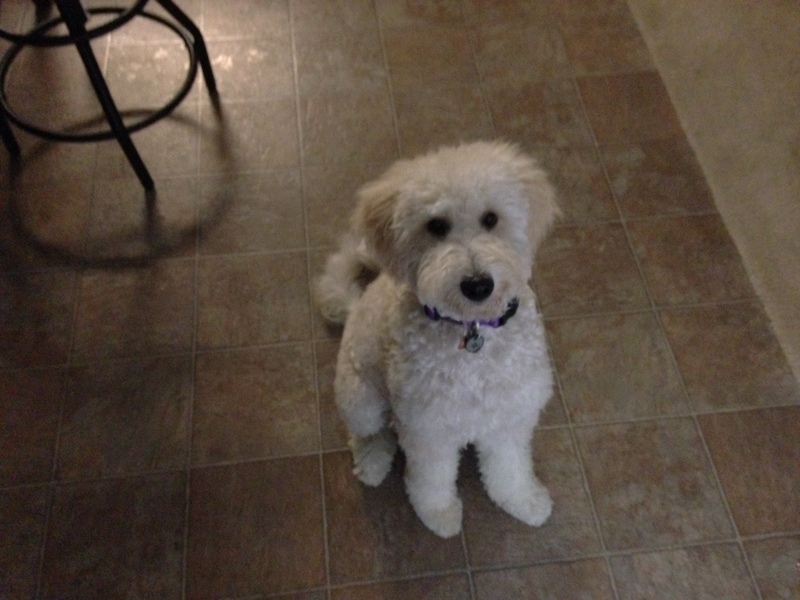 We have been crate training and working on our “sit” and “come” commands. Everyone is doing great! 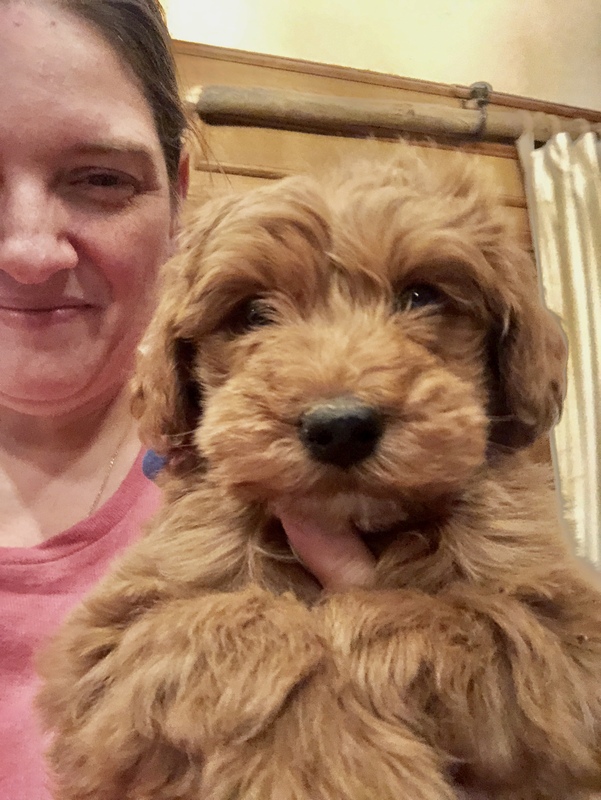 We still have a few that take a good 5 minutes to settle in the crates- but that is pretty good considering we have so many crate training at one time. Everyone should have received directions, picking instructions, pick up instructions, an invoice, and reading material. If you have not yet received any of these, please let me know! A few notes: When coming to the farm, you will turn right up at the house and come to the yellow building with the porch. There are signs. If you go to the house, you will simply hear a lot of barking and a bunch of pants less kids screaming for someone to get the door. 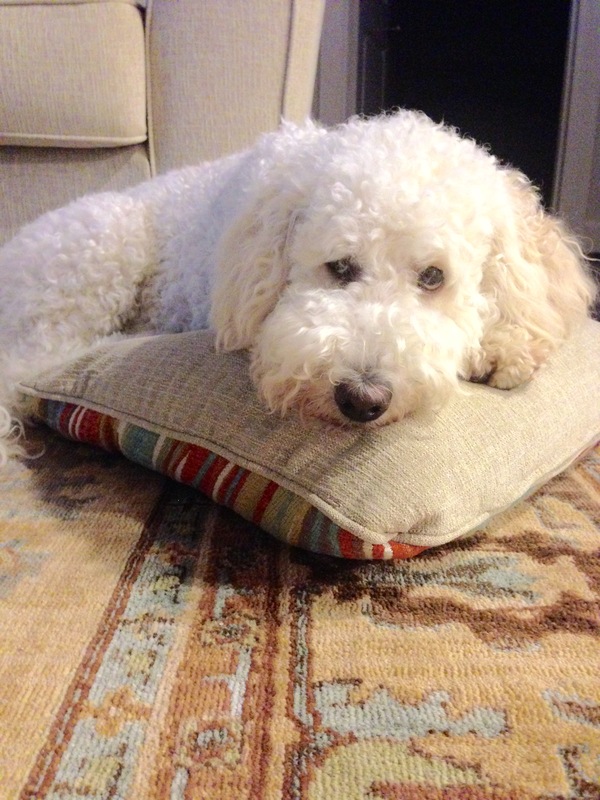 Addendums for extended warranties will be printed out and in your puppy packet. 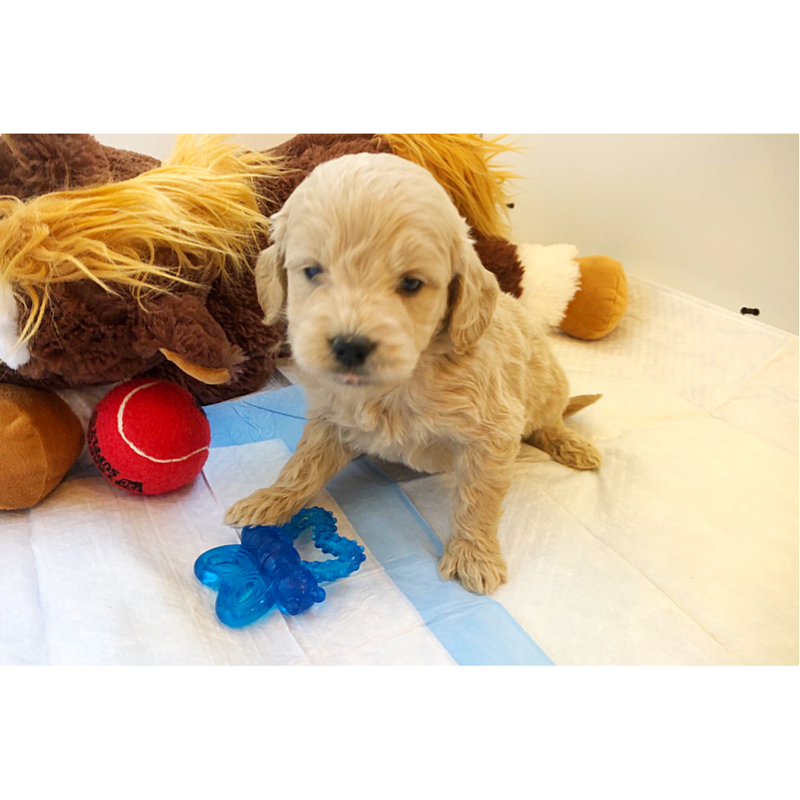 This will extend your time needing to visit the vet from 3 days to when the puppies are 9 weeks old. The puppies all had a vet visit yesterday- so they are doing great. For those traveling- please take a look at the weather tonight. There is some severe weather out in east Texas predicted for tomorrow. For those traveling locally- drive safely! We will all have much grace for timing tomorrow so please do not rush and get in an accident. If it is raining- the mommas and daddy dogs will be put up inside. So sorry about that. I know people do love watching them all rush through the green grass with the wind blowing those long coats. 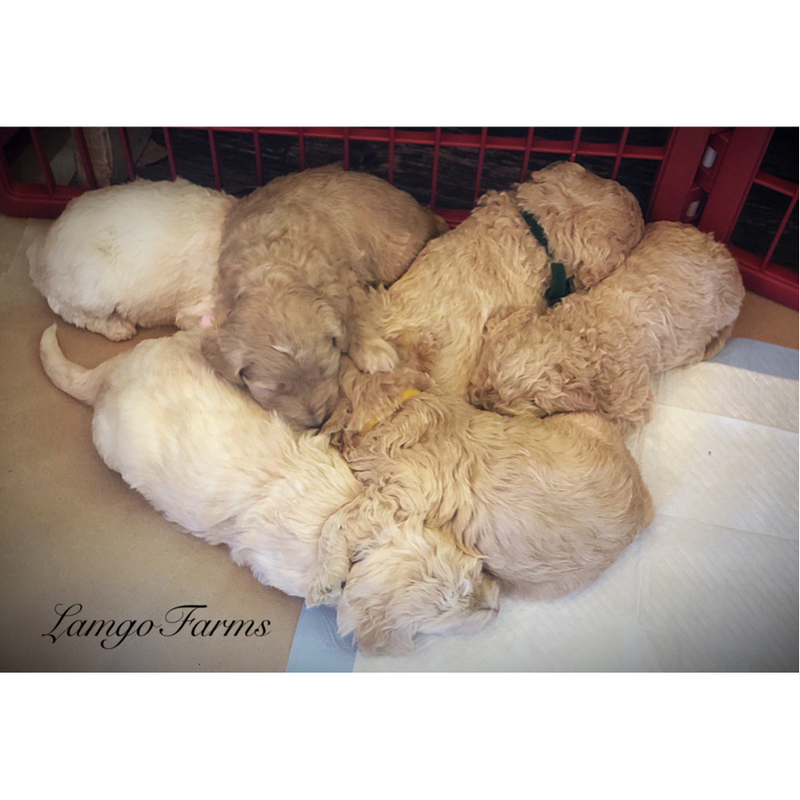 There is ONE little Burton F1 mini English Goldendoodle in this litter. I’ll try to get some video this week! 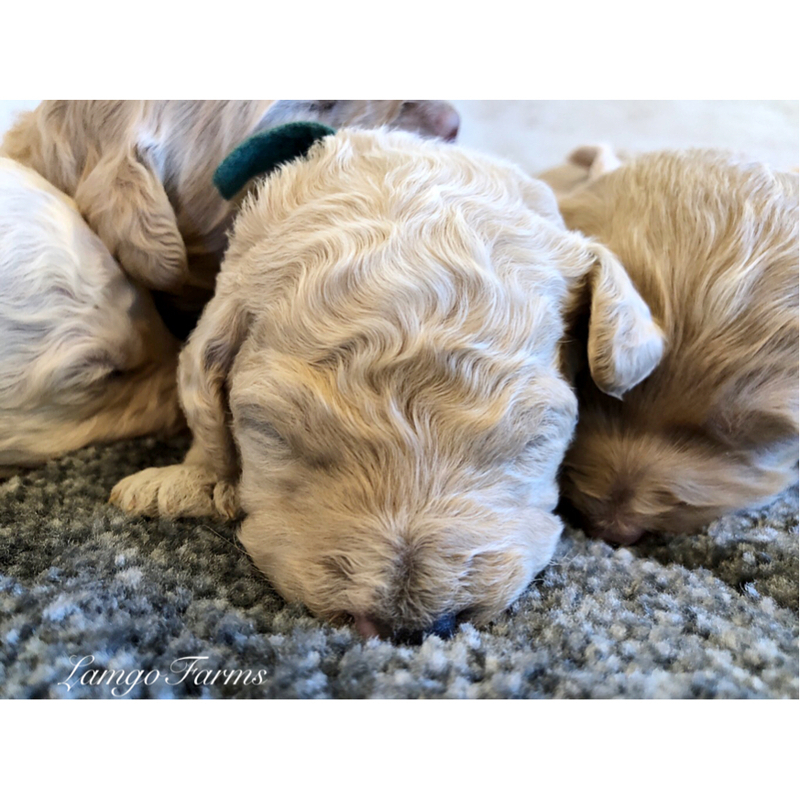 These puppies are cream, apricot and peanut butter color with mostly curly and some wavy coats. 30-45 lbs. Average is below 40 lbs. 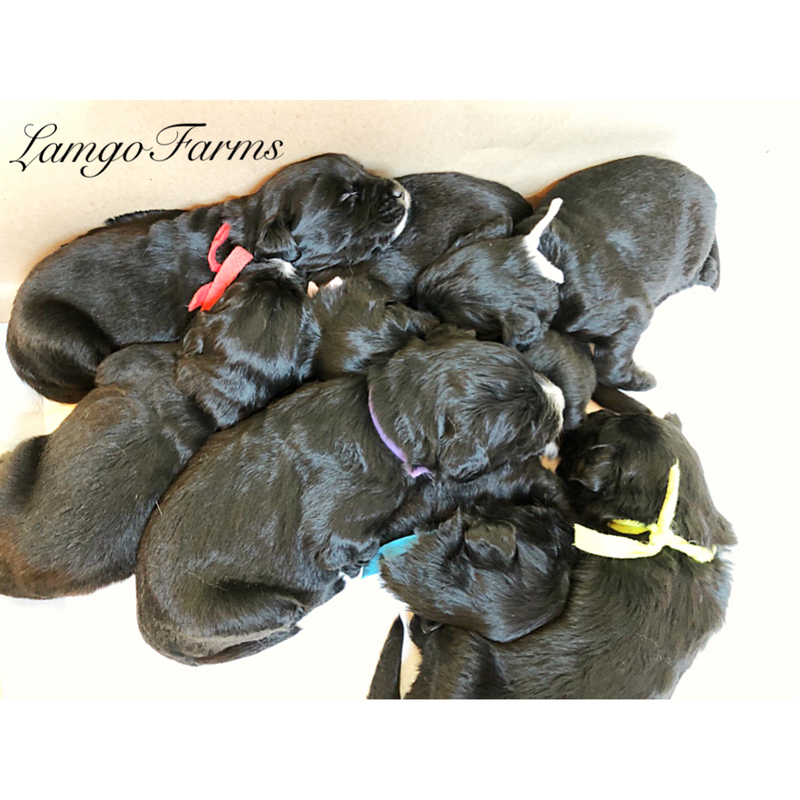 The girls’ collar colors are purple and light pink. The light pink almost looks white in pictures. 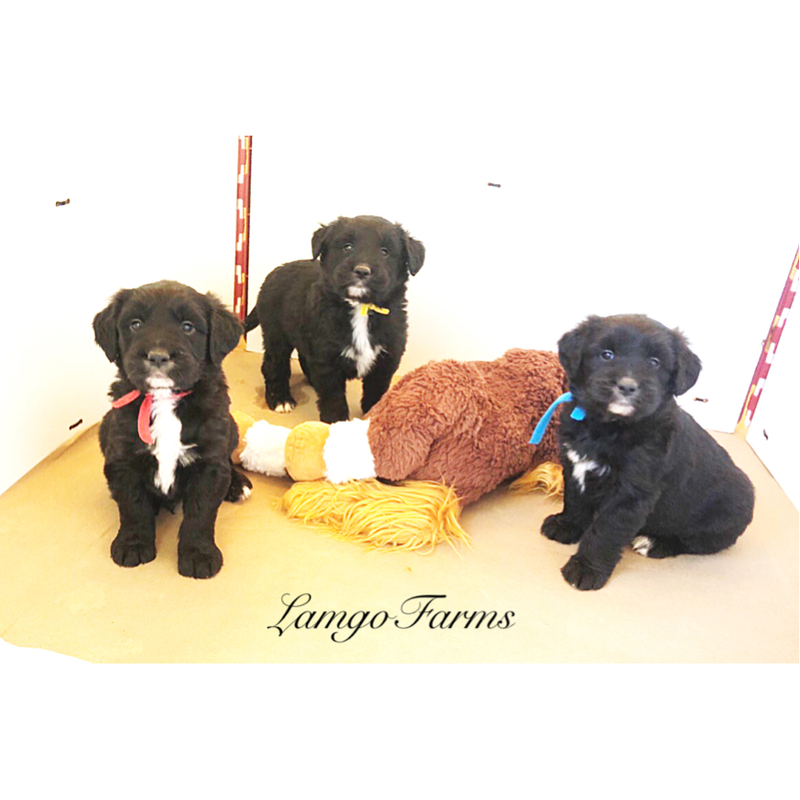 The boys’ collar colors are yellow, dark blue, red and green. Picking/Pick up is scheduled on the same day on Saturday, April 13. The puppies are growing and just so chunky and cute! Right now they are being introduced to their kennels with the help of a buddy. This way they are not stressed and can calmly get use to their kennels for the first time. We will then move them to being by themselves before they go home. 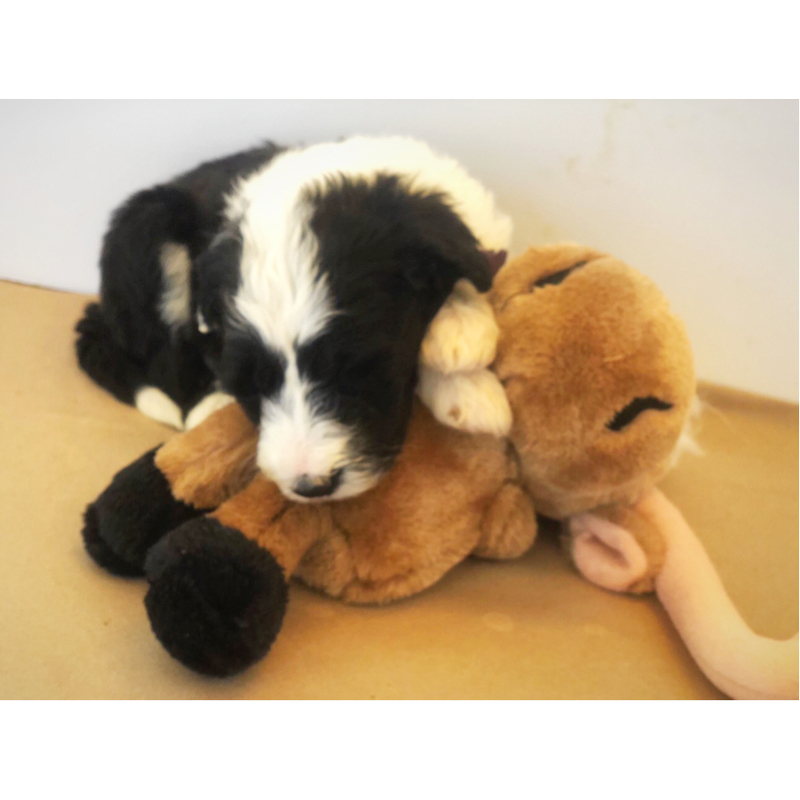 Your puppy will go home with a travel crate which is perfect for trips to the vet and for sleeping that first week home. They will soon need a larger wire crate. Check your supply list for recommendations on sizes and types of crates. If you need another one emailed- just let me know. You can always text me at 817-366-7995. I’m just not always available to answer the phone. This next week the puppies will continue with crate/potty training, a few commands and will be getting ready to go home. 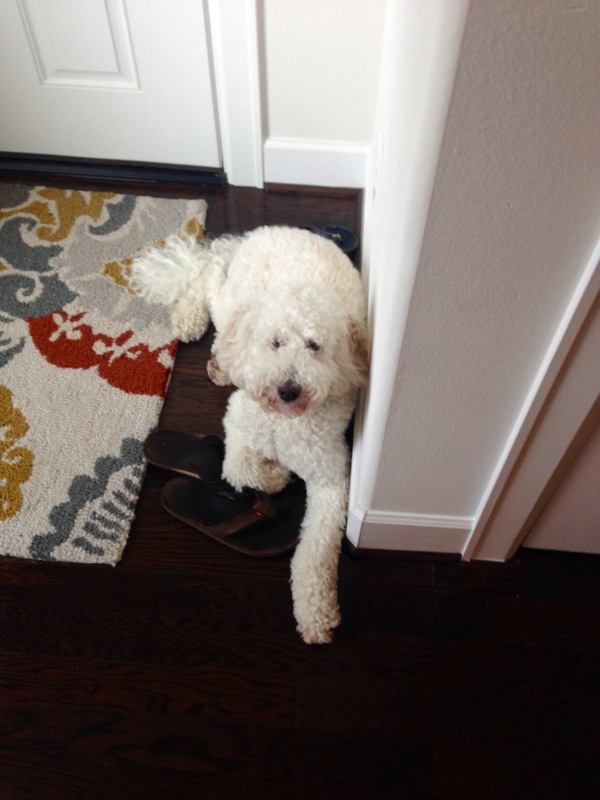 You should have received emails with temperament testing results and puppy picking instructions. Next I will be emailing your Reading material, puppy packet contents and just what to do to prepare for your travels home. 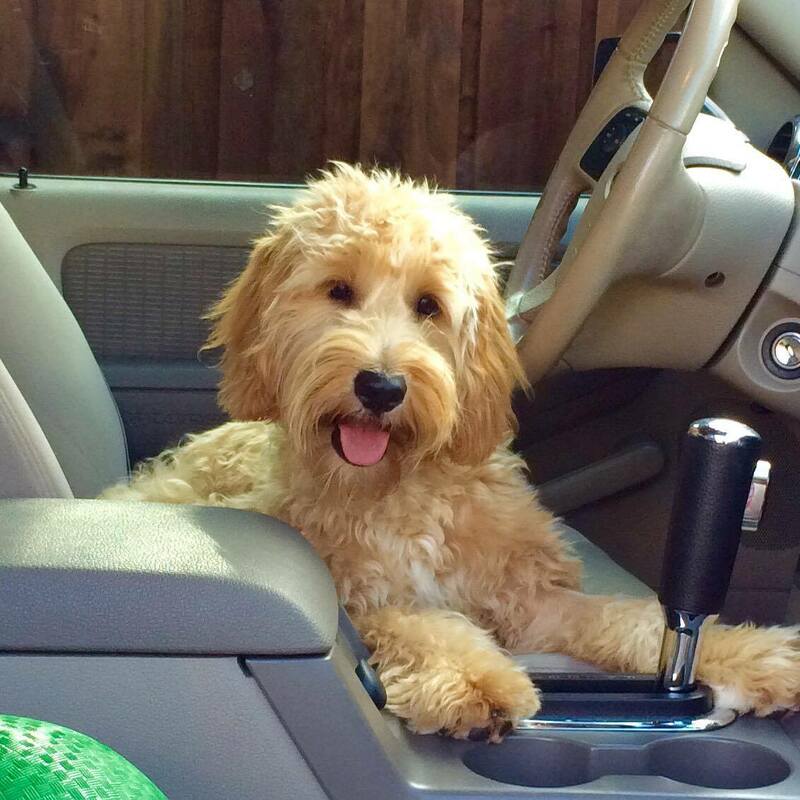 This way, you can see ahead of time just what is going home with your puppy. Invoices will be emailed this weekend. You can follow the instructions and let me know if you have questions. This next week the Vet will be out to look over each puppy and will complete a health form. 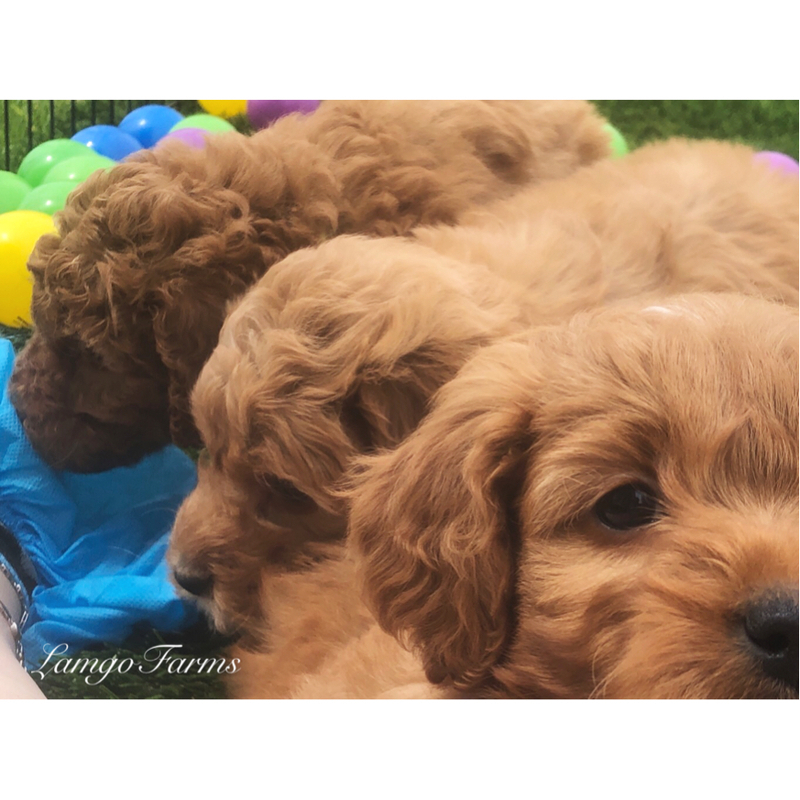 Puppy Picking/Pick up: April 20 and 27th. Lina has a prenatal X-ray scheduled for Tuesday! I’ll let everyone know how it goes! I have set her due date at April 28. 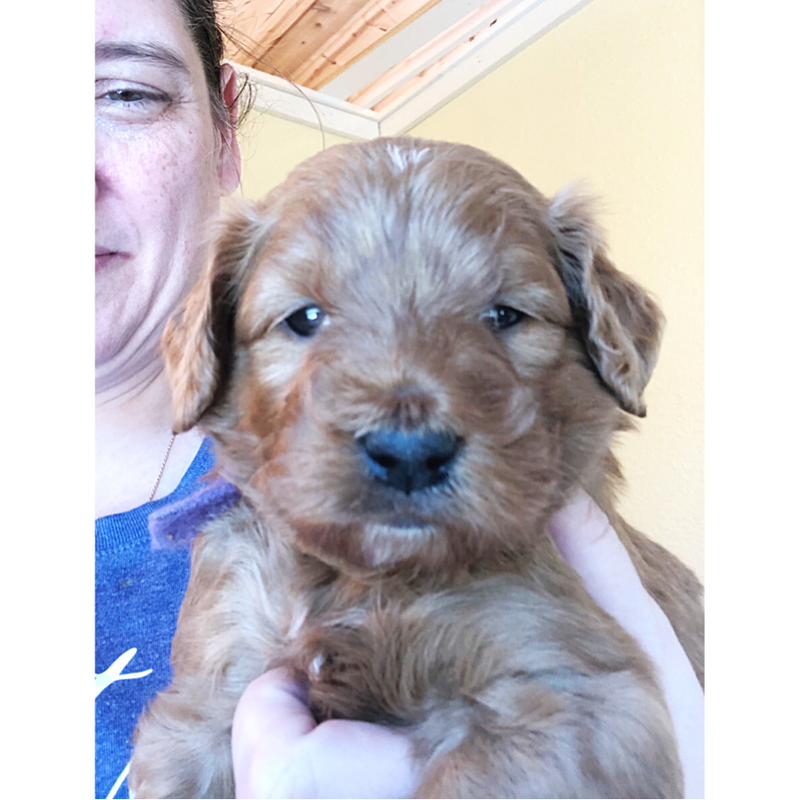 Puppies should go home around June 22nd. For those who will be on vacation during that time, please consider www.HiltonButler.com for boarding and puppy training. 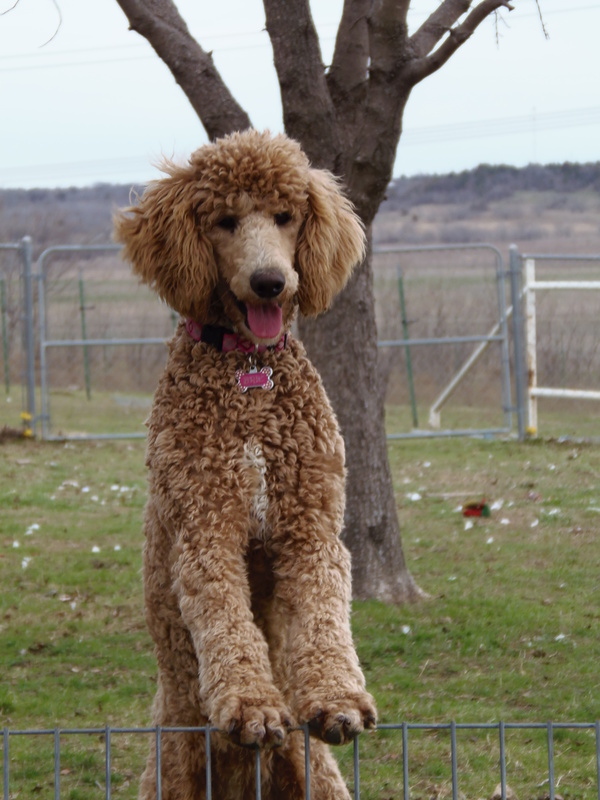 Lina is our White Standard Poodle and Paddington is our red F1b Mini Goldendoodle (parents are Mrs. Beasley/Mr. Bean). 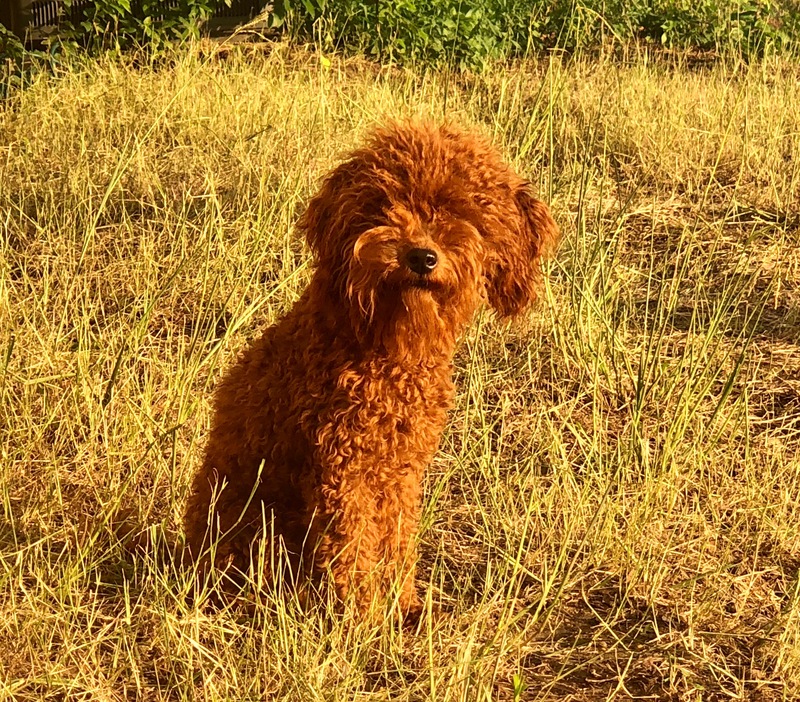 Puppies have both a curly and wavy coat and are usually a cream or peanut butter color. They mature between 40-55 lbs. 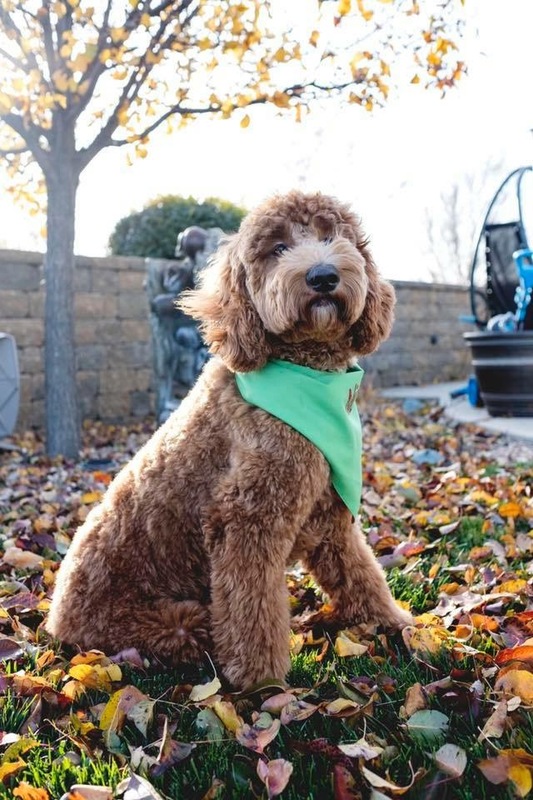 Next cycle should be in April 2019 with puppies going home around August 2019. 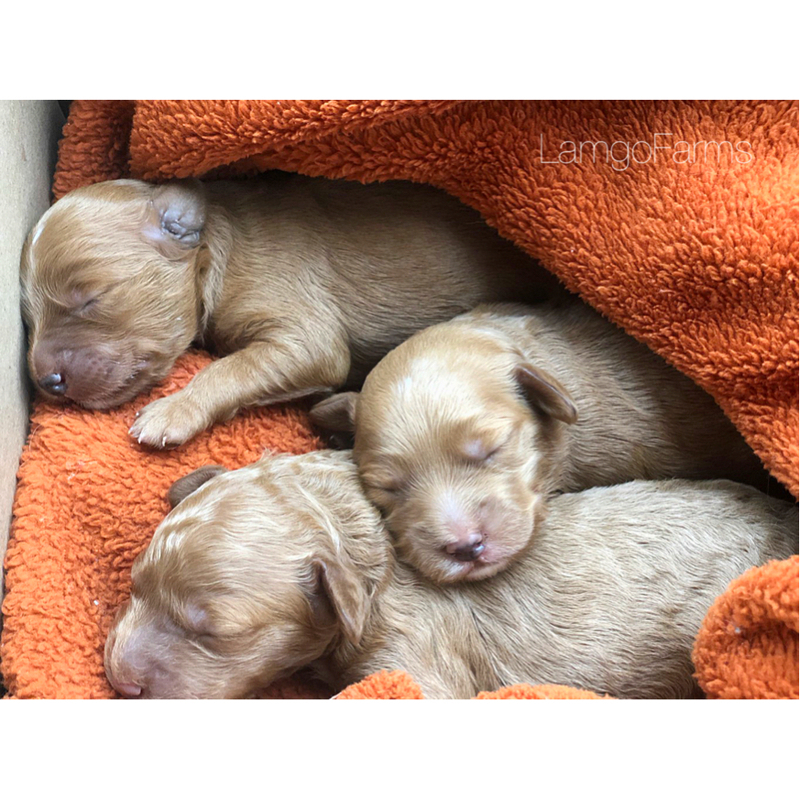 These puppies are usually a peanut butter coloring and have wavy coats. They mature between 27-37 lbs. 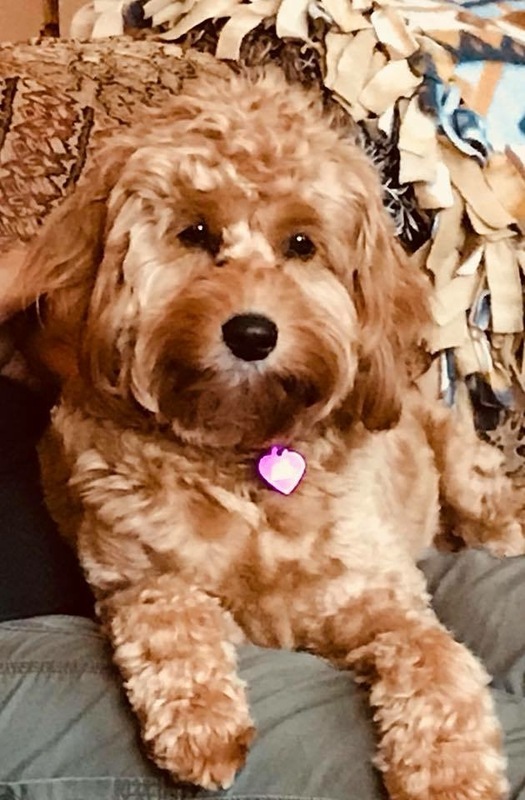 Lilly will be breeding around June with puppies going home between October and November 2019. 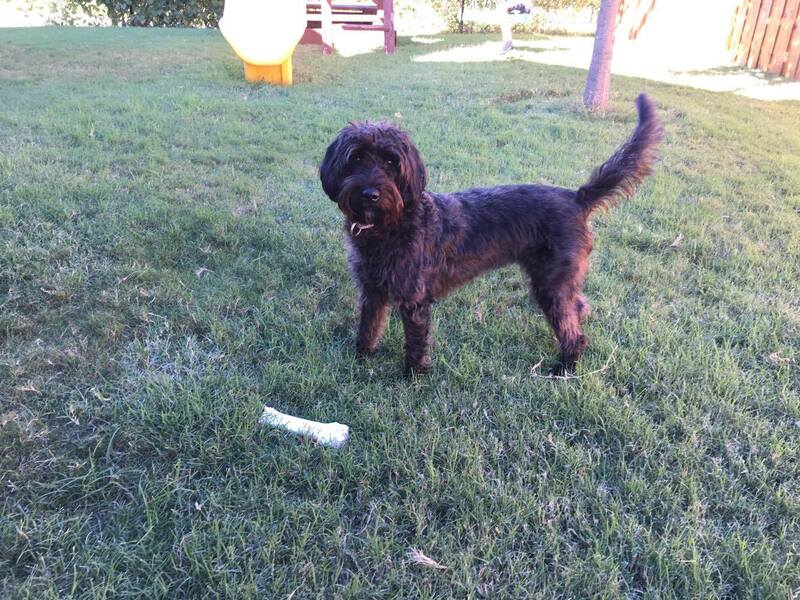 Colors are medium red with some white markings. Jasmine has been paired with our new little “Beans.” Not to be confused with our retired, Mr. Bean. 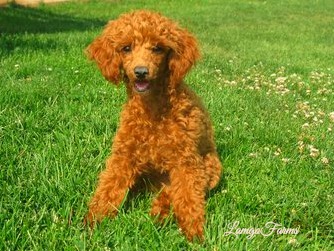 Beans is a miniature dark red poodle. Because Jasmine is a wavy coat- we are using Beans to make sure we have the desired coats and colors. We do expect mostly wavy coats in this breeding. I’m so excited to see these puppies! Both Jasmine aka “Red” and Beans are dark reds. Jasmine had a singleton for her last litter. So we are transferring many from that list onto this new one and any open spots will be reserved for her next breeding. Not to worry- she will still have a late FALL cycle. Expected to breed in August 2019. 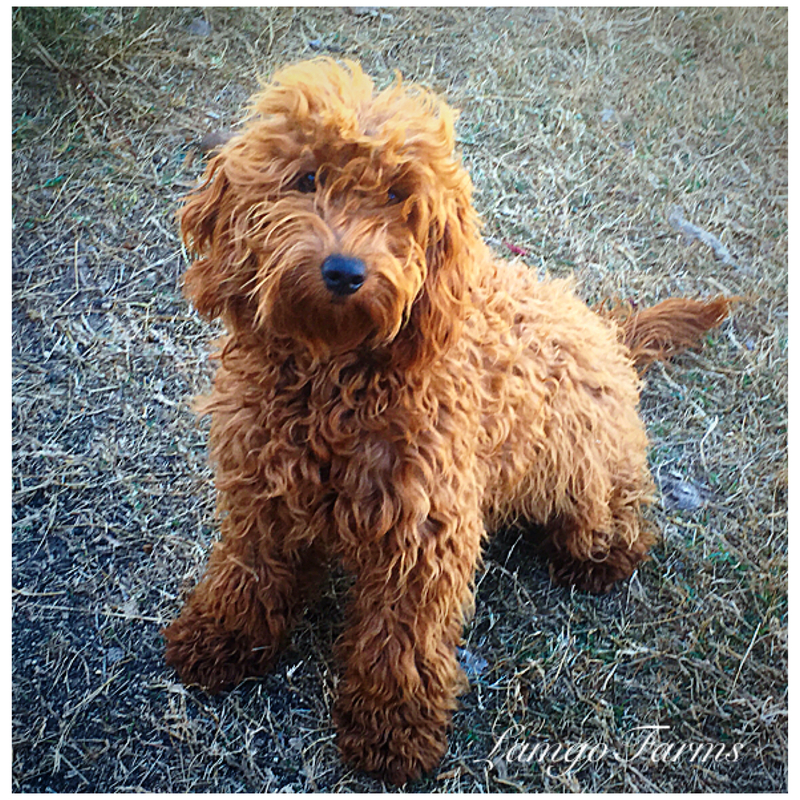 A Double doodle is the cross between our mini Chocolate Labradoodle and our Red Mini Goldendoodle. The coat is thinner and tends to have a cotton or wire texture. 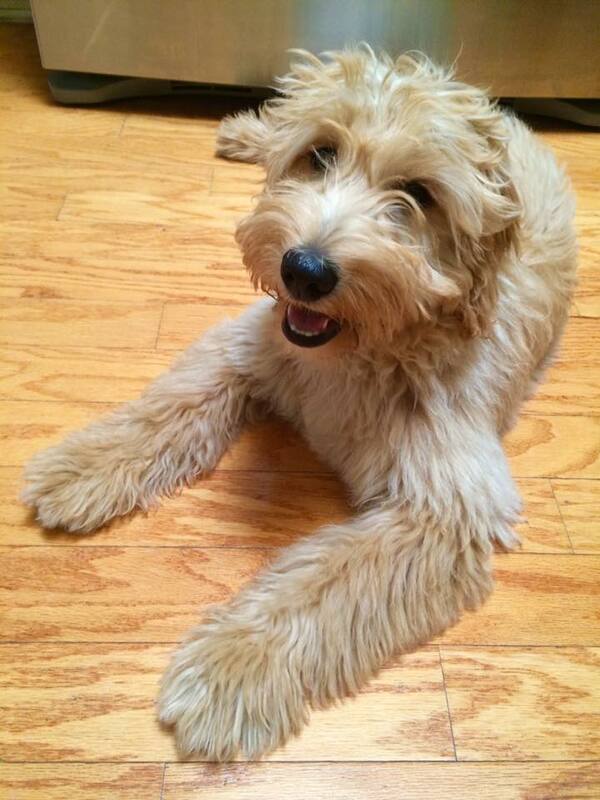 Puppies tend to have more of a Labradoodle coat. 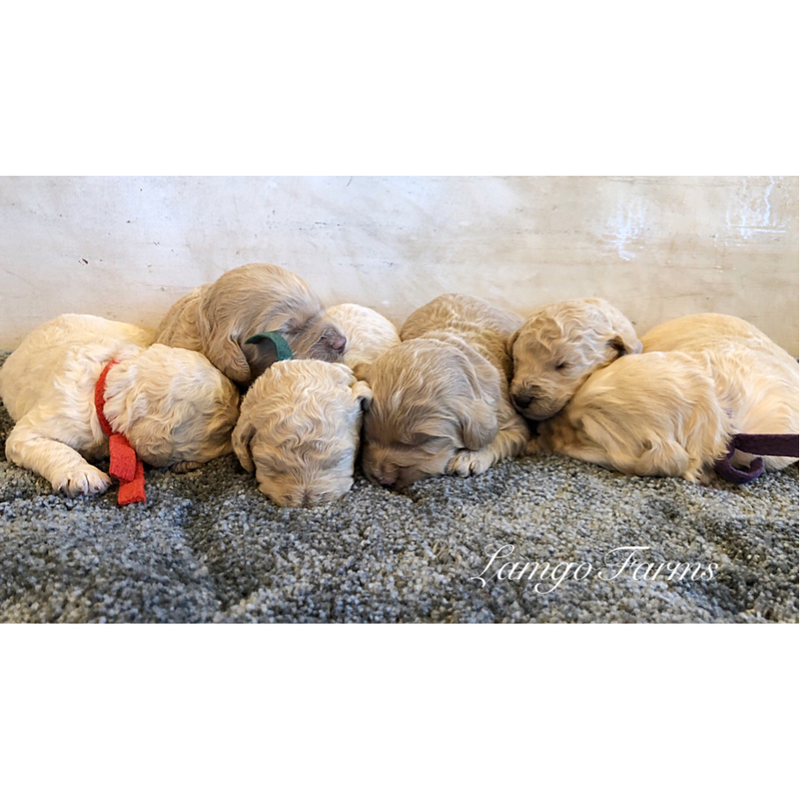 (Fall 2019)- Breeding October-FALL 2019. Most likely Christmas puppies. We will know more on dates after her next cycle is complete. If she has plenty of puppies in her cycle prior to this, first available will be made to those on this list. At this time, I’m closing this list for further deposits until after our Spring breeding is complete. Boston’s pregnancy has been confirmed! Congratulations! These are petites. They will be smaller than our miniatures but a tad larger than our pockets. If pregnant- puppies will be due around May 10 with puppies going home mid July. For those double listed- you can stay on both of your lists until puppies are a week old. Then we’ll ask you to choose your litter. Bella’s last insemination did not stick. So we are breeding her on her next cycle which should be in June 2019. 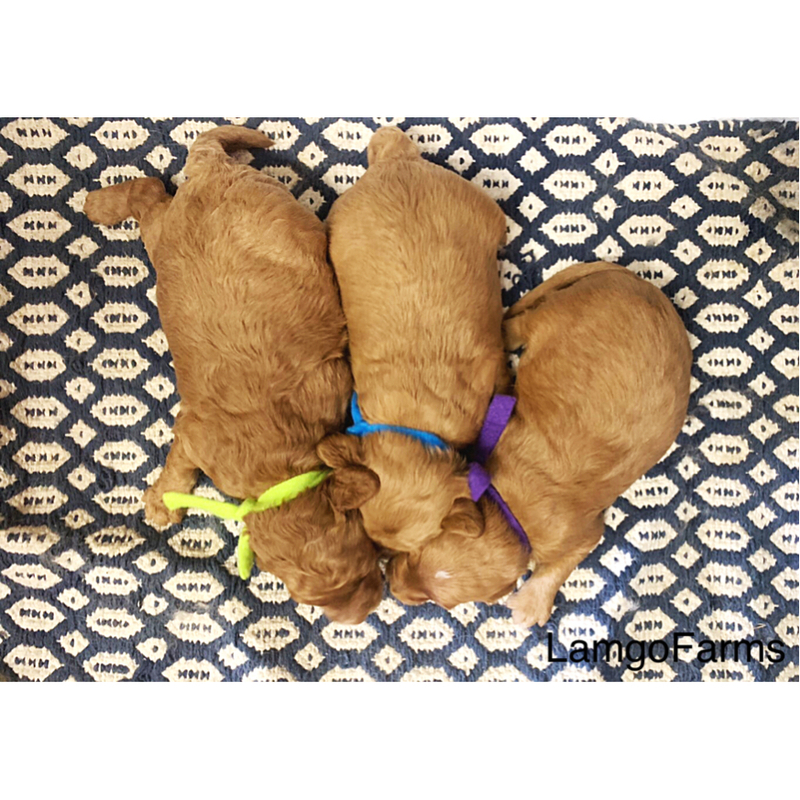 Puppies should go home around October 2019. First spots are reserved for those on her previous list. Past Puppy Pictures. 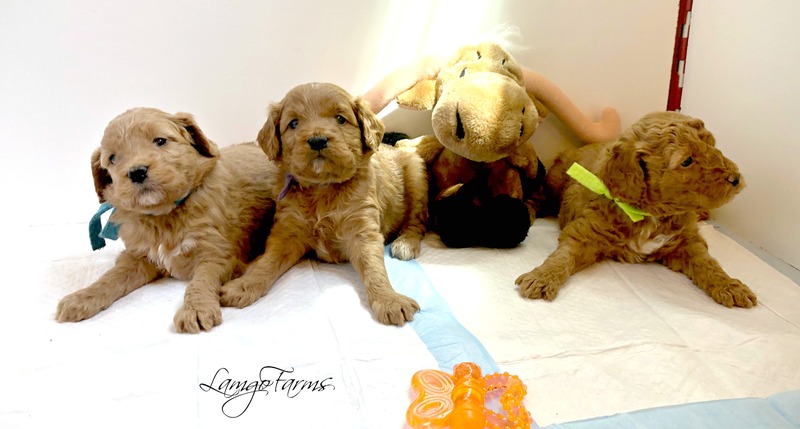 . .
Parker’s F1bb Pocket Goldendoodles – Breeding again early Summer 2019. Parker will be bred to Beans or one of our F1b Pockets. We have now retired Squishy. Parker has just completed her Spring cycle. We will breed the next which should be in August, making puppies going home around Christmas. Cream, white, apricot and peanut butter coloring. Wavy coats (one or two curly fleece possible). 25-35 lbs. 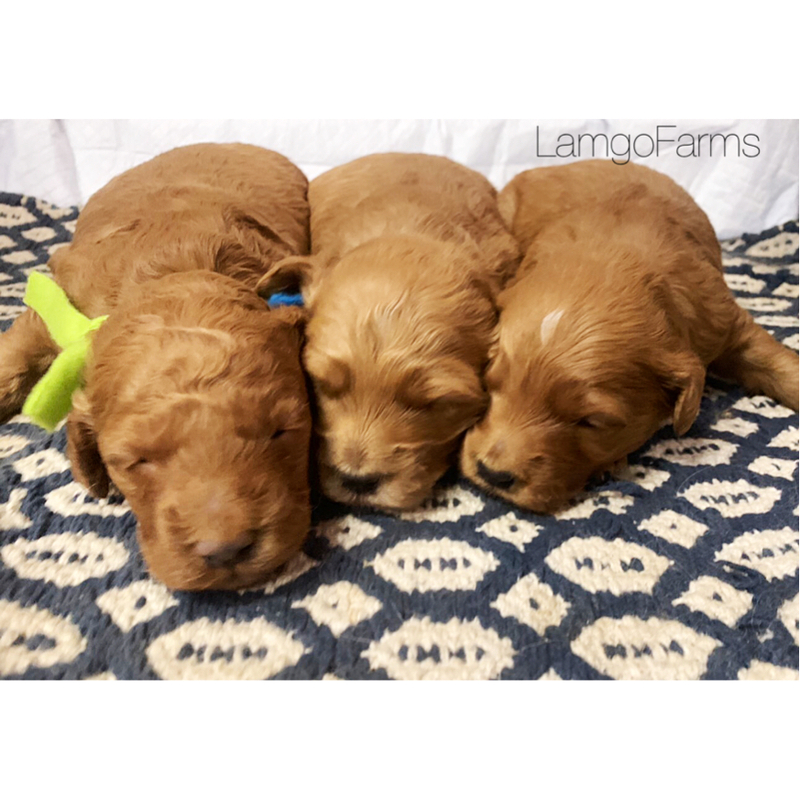 Next breeding will be around August 2019 with puppies going home between Thanksgiving and Christmas 2019. What breedings to you have coming up? Please scroll back Up for current and upcoming litters (scroll down for more future litters) to the “Next Season’s Breeding Schedule” to see what will be bred and what picking spots are open. How do I reserve a picking spot? 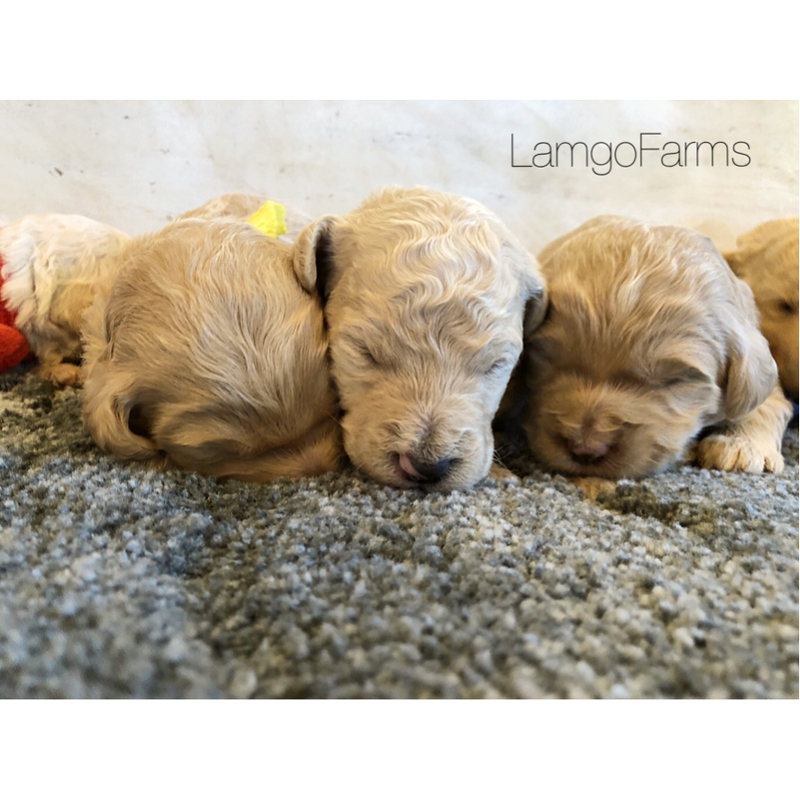 Email me at goldendoodles@lamgofarms.com with “deposit” in the subject line. Note which litter and number on the picking spot you prefer that is listed as open. 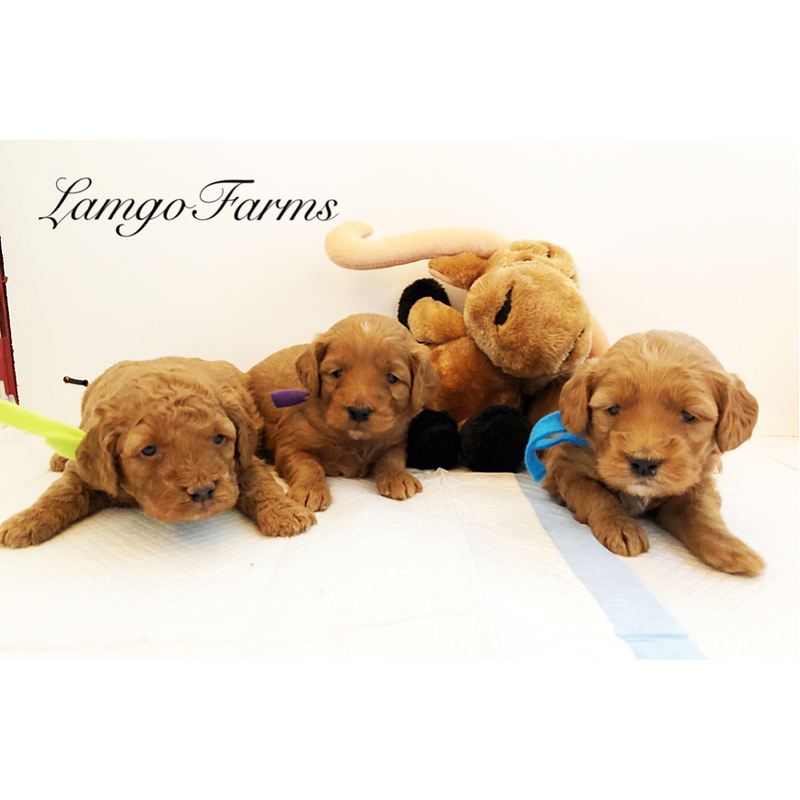 Include your name, mailing address, phone number and any preferences you may have for your puppy. 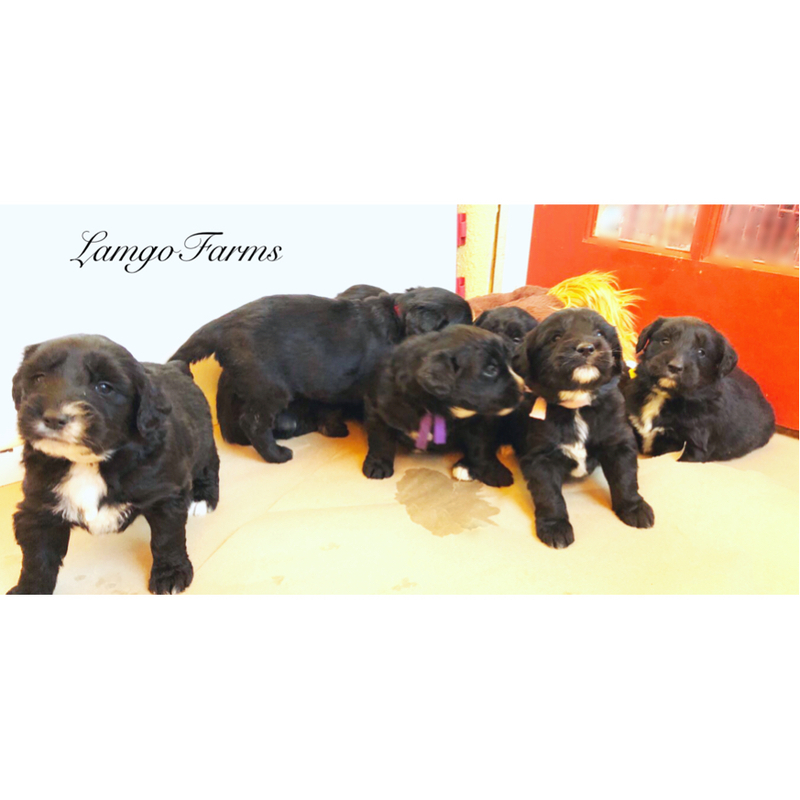 Then go to our pricing/payment page at LamgoFarms.com to place your deposit of $250. There is a $5 PayPal processing fee that will be added to your total. Are Deposits refundable? Unfortunately, due to the high demand of our puppies, we no longer refund deposits. 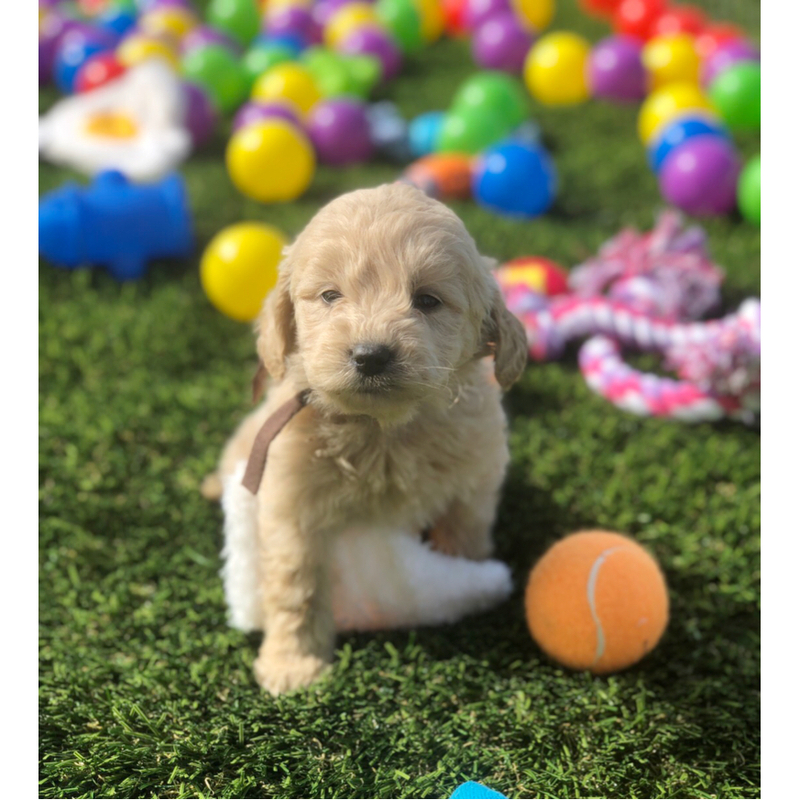 If for some reason we do not have enough puppies born to provide for every owner- your deposit can be transferred to your next desired litter. The $250 is a picking spot reservation. This also helps us weed out those who are not serious about taking home one of our puppies. 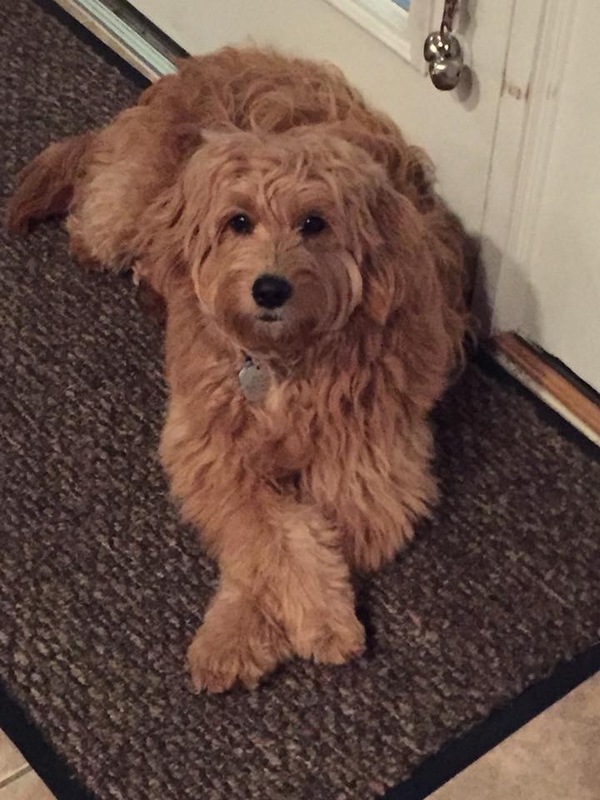 Do you have any paperwork we need to complete? 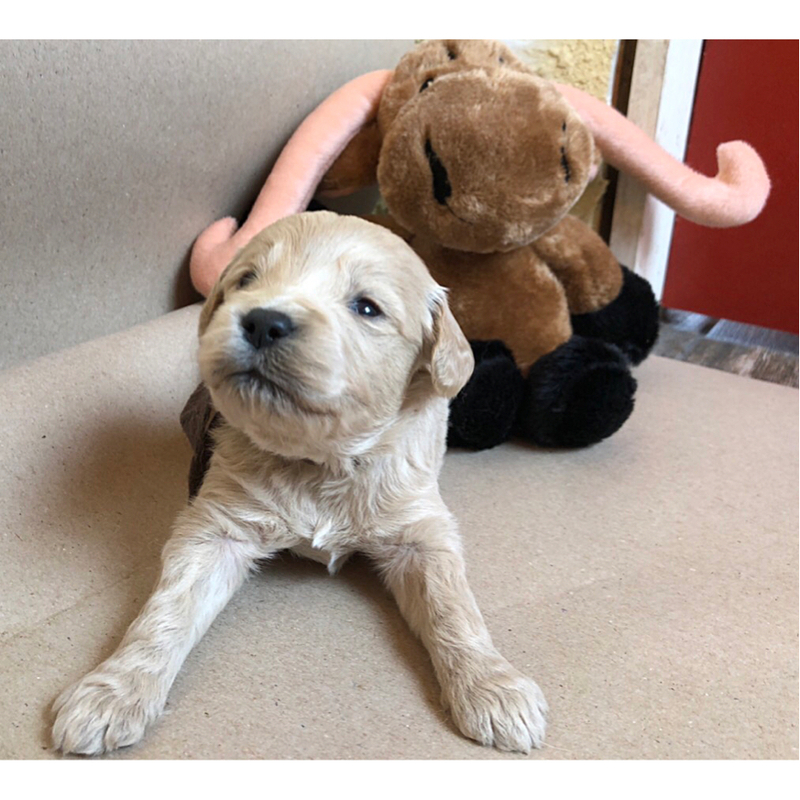 Since our puppies are Reserved almost a year in advance- we will spend that time getting to know each of you and will be offering the proper education to make sure you are fully prepared to bring home your puppy. When placing a deposit, please include your name, email address, mailing address, phone number and any preferences you may have. Once you place your deposit, I will email you your purchase contract which also serves as your receipt. You will need to sign and email this back to me. You will also receive a suggested supply list as well as our Health Warranty. 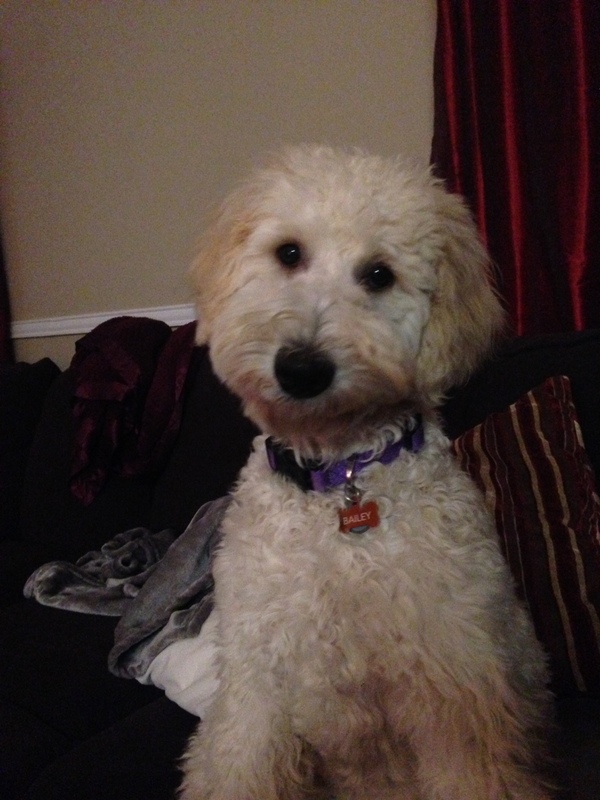 The Health Warranty is not due back until 30 days after you take your puppy home. Do you choose the puppy for us or can we choose our own puppy? 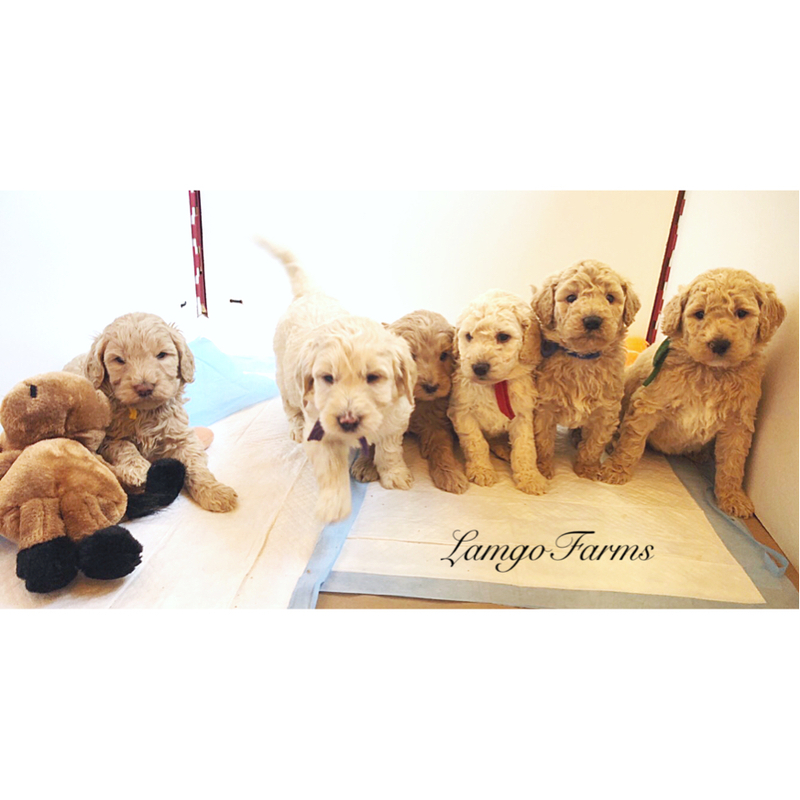 You will be asked to visit the Farm at your puppy picking appointment and will be given an hour to choose your puppy. The choice is yours. Please understand that we cannot guarantee gender availability. 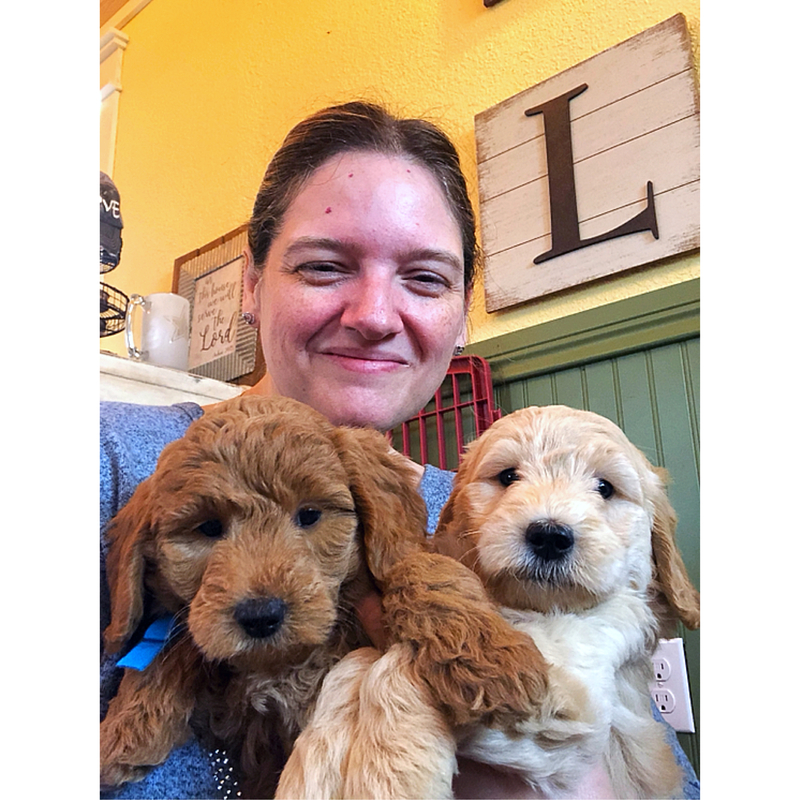 When it comes to our donated therapy/service dogs, we will choose the top two for you and then you can make your choice out of those. 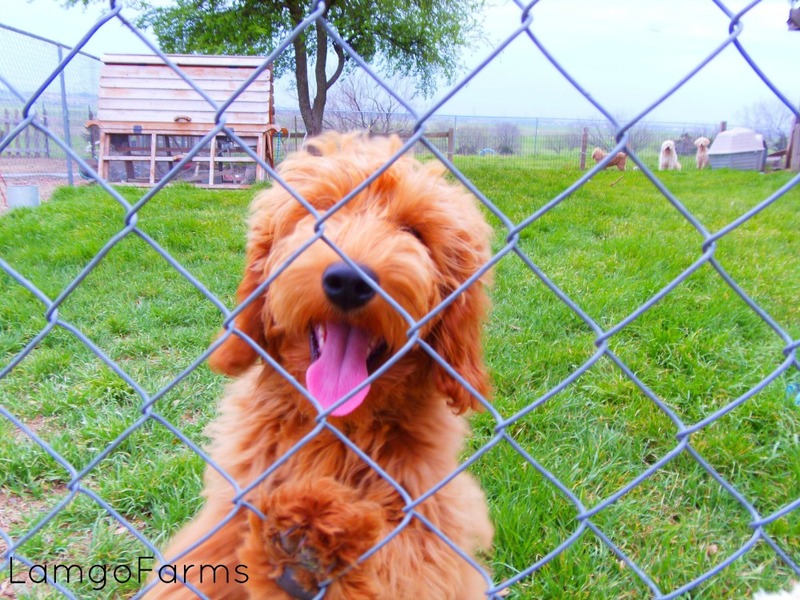 Can we visit Lamgo Farms for allergy testing or just to see the dogs? 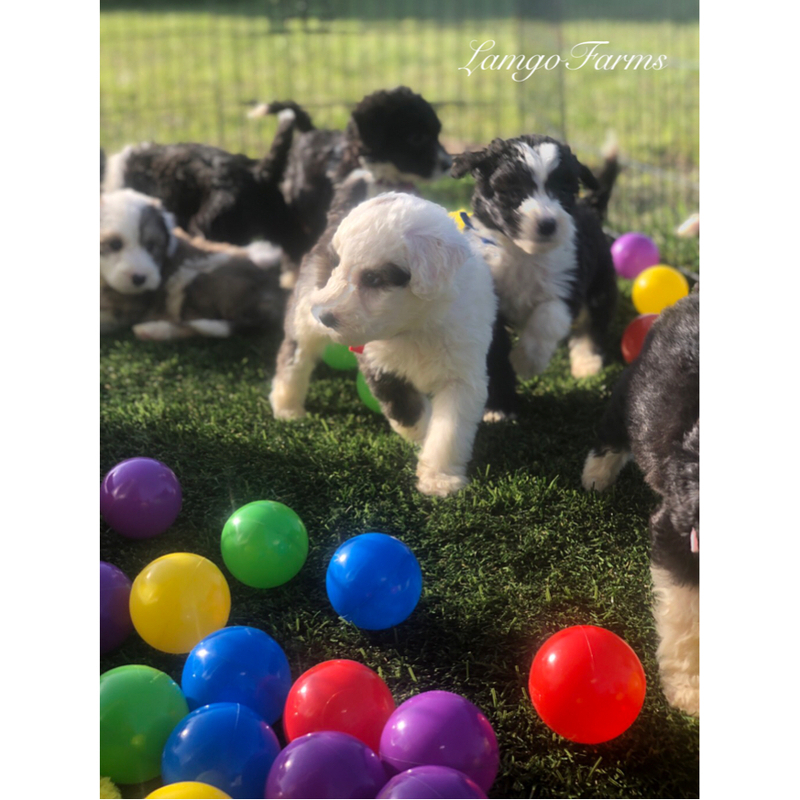 Every puppy owner that has placed a deposit is invited to the farm between weeks 5 and 6 for a puppy picking appointment. If unable to attend- we can send extra video and pictures or FaceTime the appointment. Unfortunately- we do not allow other visitors due to the health risk for our puppies and dogs as well as for the safety of our family. 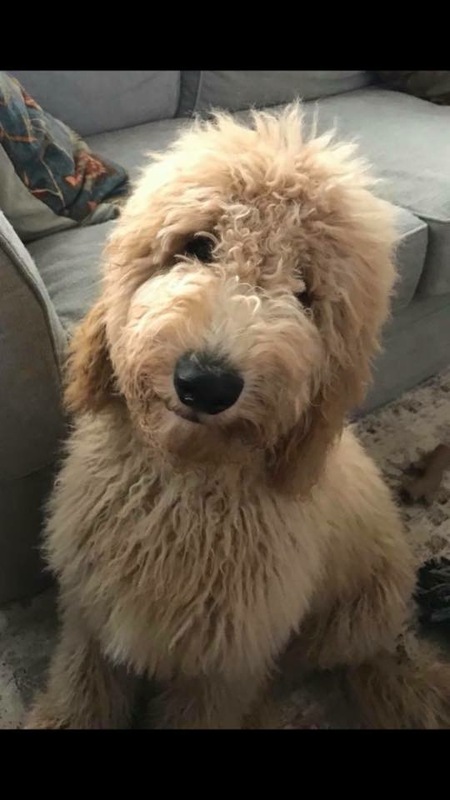 If you wish to have allergy testing- it’s best to find a doodle owner and see if you can tolerate that particular generation of doodle. We have several pictures, video as well as slide shows showing our grounds, parents and past puppies. 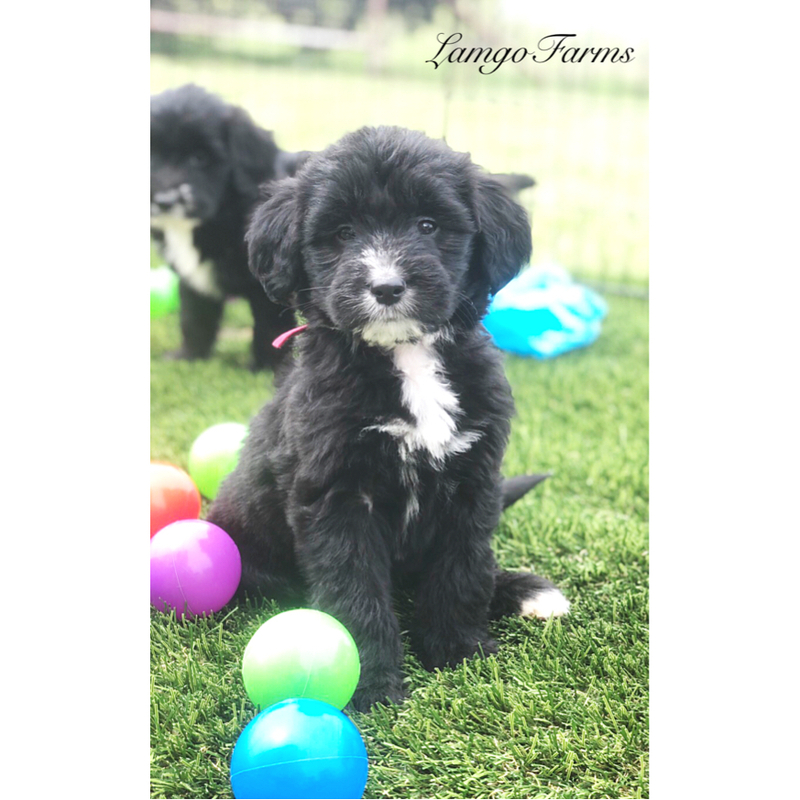 You may also visit our Facebook page and join our open forum to communicate with any of our past owners about their experience with Lamgo Farms. We welcome your questions! Do you do temperament testing? 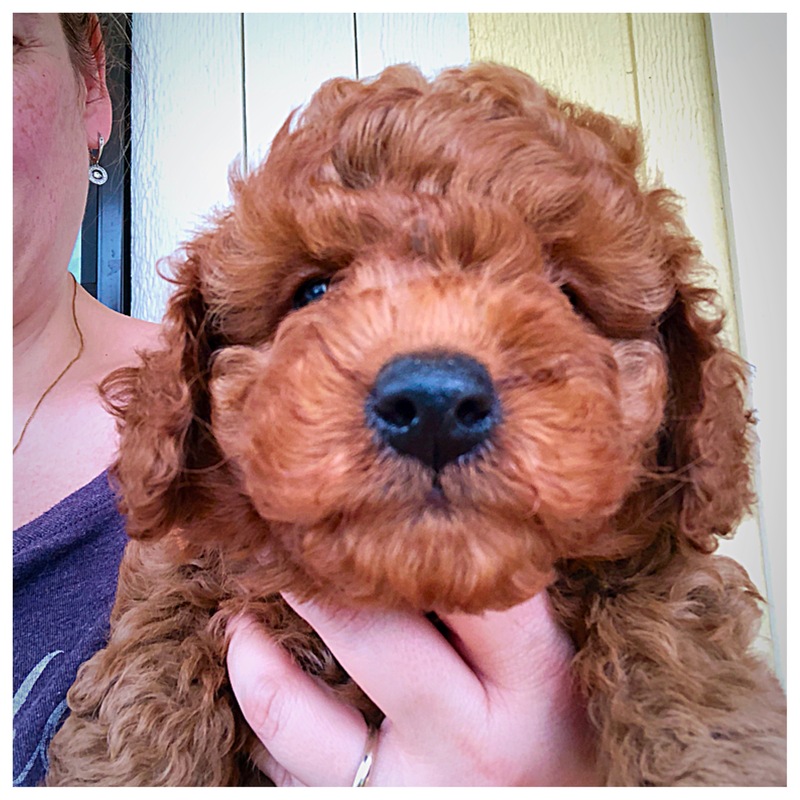 Yes, all puppies are tested at week 5 and the results are emailed prior to your puppy picking appointment. 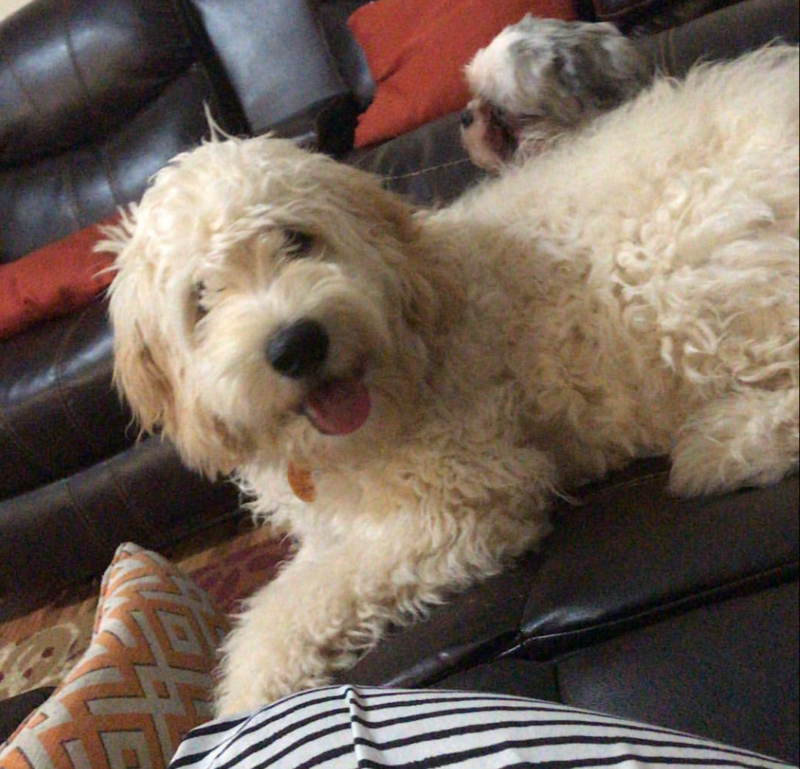 Do you take weekly pictures of your puppies? Yes, The first week is simply a group photo but individual pictures are taken weekly starting at week 2. Video is taken weekly starting at week 3 and concludes at week 7. 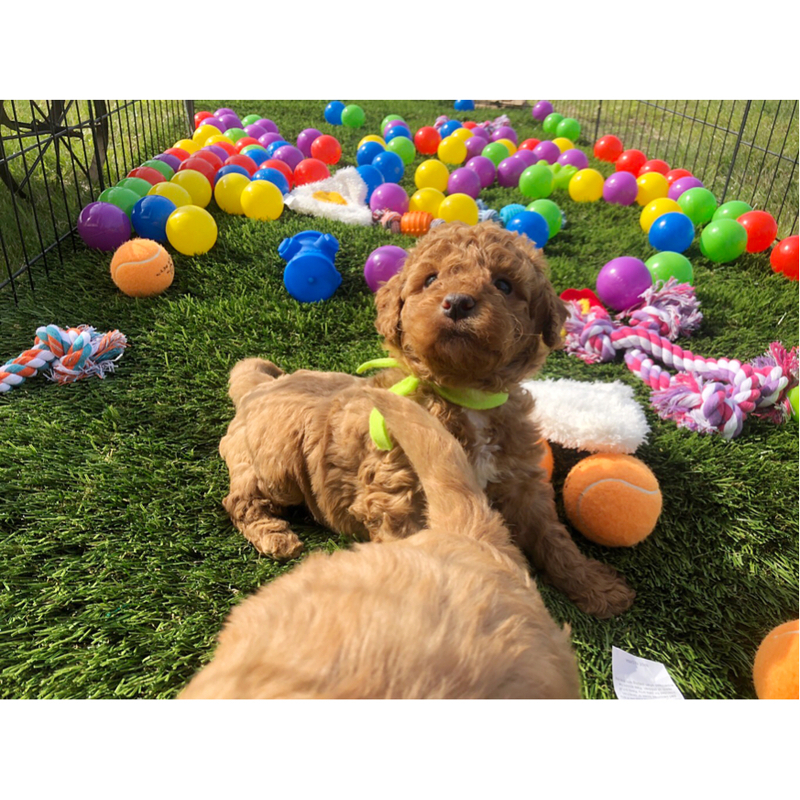 Are your puppies socialized? Yes! We now have 7 children. Ages 22, 18, 16, 14, 10, 2 and 16 months old. 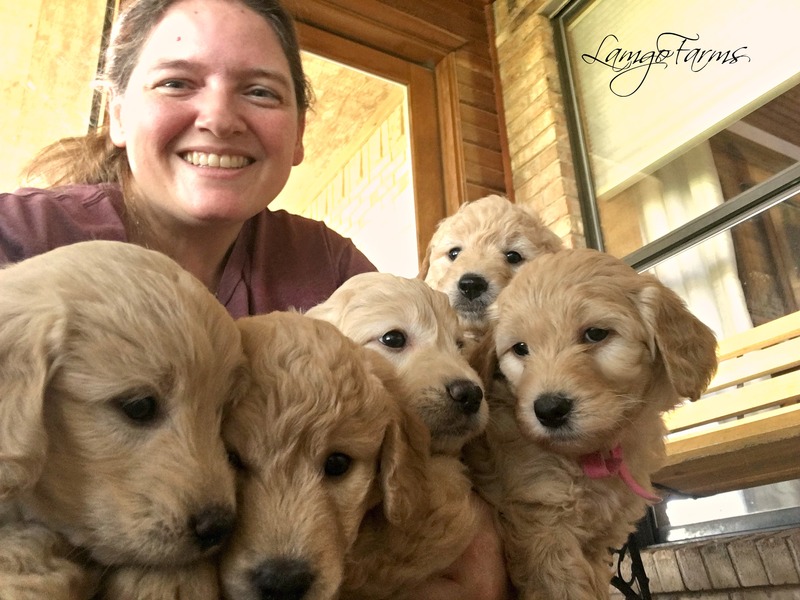 We homeschool and are able to hold, socialize using sensory stimulation as well as play with and cuddle your puppy several times a day which prepares them for any home environment. 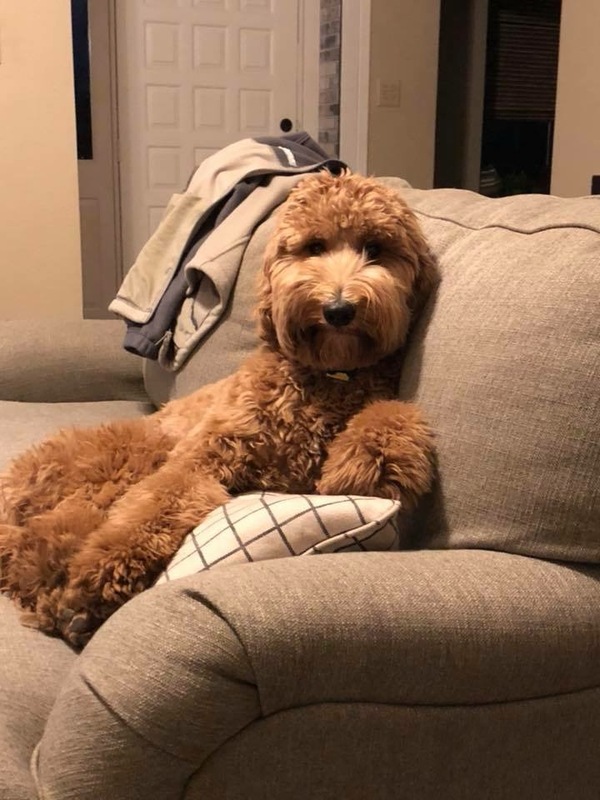 When do the puppies come home? Puppies are ready to go home on the Saturday between weeks 7 and 8. Do you have a Health Warranty? Yes, Lamgo Farms has a 1 year warranty over hips and eyes. 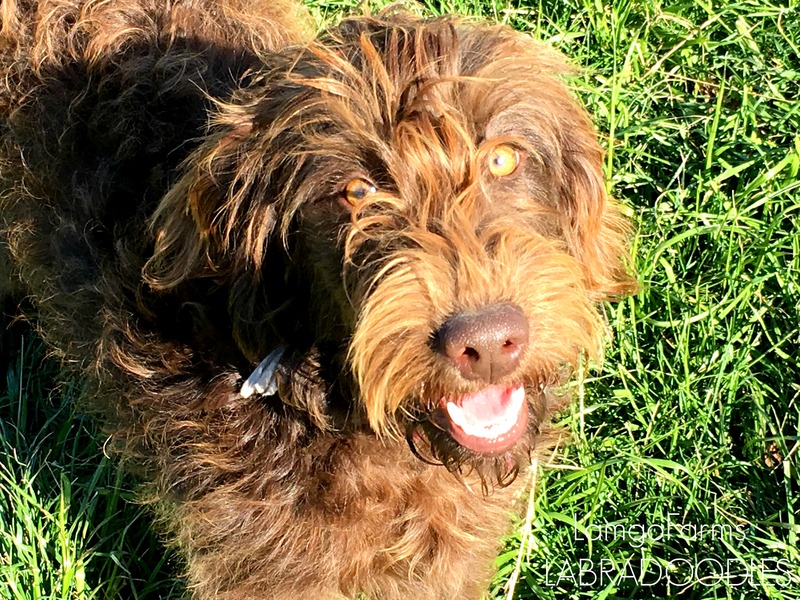 Do you Health Test your Breeding dogs? Some are OFA tested but not all. After consulting an Animal Orthopedic doctor- we learned that these tests do not offer the assurance that puppies will not have hip issues. A good line of breeding stock along with cross breeding and proper care of the puppy will protect and prevent hip issues. 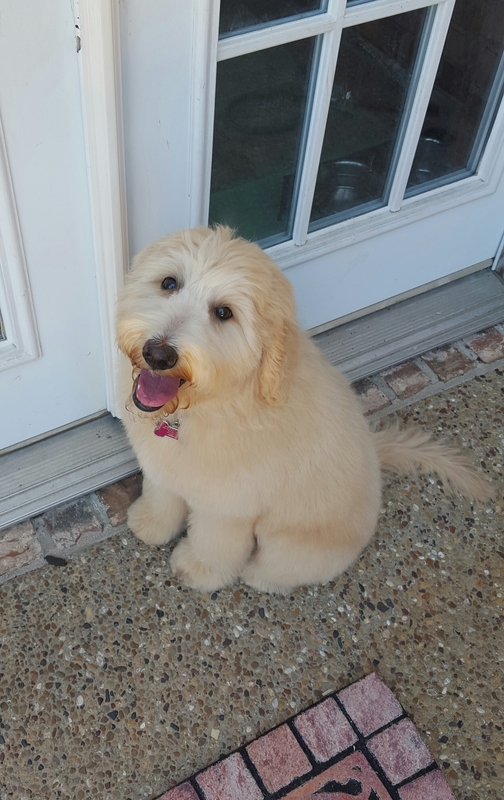 Do you allow boarding after the release date of the puppy? 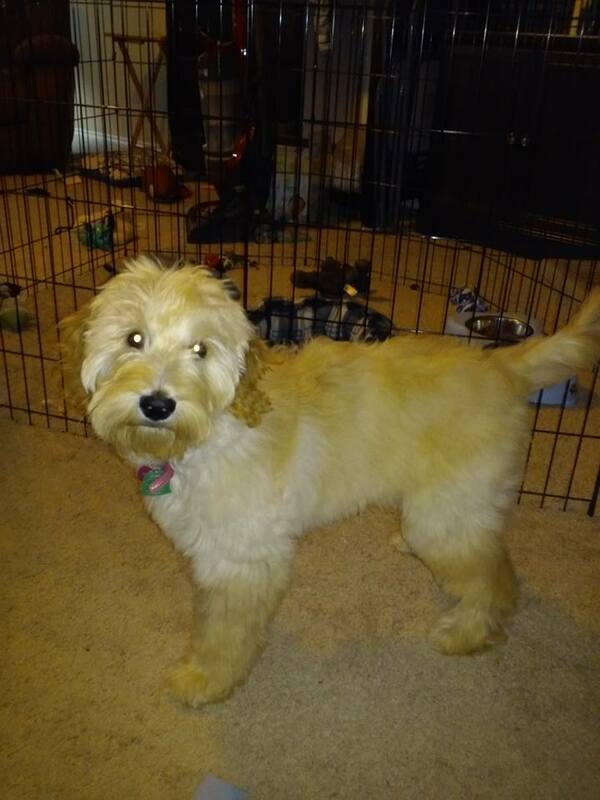 Unfortunately, we are unable to keep your puppy past the pick up date. 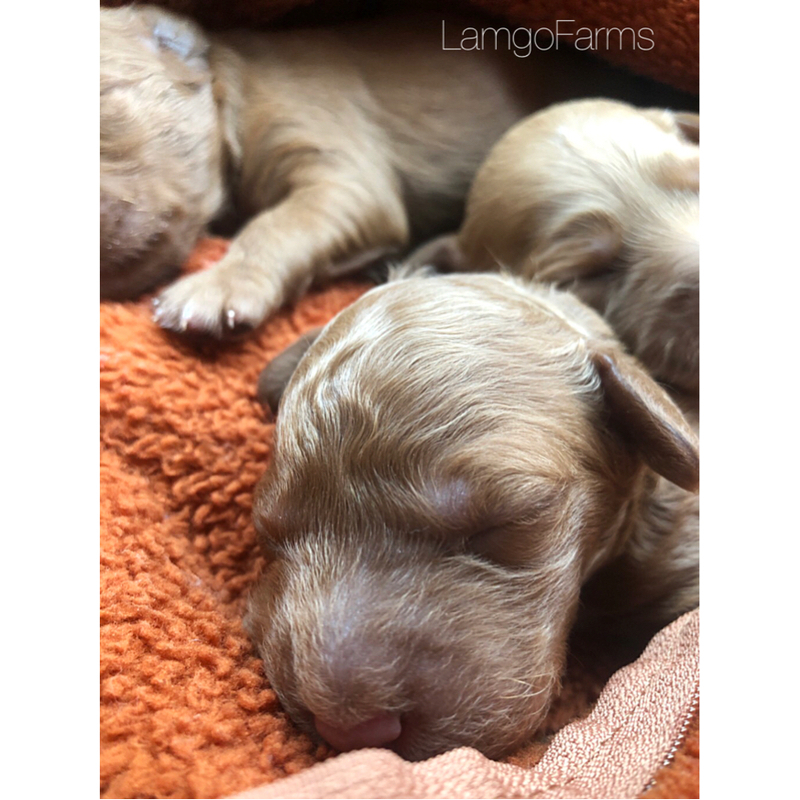 You will be notified within 24 hours after the birth as to your picking appointment time as well as puppy pick up date/time/information. This will allow you at least 7 weeks to make pick up arrangements. Pick up is on a Saturday a 10 am. We do sometimes offer a Friday pick up by appointment. 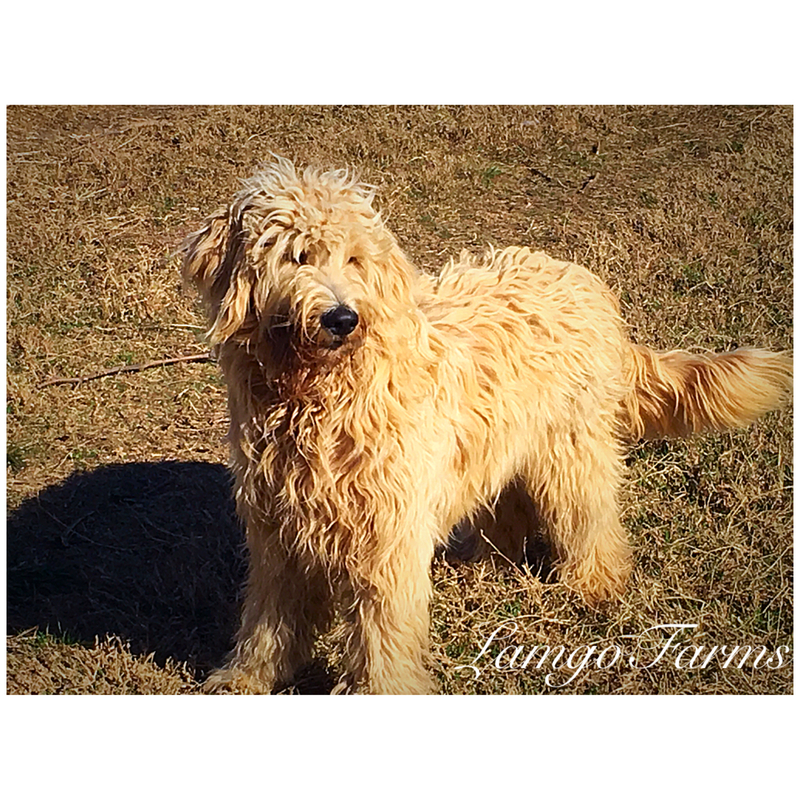 Lamgo Farms is closed on Sundays and cannot do picking appointments or pick up appointments at that time. 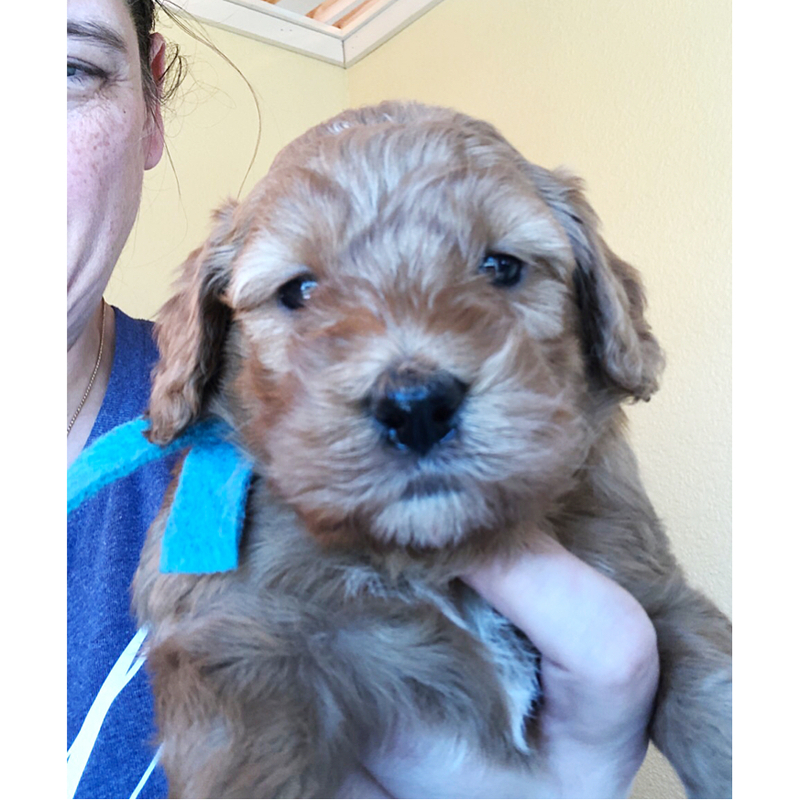 Do you fly puppies out of state? At this time, we only fly pet cargo during the months of November through May. Our summer months are too hot to fly. Flying is an additional $450. 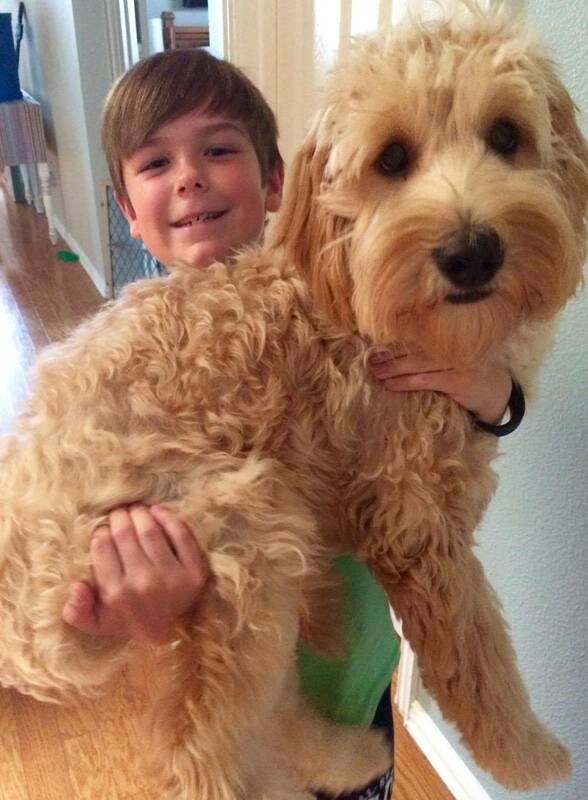 We use both Flight Nannies (for dogs that stand no taller than 11 inches) and pet cargo flights. We can fly during the off season with Flight Nannies only. What is included in the price of the puppy? 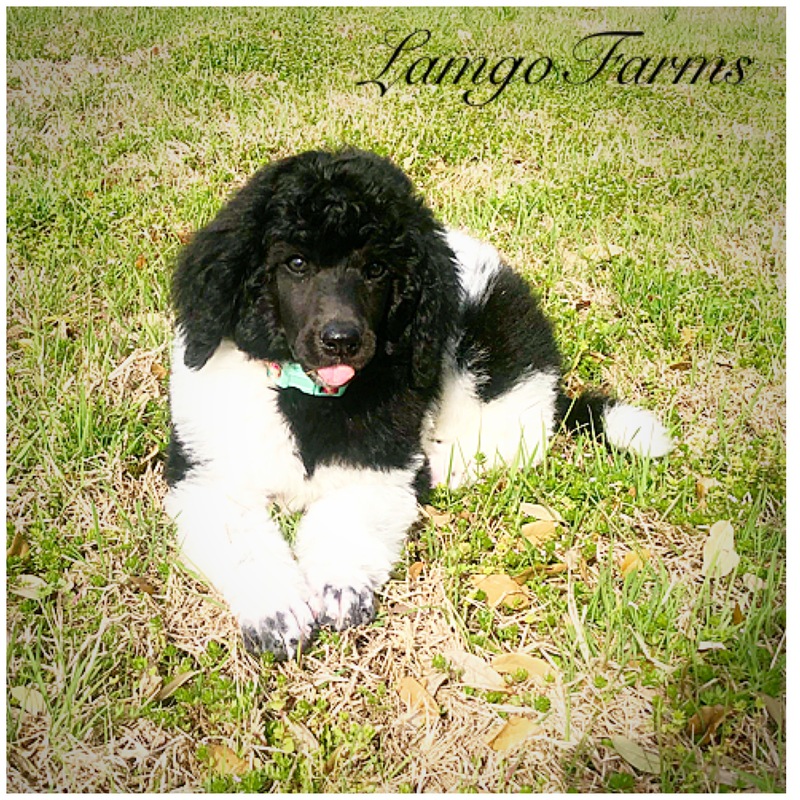 An awesome Lamgo Farms PUPPY. 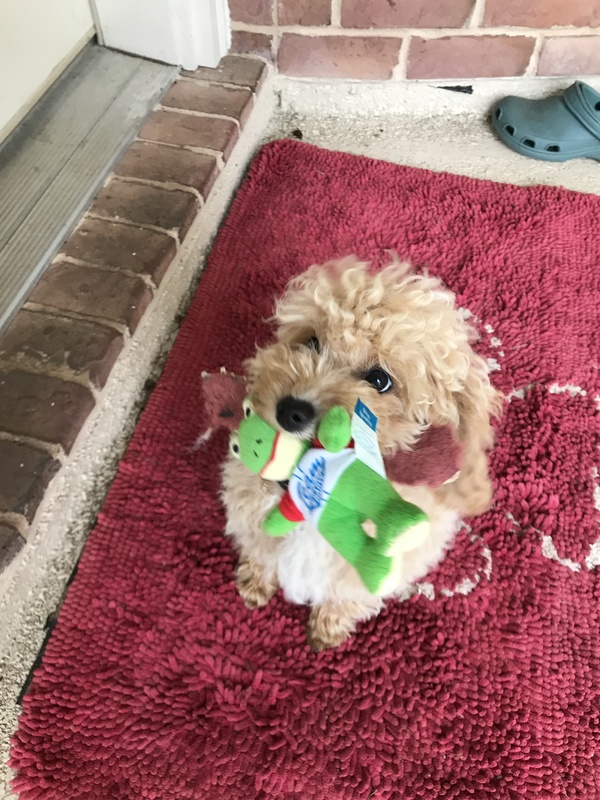 . . complete puppy packet: Crate, potty training bells, nutritional supplement, toys, treats, scented blanket from littermates, training material, folder with health records, pedigree, etc, emailed photo collage of your puppy as well as a 10 lb bucket of premium puppy food that will last a few months. What is your pricing? Sales Tax is included in the price. Do you offer discounts: Yes, we offer a $300 discount for our Military owners. Verification of service is required. Once a year we also offer donation dogs for those medically requiring therapy or service dogs. Please email me your circumstance and we will pray and ask God for the answer. We have a medical form that needs to be completed by a doctor to qualify for service needs. Do you have a Spay/Neuter clause? Yes. 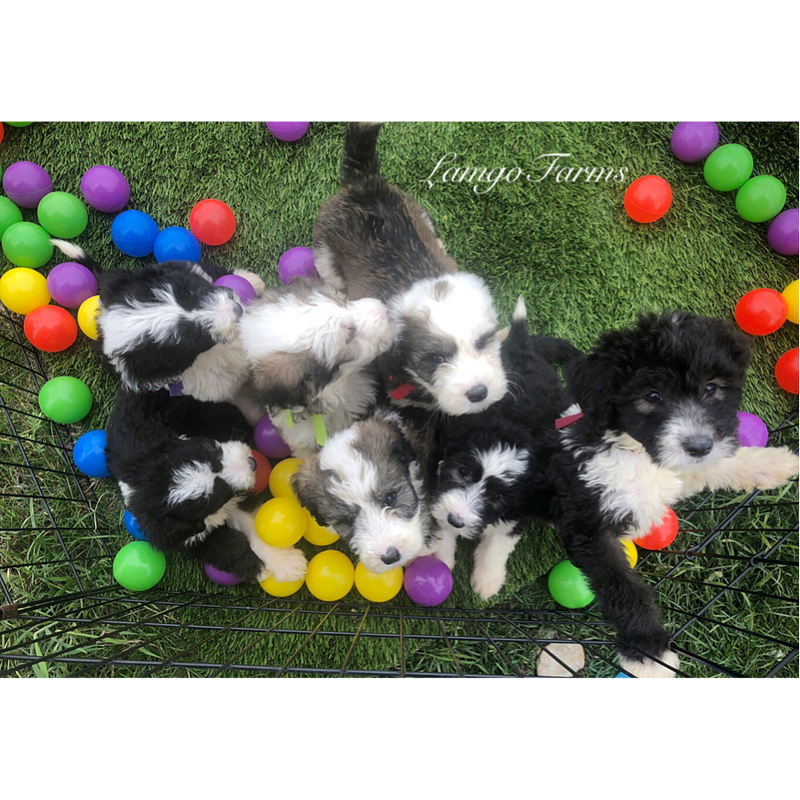 All of our puppies are sold with our contract stating all males must be neutered before 5 months old and females must be spayed before 6 months old. We no longer sell for breeding purposes. Puppies not fixed by the requested time frames will void the Health Warranty. 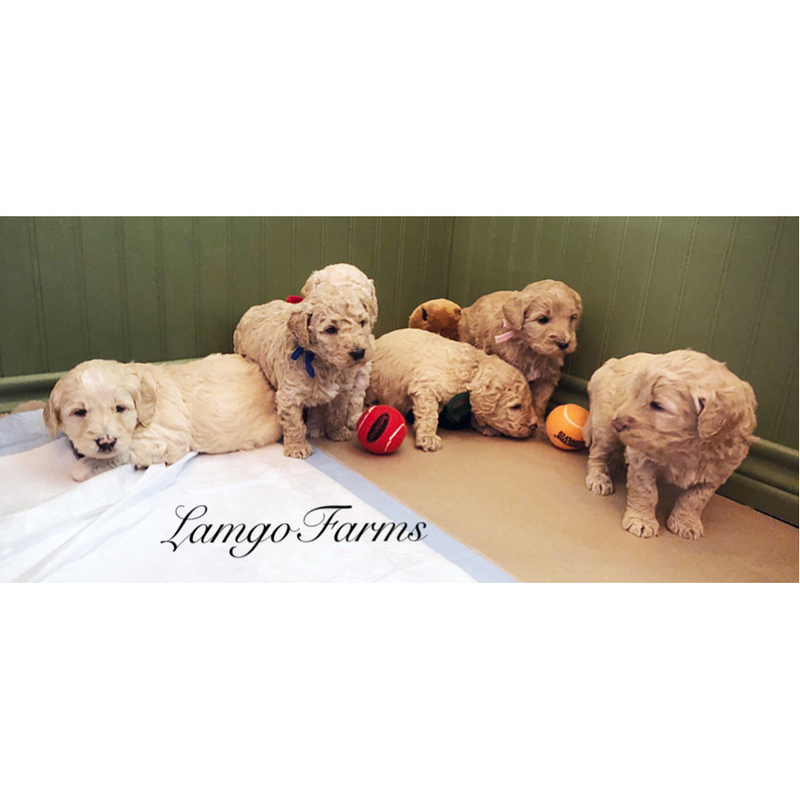 What sets Lamgo Farms apart from other Goldendoodle breeders? 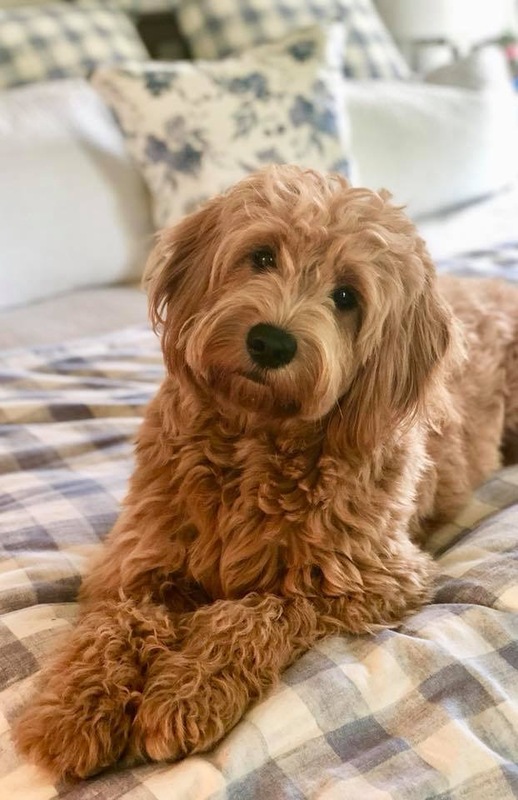 First, having 14 years experience in breeding Goldendoodles- we have learned quite a bit about what to breed to create the perfect doodle for every coat type and personality desired as well as our dedication to each litter. 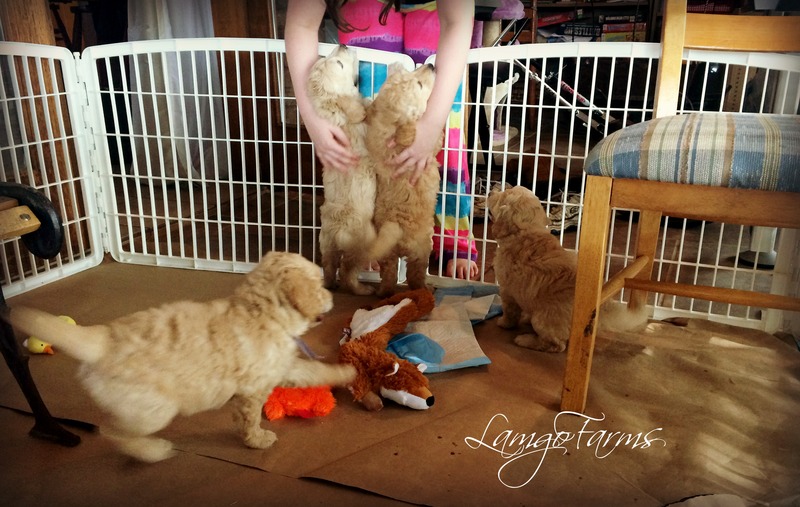 Living on a farm and homeschooling allows us to constantly lay hands on the puppies and give them the ultimate care they need and you desire in a breeder. 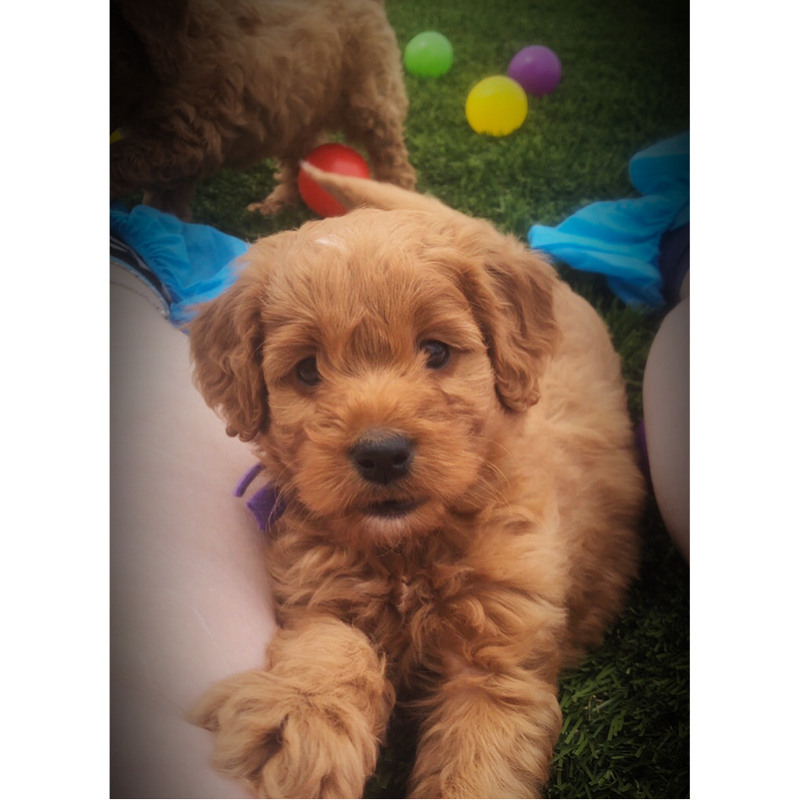 We care greatly for our puppies and owners and strive to give that personal touch to every one and puppy that comes our way. We also trust God to give us the perfect puppy you desire. 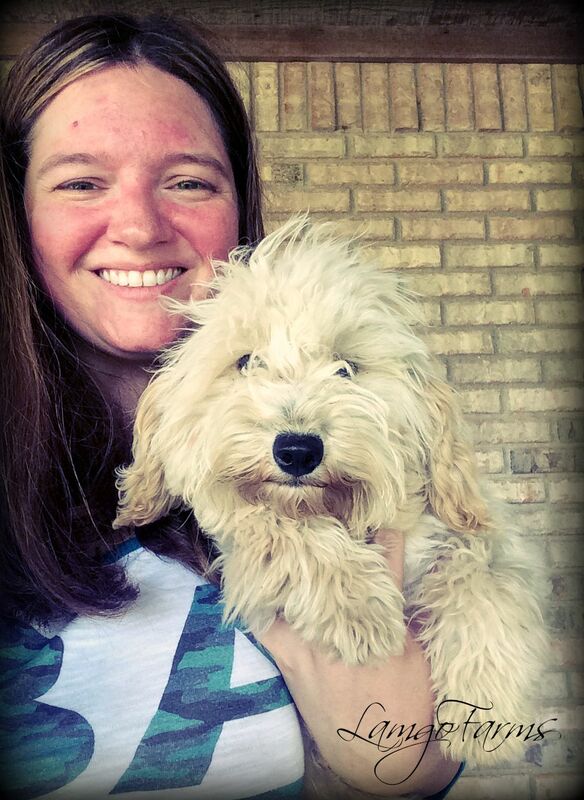 We pray over every breeding and puppy and are genuinely blessed with the ability to raise these fluffy friends. 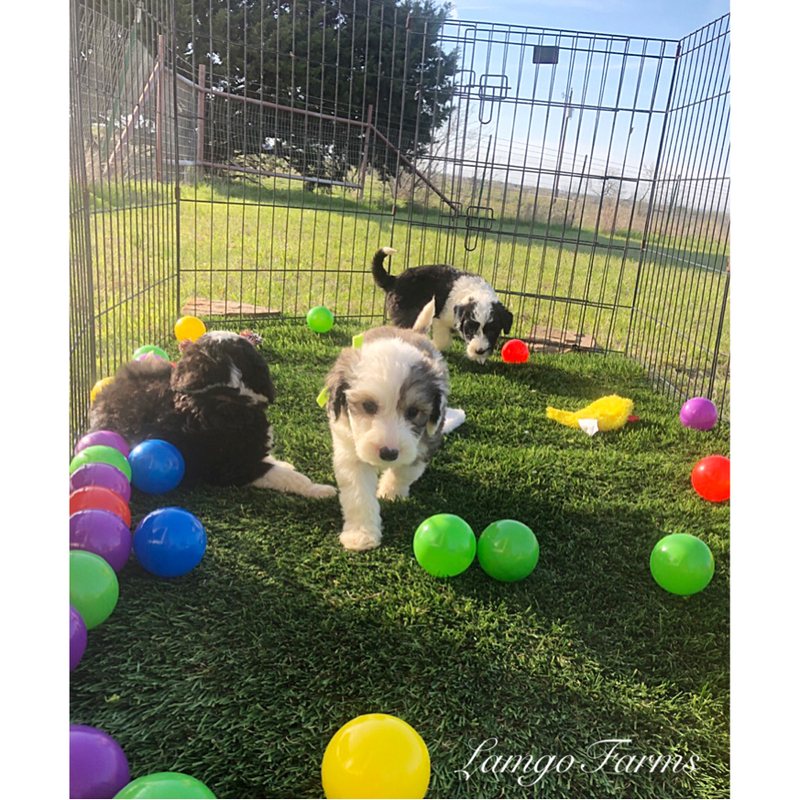 Pictures and Video: When we do have puppies. . .Pictures will be uploaded in our photo gallery at photos.lamgofarms.com and on our Facebook page. Video will be located on our Youtube channel at Happenings at lamgo Farms. 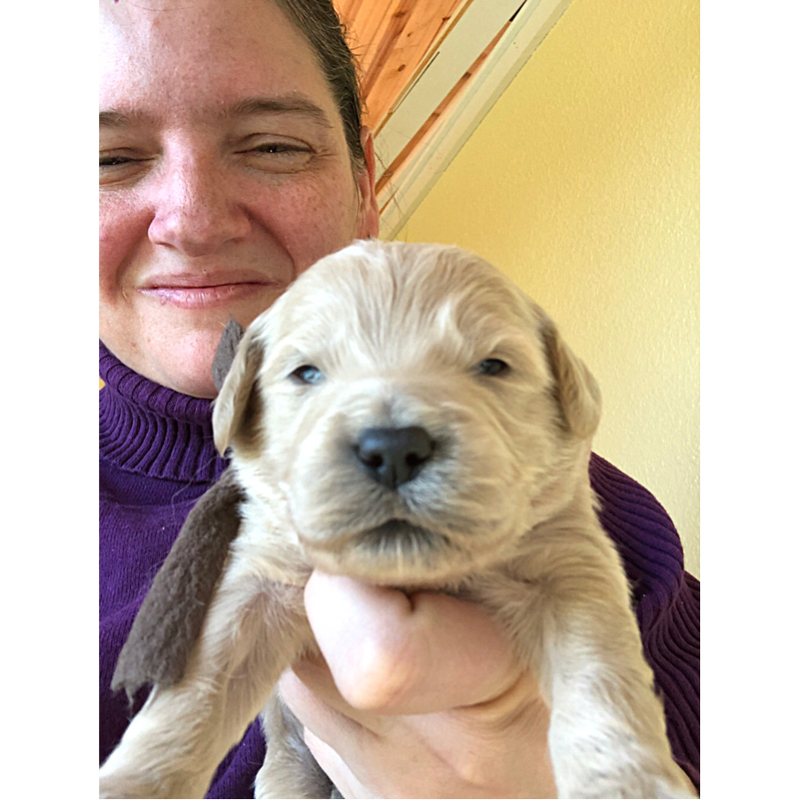 Weekly pictures will start at week 2 and Video will start to be taken when puppies are three weeks old. ***To better serve each of our clients as well as my family, I have limited my emailing and online time to Tuesday’s. If you need to reach me and cannot get a returned call. . .simply text me at the number below. It is much easier to text or email during homeschooling hours. As always, please feel free to email or call/text (817-366-7995) if you have any questions or concerns. Make sure you SUBSCRIBE to this blog to be notified when your next update is published!!! 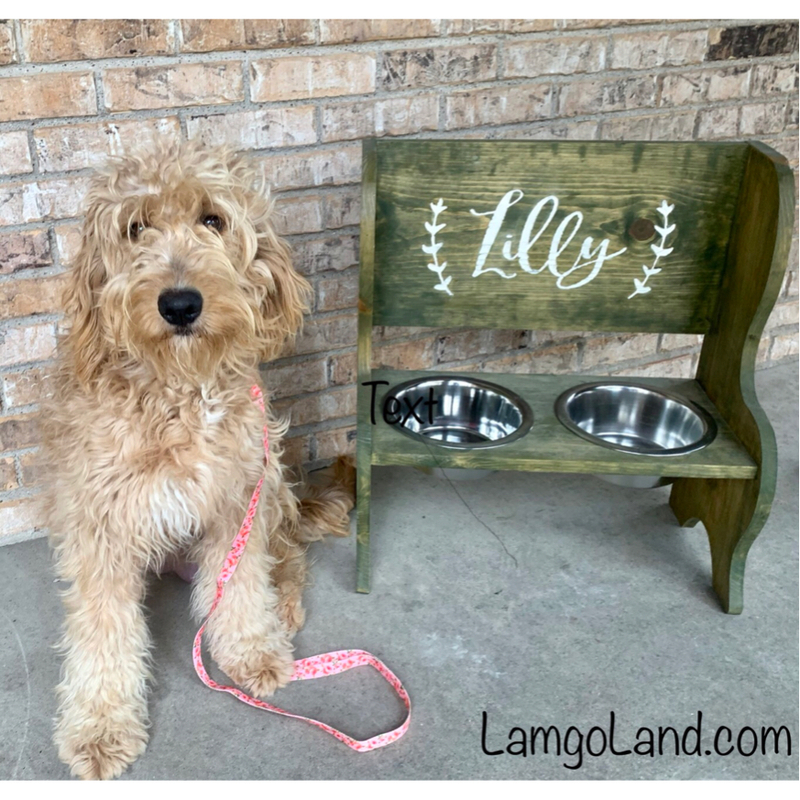 Welcome to this week’s update at Lamgo Farms! I’m excited you’ve decided to visit. 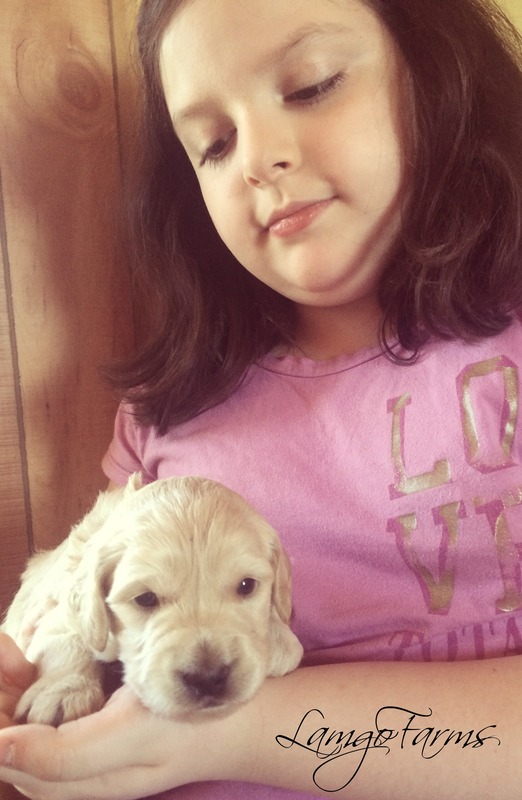 We are always excited for new puppies and even more excited to watch new owners meet their babies. 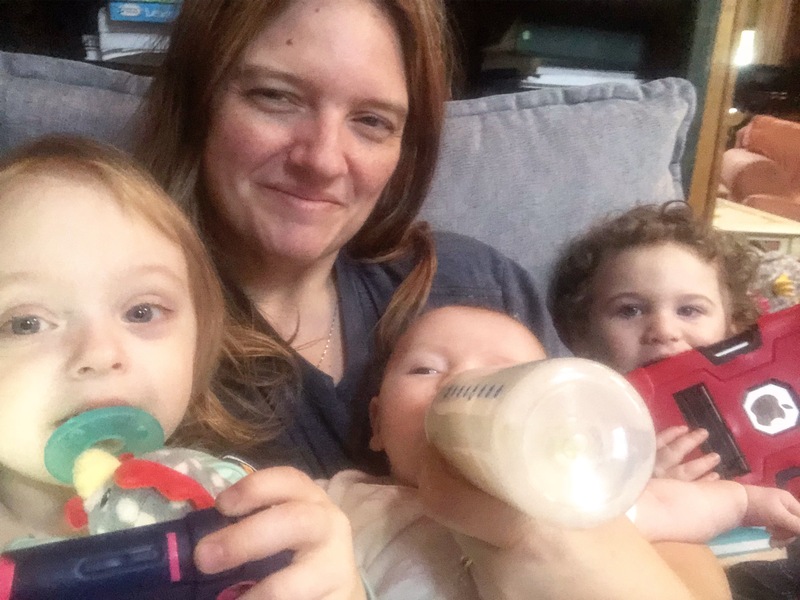 But somewhere between that new little tiny baby and the smiles and kisses on the face there is a lot of work to be done before they can go home. 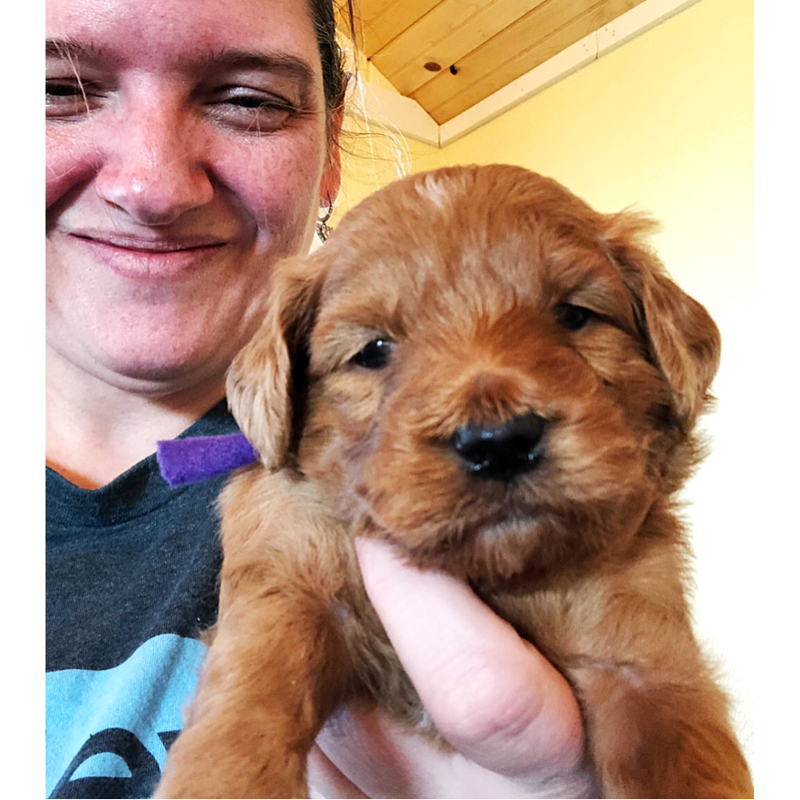 So, right now- this weekend, for litters that are not yet born- I will be putting purchase contracts, emails and phone calls on the back burner while I work with the puppies, training and getting paperwork for them to go home and puppy packets put together. The final two weeks are the most busy for me. I encourage you to text me at 817-366-7995 if you have any questions or needs. I may not respond right away- but will as soon as I can. Don’t ever feel you are “bothering” me to text. 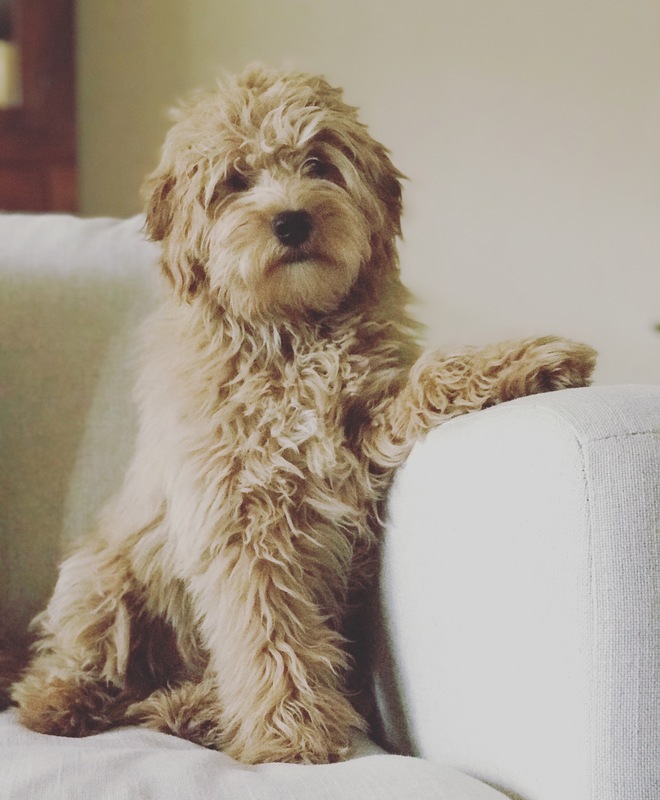 I welcome your questions. 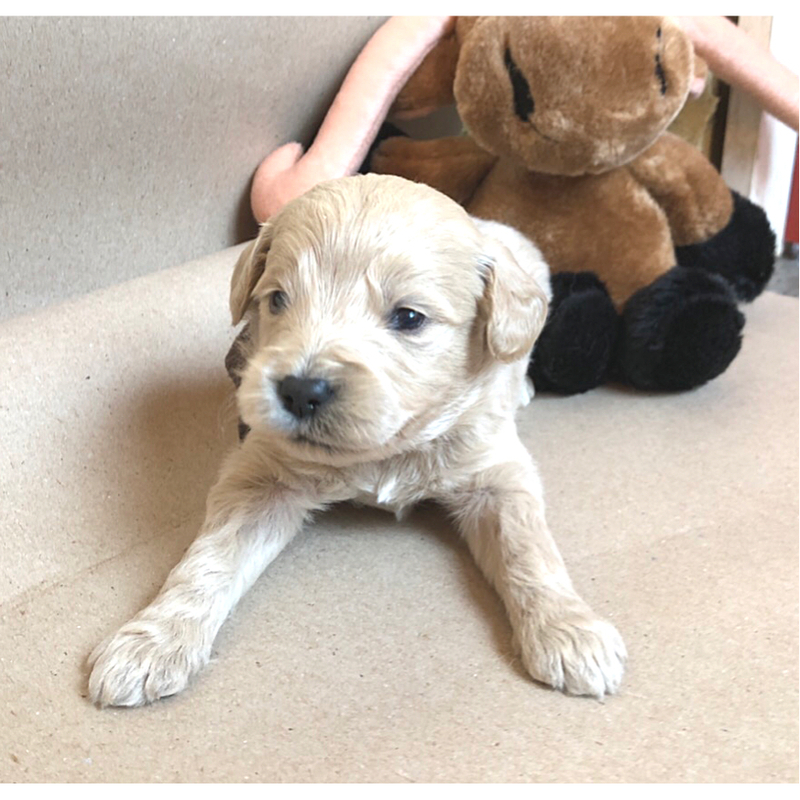 We have puppies going home over the next three weekends and then at the very end of April- we hope to see a brand new litter! At this time, we do have a few picking spots in our late summer/Fall litters, but the majority are full. We will wait until July to add our 2020 litters to the update. If I do it now- they will fill up and I will start out already behind in paperwork. For those wondering about where to purchase our puppy food- I will be creating a place for it in our online store later next week. Puppies going home will have a 10 lb bucket of puppy food included in their puppy packet. So for those going home- you will have plenty of food to get started. Speaking of the store. . .we are already seeing the fist signs of summer with the high 80’s peeking through this week. I’m in love with our Color Camel Thermal Tumblers that can be personalized! Here are a few of them! I’ll have more varieties next week for the “doodle.” Yes, it’s still work. . .but like the puppies. . .FUN! I’m excited for the next season to begin after a little rest. But for now- back to the fluff balls for playing and training. The puppies are growing and just so cute! Right now they are being introduced to their kennels with the help of a buddy. This way they are not stressed and can calmly get use to their kennels for the first time. We will then move them to being by themselves before they go home. 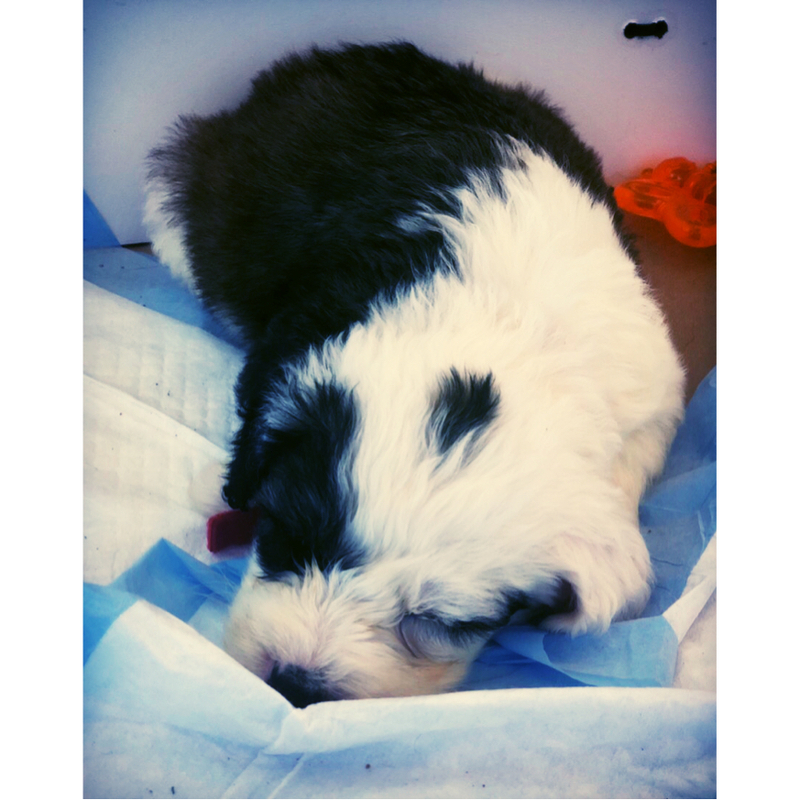 Your puppy will go home with a travel crate which is perfect for trips to the vet and for sleeping that first week home. They will soon need a larger wire crate. Check your supply list for recommendations on sizes and types of crates. If you need another one emailed- just let me know. You can always text me at 817-366-7995. I’m just not always available to answer the phone. 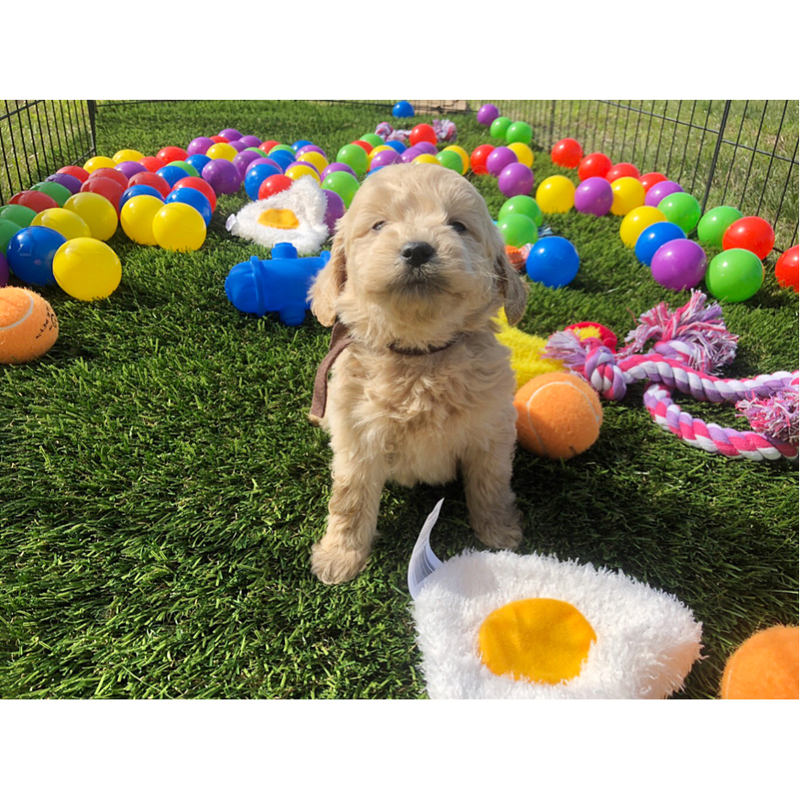 Puppy Picking/Pick up Schedule: We are having our picking and pick up on the same day this season. We are scheduling on Friday, April 19th. 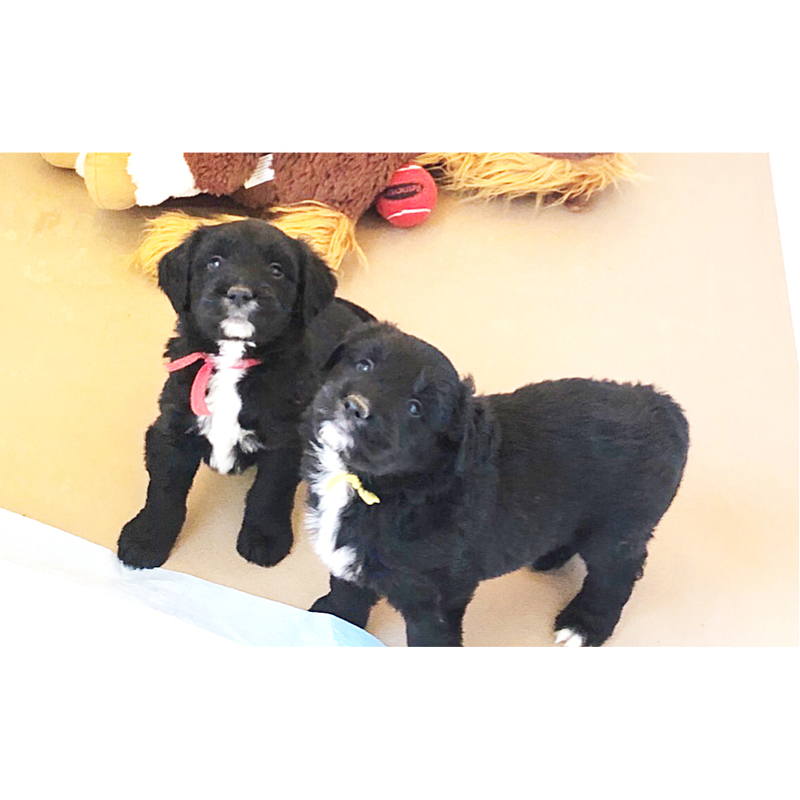 Puppies will go home Friday, April 12th. This next week the puppies will continue with crate/potty training, a few commands and will be getting ready to go home. You should have received emails with temperament testing results, puppy picking instructions and reading material. Next I will be emailing your puppy packet contents and just what to do to prepare for your travels home. This way, you can see ahead of time just what is going home with your puppy. Invoices will be emailed this weekend. You can follow the instructions and let me know if you have questions. This next week the Vet will be out to look over each puppy and will complete a health form. 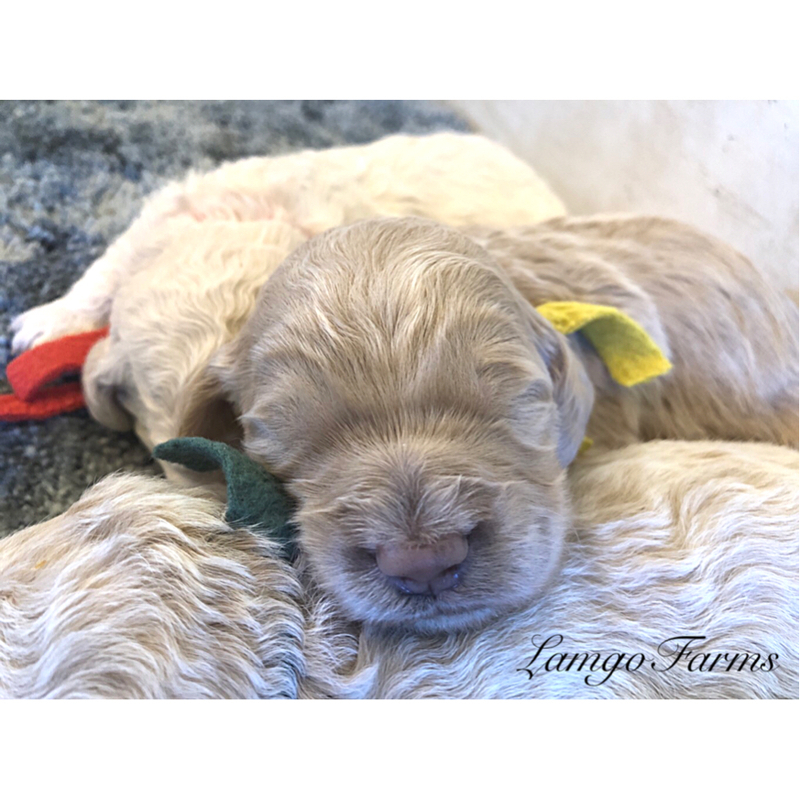 There is ONE little Burton F1 mini English Goldendoodle in this litter. He has been reserved separately. His mature size should be around 30 lbs. (Going home, Saturday, April 13th at 9am). Notations in the “Sheepie” section will be the same for Duke. Picking/Pick up is scheduled on the same day on Saturday, April 13. For those choosing long distance and flying- we will schedule around the flight Nanny’s schedule which is on the 13th or 14th. We have had a cancellation in this litter- so everyone has moved up one in the picking order. However, I’m keeping picking times the same. The babies are growing and looking more and more like Teddy Bears. Now, I promise that little purple girl has eyes haha! For her individual picture- she closed her eyes every single time! She has a spunky personality. Right now the puppies are fully weaned and eating hard kibble. 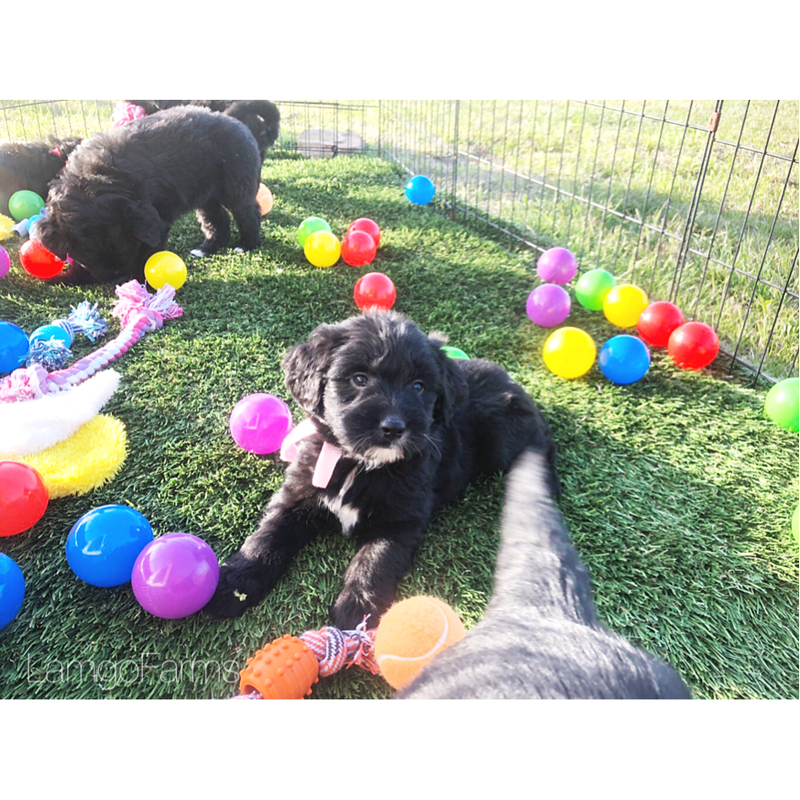 They are also learning the potty training basics and being socialized and played with several times a day. These babies are so precious. 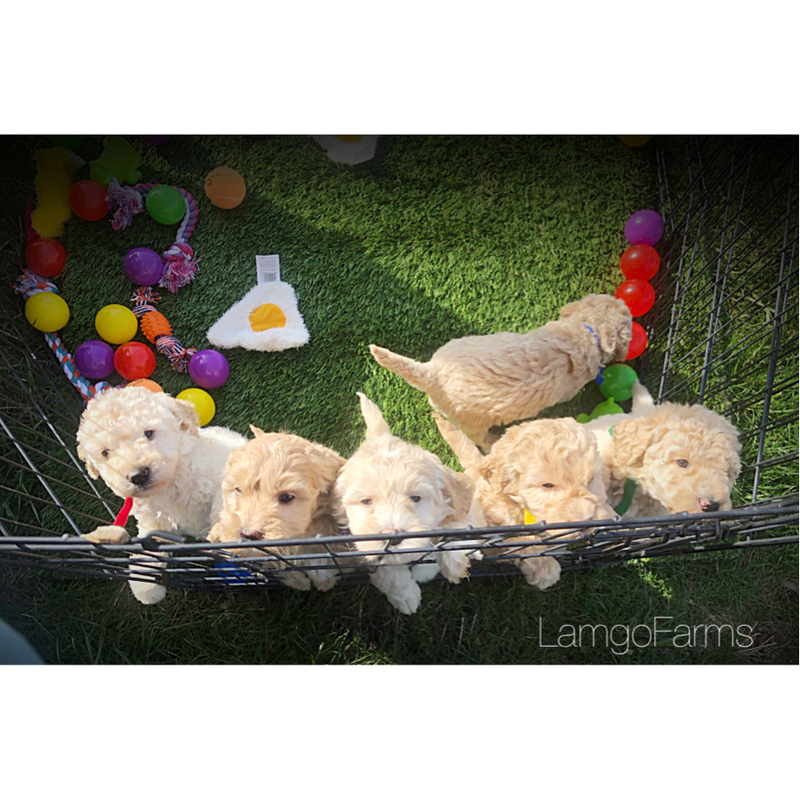 You should have already received your directions to Lamgo Farms and puppy picking instructions. I’ll be emailing temperament testing results some time this weekend. 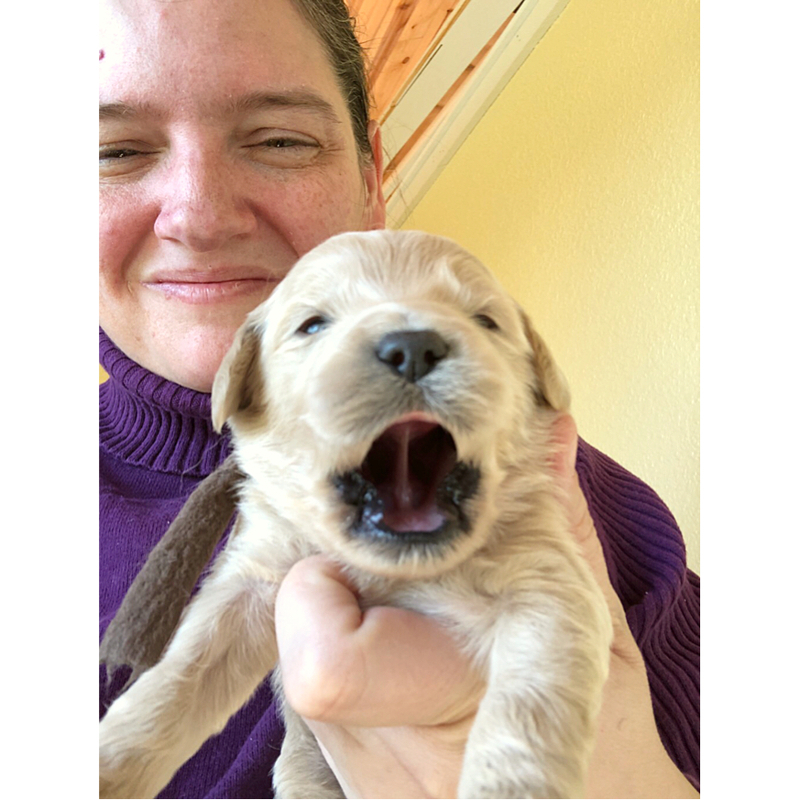 During week 6 the puppies will have their first set of shots and will begin their crate training. We will put them all in the same crate for a few days before moving them to their own crate. This way they will get use to the crate without stress. We’ll continue potty training and start learning a few commands. Lina is is about half way there now! She is active and playing around. I have set her due date at April 28. 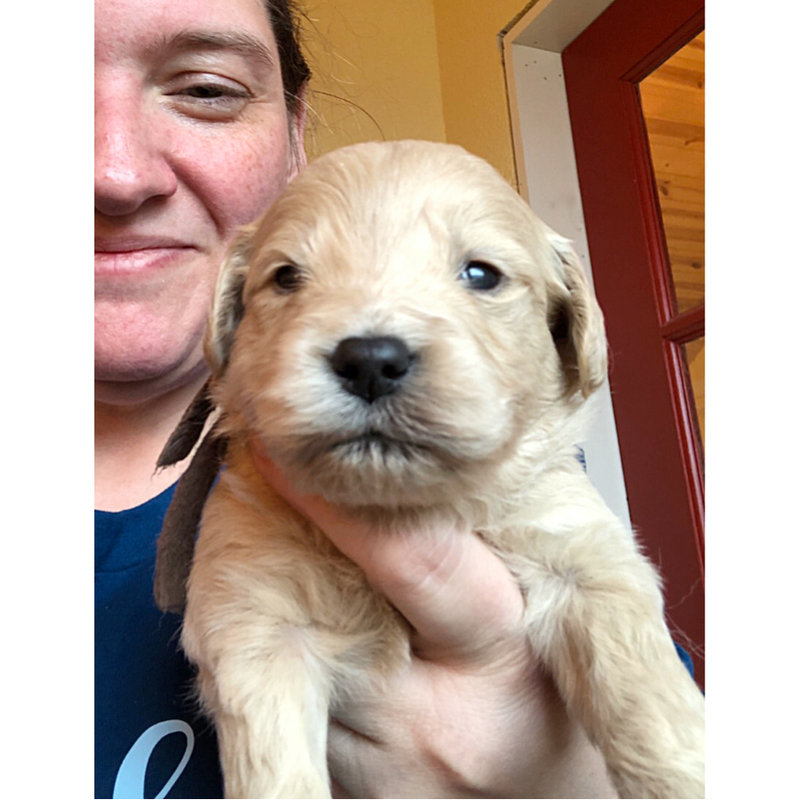 Puppies should go home around June 22nd. For those who will be on vacation during that time, please consider www.HiltonButler.com for boarding and puppy training. Boston has finished the breeding process. We will now wait 2 weeks to confirm her pregnancy. These are petites. They will be smaller than our miniatures but a tad larger than our pockets. If pregnant- puppies will be due around May 10 with puppies going home mid July. For those double listed- you can stay on both of your lists until puppies are a week old. Then we’ll ask you to choose your litter. 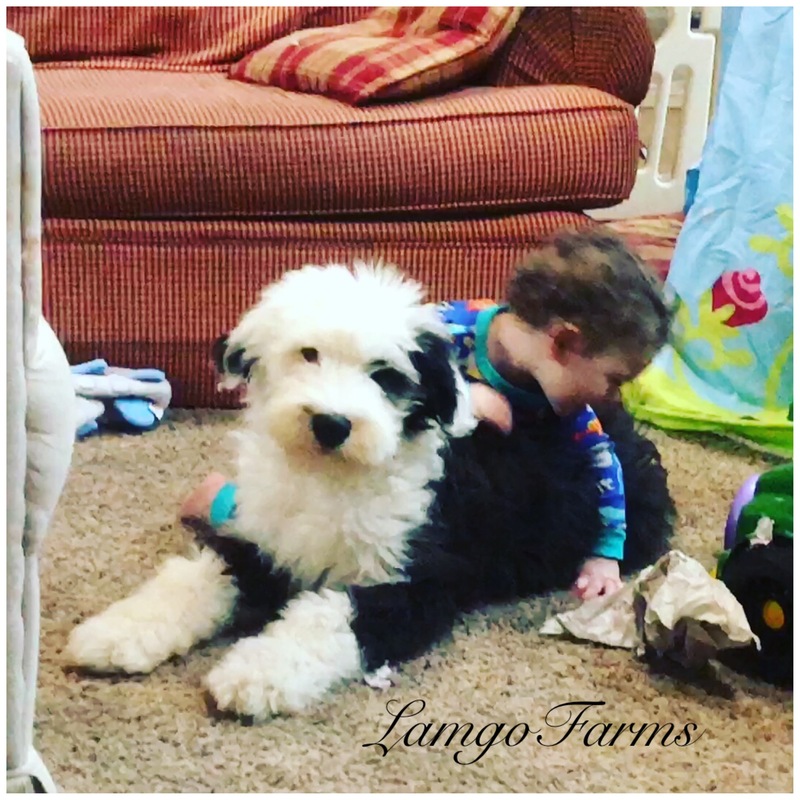 Welcome to another update at Lamgo Farms! I’m happy you’ve taken the time to visit and see just what is happening in our lives, with our littles and especially with our furry loved ones. I can’t believe how fast our puppies are growing. I think as you get older, time literally speeds up on you. Just yesterday I could climb in and out of whelping boxes without issue. Now my 3 yr old daughter makes grunting noises when she stands up from a seated position because that’s what she hears from me! My little old girly girl. For those of you just joining us and those who have deposits on puppies not yet born- hang in there and thank you for your patience! 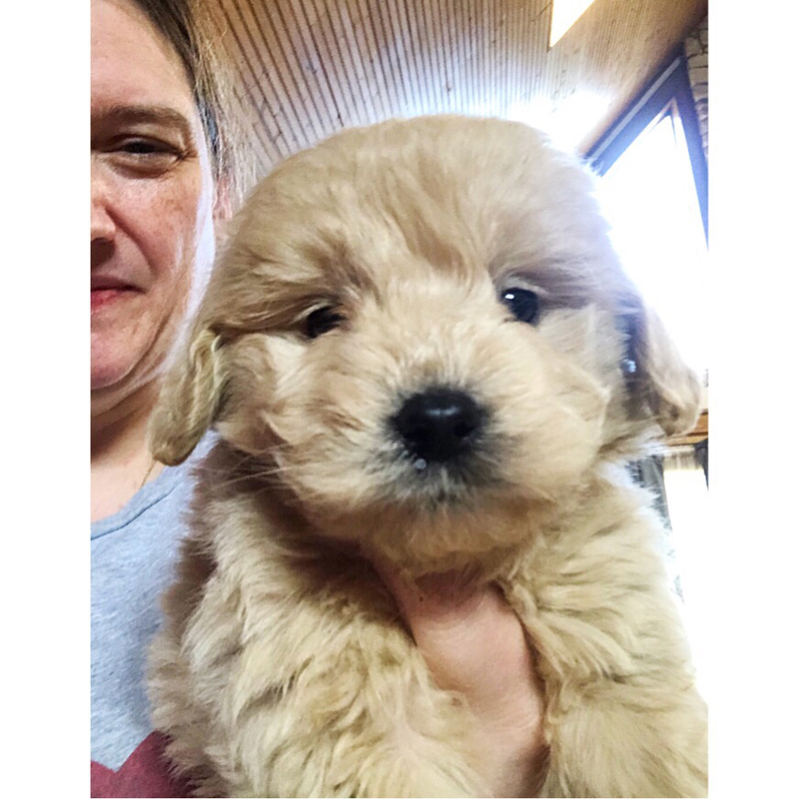 I’m kind of triaging communication based on litters going home and getting their emails and paperwork together so we can prepare owners to take home these little fluffies. I’ll be emailing in the order litters are to be bred. 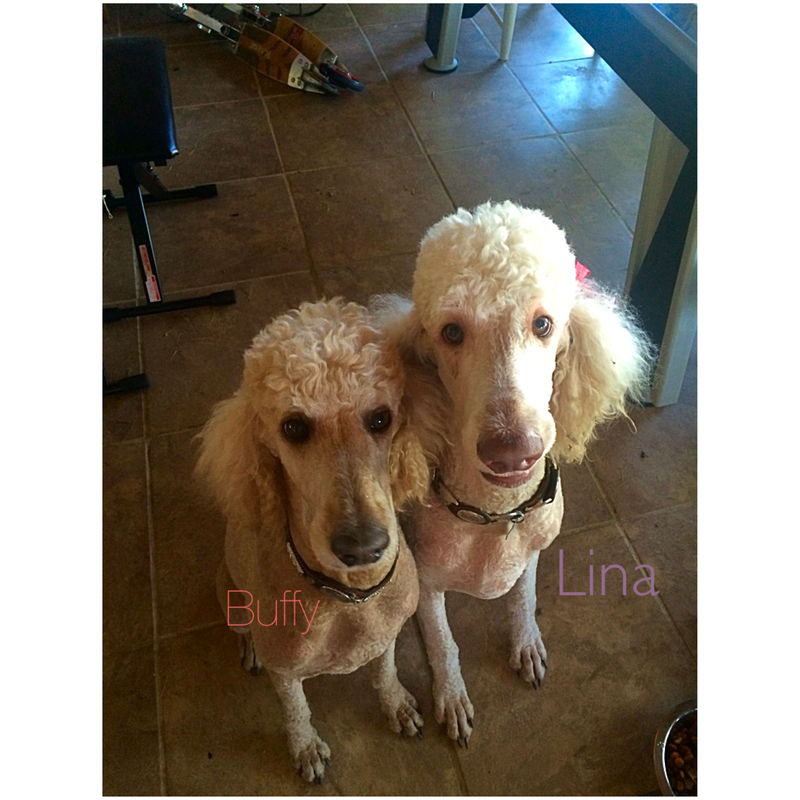 Next up. . .Lina and Boston owners! Well, today is a super special day at Lamgo Farms. Our son Matthew is turning 17 years old today! It’s a special birthday as some of you who have been around for a while know. Matt spent 2017 and 18 suffering from blindness, vertigo, and extreme head pain as well as edema in his leg. 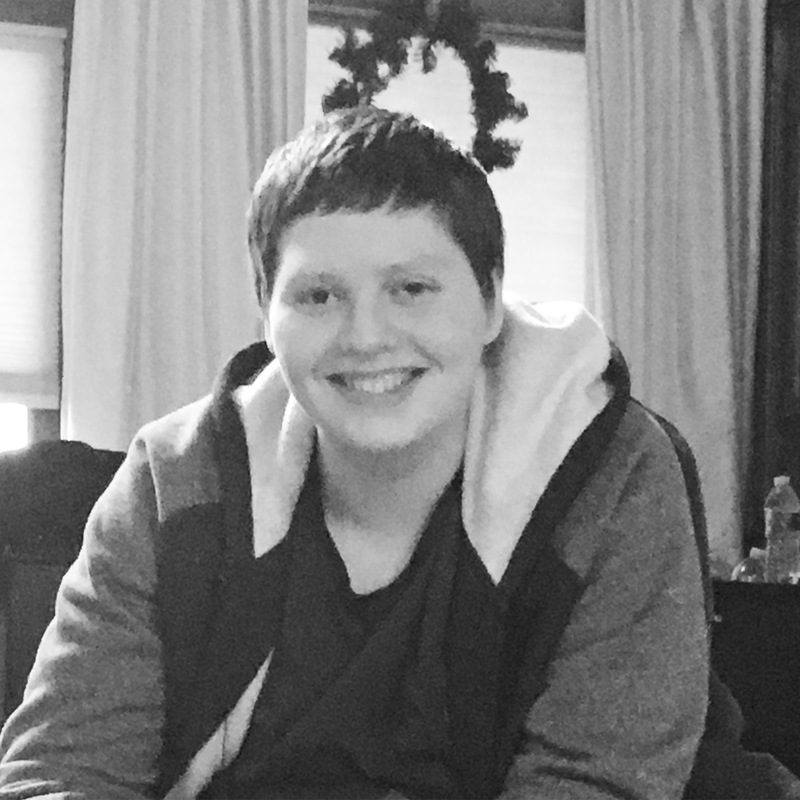 After many months of tests and hospitalizations and being told to expect a brain tumor. . .Matt is doing well! No brain tumor! He was diagnosed with something I handed down to him called Hemiplegic and complex migraines. They mimic a stroke and can be quite scary. But Matt has been a wonderful trooper and now on medication- he knows how to manage them. What an answer to prayer! 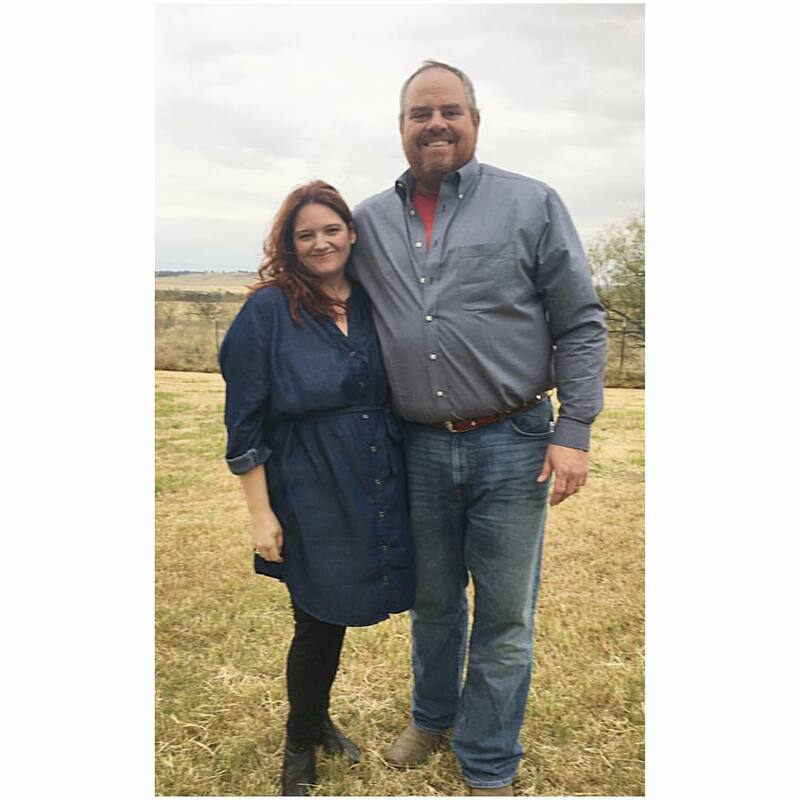 Another thing that makes his birthday so special is that after we had Matt, we began packing up our lives in Colorado and moved here where we started Lamgo Farms. It’s been that long! So thank you all who have been on this amazing journey with us! 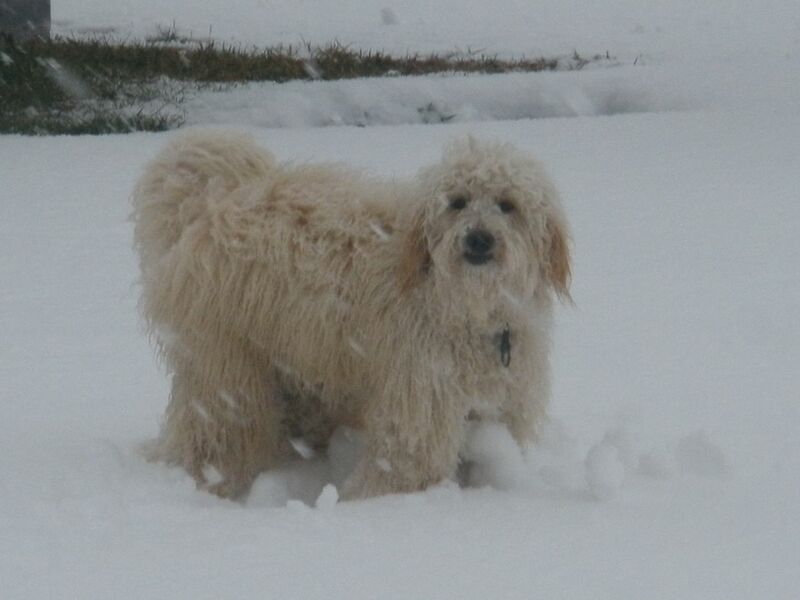 I can remember when there were just three of us Goldendoodle breeders here. Now, I can’t even tell you how many there are as new ones are popping up every few months. We know you have a choice between many breeders and we are so very thankful you’ve chosen us! We are honored and pray we can serve you well and help you take home that perfect puppy of your dreams! 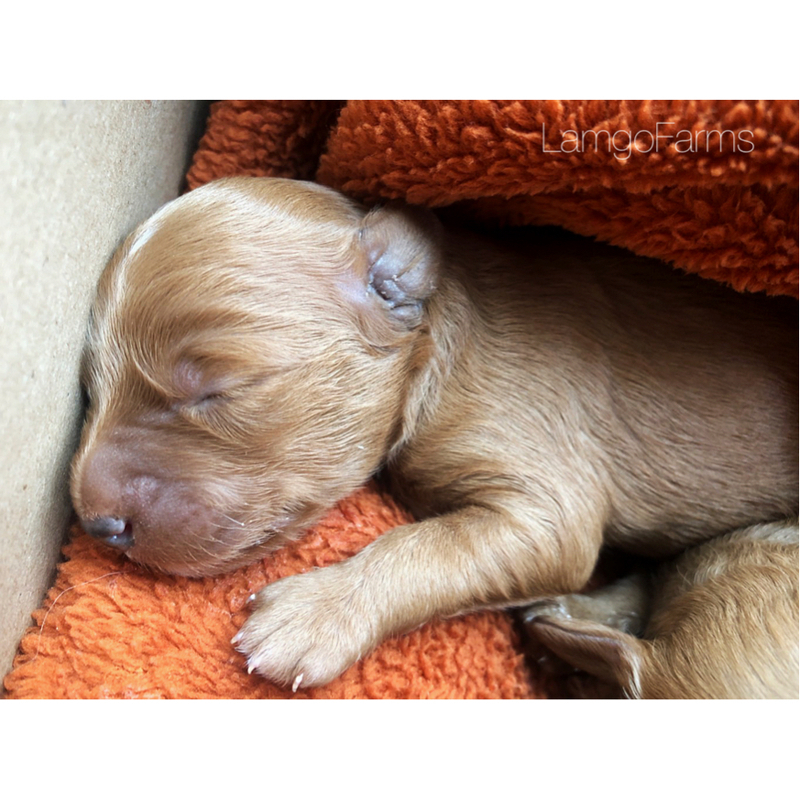 Now, let’s not fall asleep just yet. . .scroll on down to see just what is happening in each of your litters. 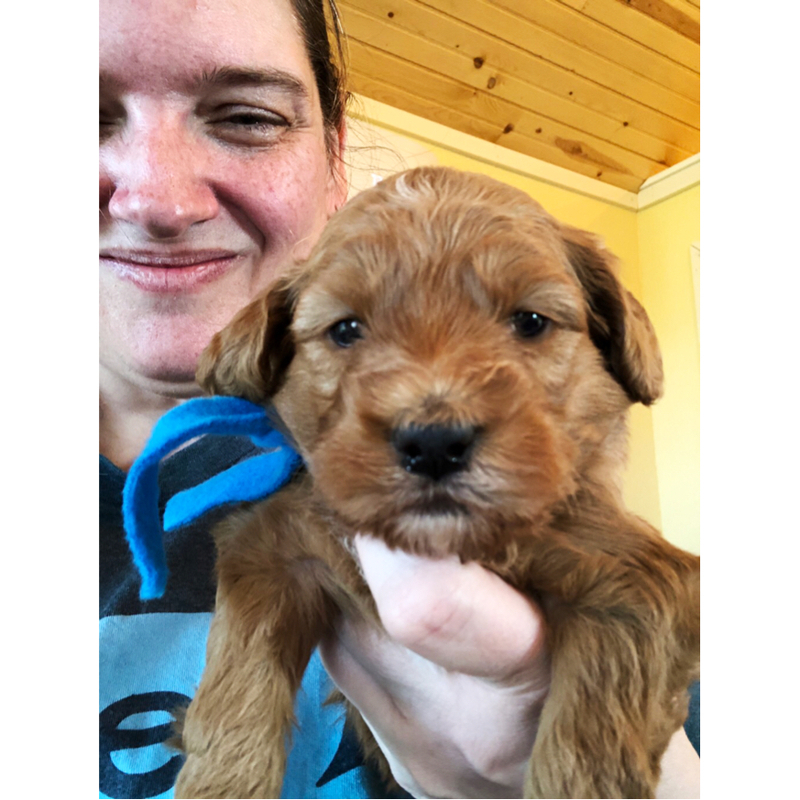 For those with questions. . .scroll on down past the litters to the FAQ section to find out the process of getting a puppy as well as pricing and the specifics. Oh these little Panda Bears! They have stolen my heart. Right now they have successfully weaned from Poppins and are doing life together as siblings. They are now eating solid food three times a day. Socializing twice a day and learning to sleep a little longer at night. Although they really do like the party night life right now. Each of you should have received directions to the farm as well as puppy picking instructions. Temperament testing for this litter is tomorrow. Results will be emailed Monday. Starting this next week, the puppies will begin crate training during nap time. 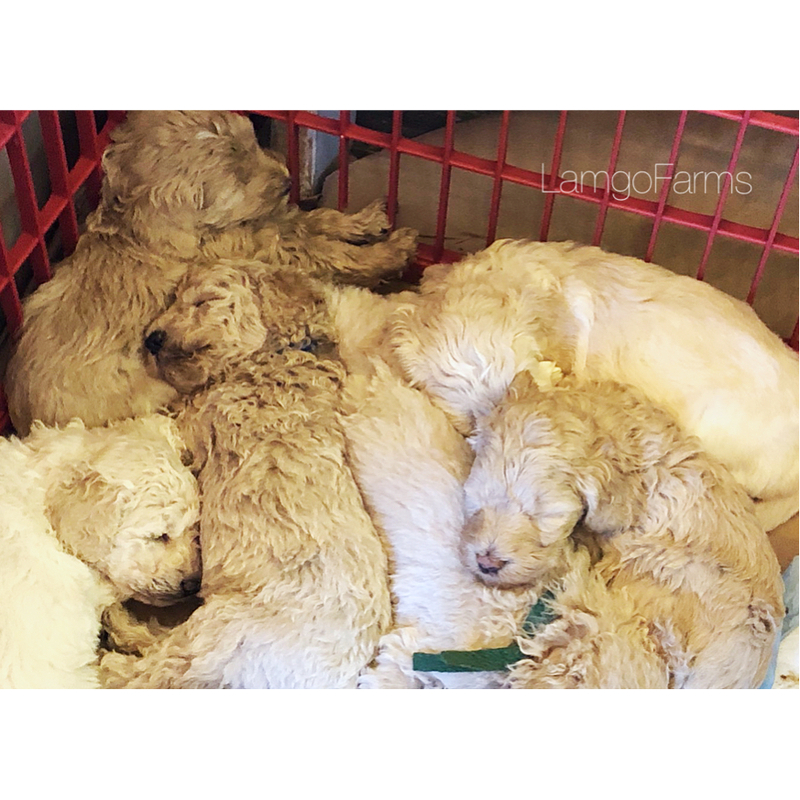 Each will have a buddy or two and they will spend about an hour in their crates during their afternoon nap. We will increase this to two naps and then once they are comfortable in this new environment, we will move them by themselves. Week 6 is also when we give the first set of shots. 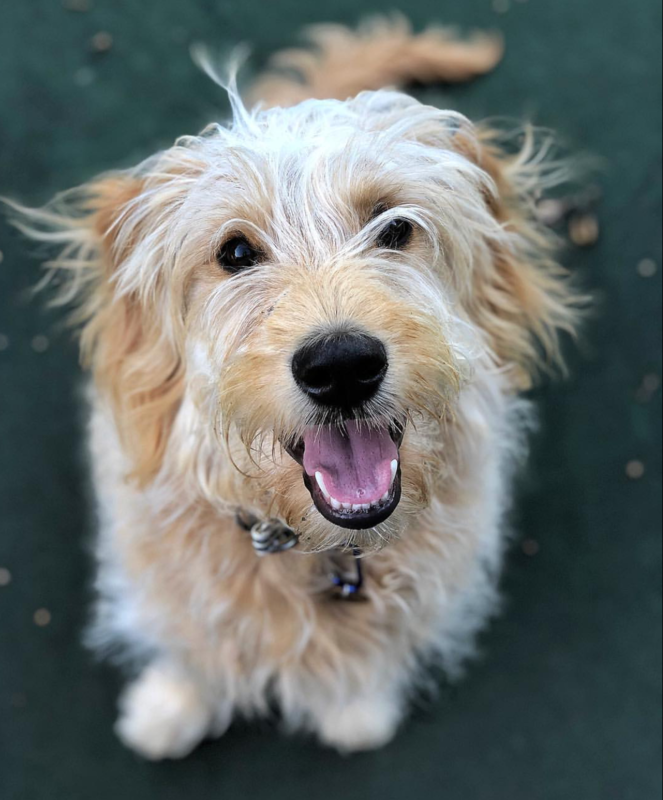 I will be emailing a little more about shots in your pick up instructions so you can make your first vet appointment and give the all of the necessary information to schedule. Puppies will need their next set of shots at week 9. I am so excited about these babies and these beautiful coats. I’ve never seen anything like it. Fluffy and soft and long and not a bit of shedding! They are super sweet and calm. My dream puppies. Right now they have successfully weaned from Poppins and are doing life together as siblings. They are now eating solid food three times a day. Socializing twice a day and learning to sleep a little longer at night. Although they really do like the party night life right now. Each of you should have received directions to the farm as well as puppy picking instructions. 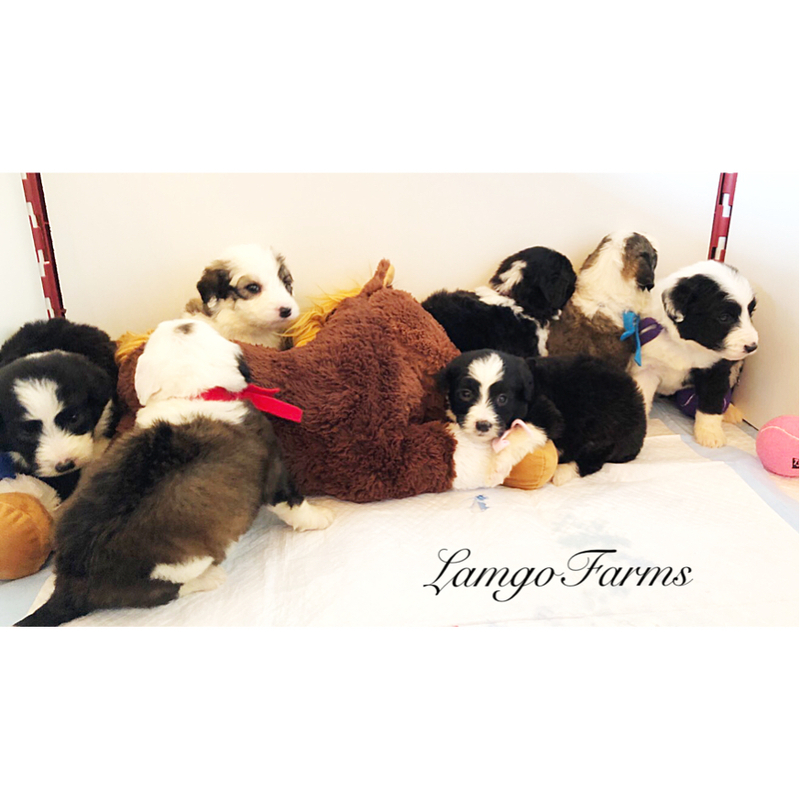 Temperament testing for this litter was done this week. Results will be emailed Monday. Time is moving right along and very fast if you ask me. These sweeties are growing and the typical Brie/Duke babies. Very bright and sweet. Right now they have successfully weaned from Poppins and are doing life together as siblings. They are now eating solid food three times a day. Socializing twice a day and learning to sleep a little longer at night. Although they really do like the party night life right now. Each of you should have received directions to the farm as well as puppy picking instructions. Temperament testing for this litter was Wednesday. Results were just emailed. Please let me know if you have any questions. It’s week 4! These little ones are coming out of their shells and showing us those little personalities. They are super sweet and playful now. Right now they are in the weaning process and are only nursing twice a day. They are spending their nights just the three of them. We introduced them to hard kibble now that they are getting teeth and they are loving it. We’re seeing some playing with toys and each other. We are continuing socializing three times a day with lots of cuddles. Week 5 is another big one with temperament testing. We will email the results so that along with video and pictures you can start to pick out your favorites. Each of you should have received directions to the farm and puppy picking instructions. More instructions for pick up along with vaccination information and training reading material will be on it’s way during week 6. Lina is doing great! I have set her due date at April 28. 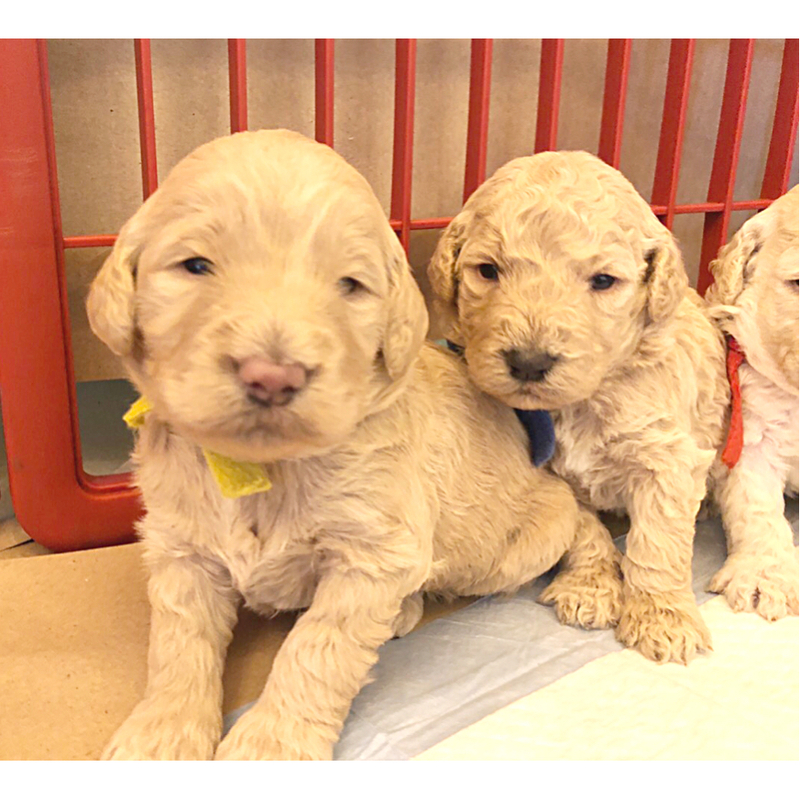 Puppies should go home around June 22nd. For those who will be on vacation during that time, please consider www.HiltonButler.com for boarding and puppy training. Boston has finished the breeding process. We will now wait 3 weeks to confirm her pregnancy. These are petites. They will be smaller than our miniatures but a tad larger than our pockets. If pregnant- puppies will be due around May 10 with puppies going home mid July. For those double listed- you can stay on both of your lists until puppies are a week old. Then we’ll ask you to choose your litter. 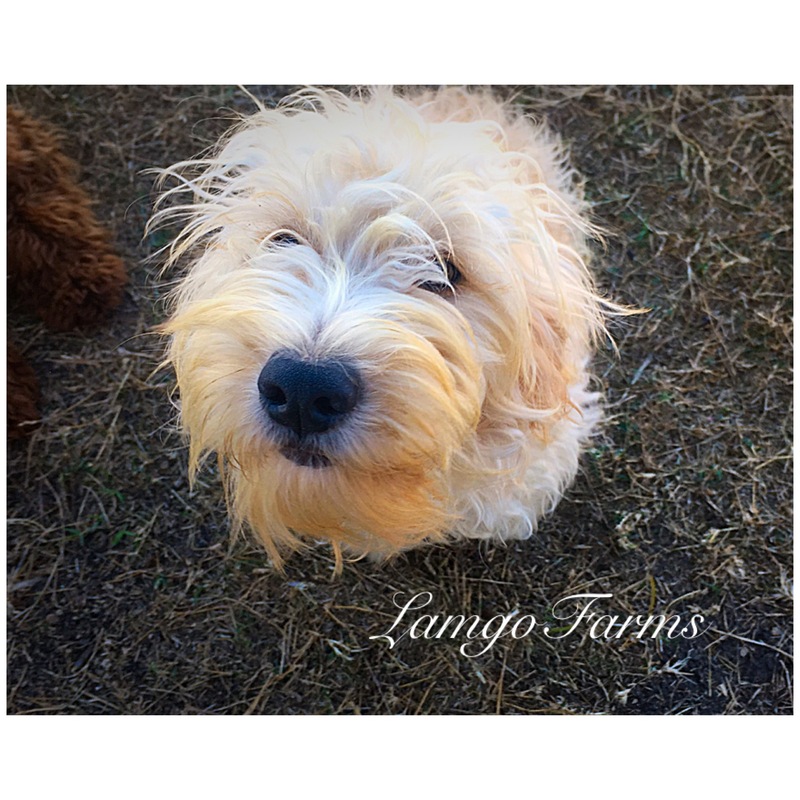 Welcome to this week’s update at Lamgo Farms. 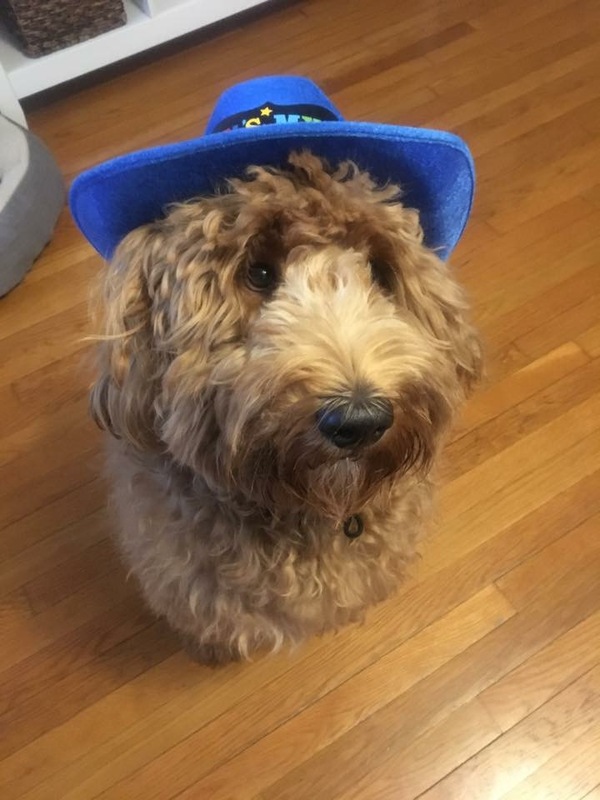 I’m excited you’ve made your way to this page and hope you get to know a little more about our family, farm and furry friends. 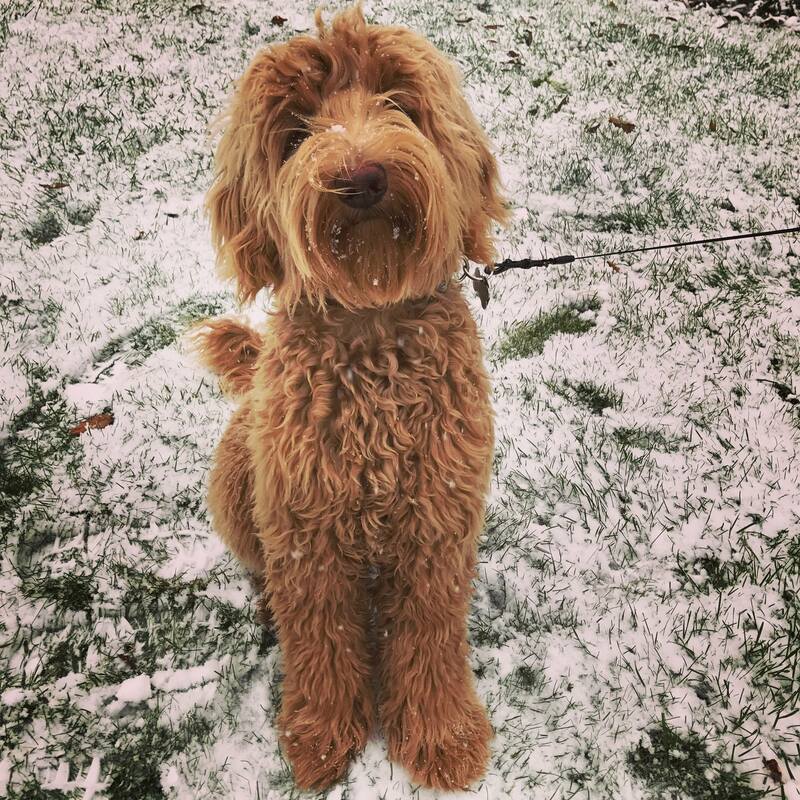 We are thoroughly enjoying this first day of Spring! The breeze made it seem a little chilly in the shade, but in the sun it was perfection. Both the dogs and horses were enjoying just running in the wind with their hair looking wild. There is just something about Spring that makes everything come alive after a long winter. If you’ve ever watched a horse in a pasture, they very much have personalities and enjoy playing and showing their joy. I can see our horses in the back pasture through the window over the kitchen sink. 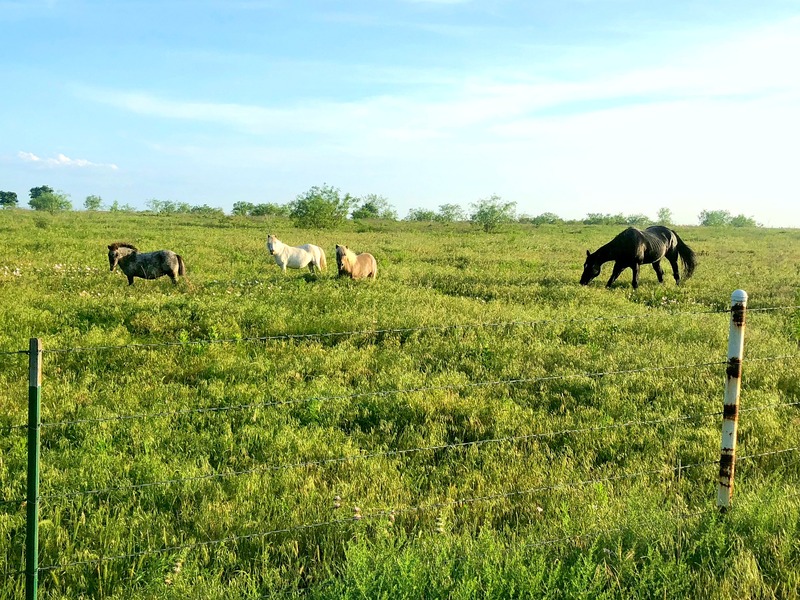 When I’m making dinner in the evening, the horses gather at the back fence and stare at me as if to say, “hey mom, what’s for dinner?” Today, they were just running along the fence. Horses and miniature horses running along side of doodles and poodles and Retrievers. I love it when all of the dogs are outside running in the bright green winter grass that was planted in the fall. Right now, it’s a little too tall in places and you can see the dogs jumping in patches and then they disappear for a second or two before you see them pop up again. It’s like watching dolphins swimming and coming up for a breath of air. The Spring not only brings things back to life that were once dormant; but this is also a time when new life begins. 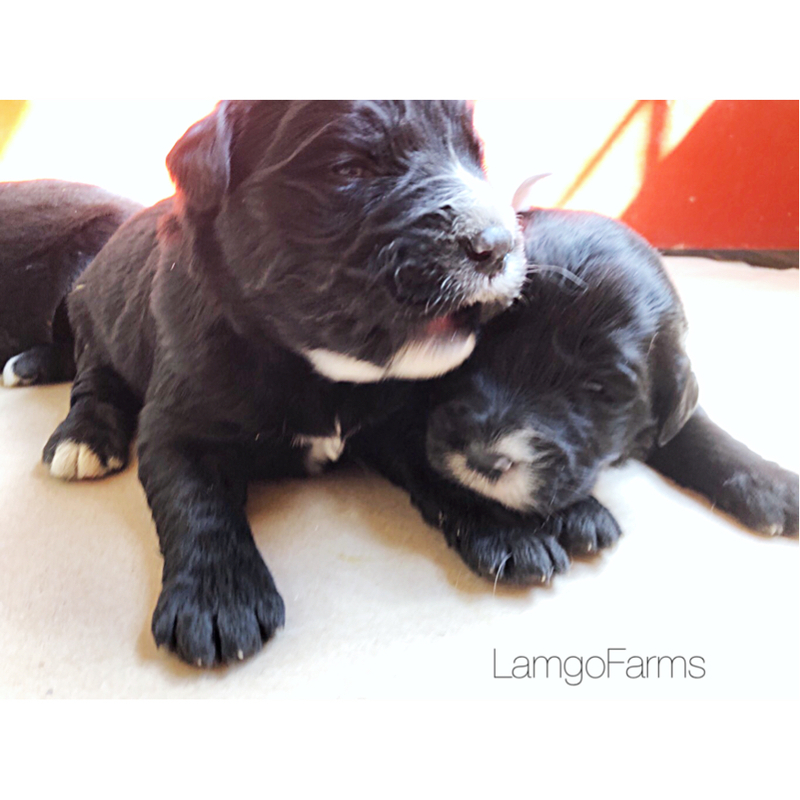 For us, we have puppies, a few new calves, flowers sprouting and buds on the trees blooming. LIFE. The return to life gives me such hope when we’ve been through a season of hard or sorrow. For those following us for a while, you know we’ve been wading through the grief from a year of deaths in our family, failing health and the struggles that come with plans for puppies that just don’t arrive. We’ve been in a very long season of praying for God to speak to us, show us the way and hold us in the hard. And although things are still hard, we are seeing those first budding signs of life returning. We competed our third adoption this month along with celebrating 4 birthdays. 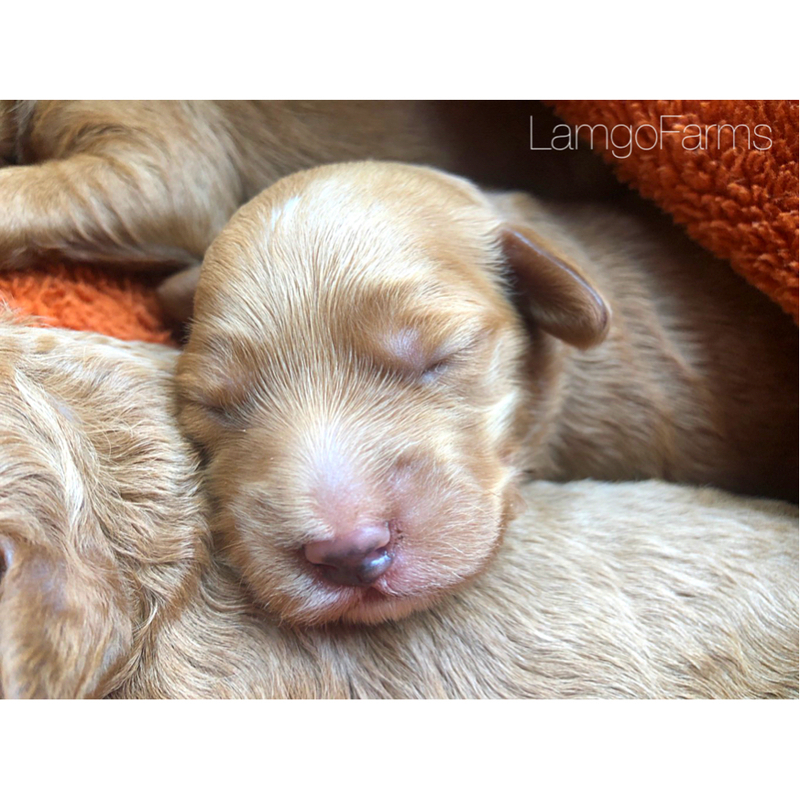 We have four litters of puppies on the ground and two more coming up in the next few months. The beauty of life returning! We are not moving on unaffected by all that has happened, but we are leaving the hurtful season with the hope and peace in a new day. 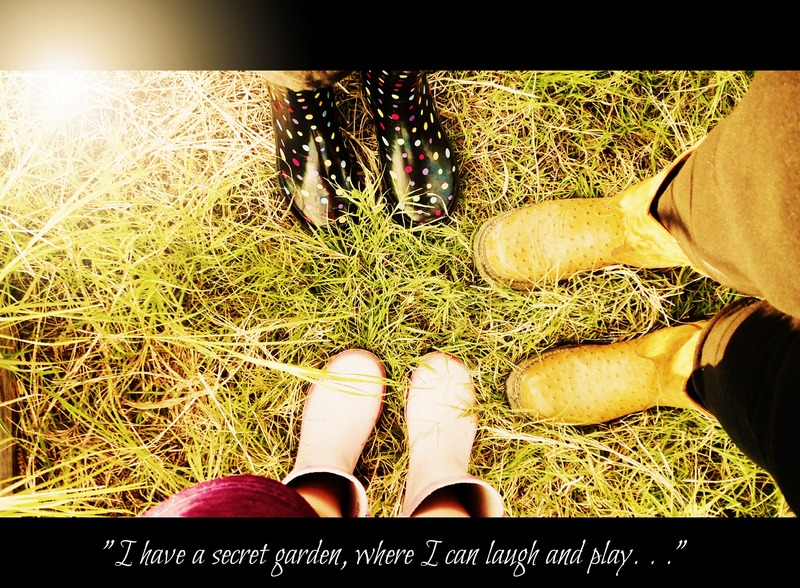 Living on a farm allows us too see these chapters in life over and over and over again. We witness death. It’s sad. It is reality. But then we get front row seats to new life. Just today a brand new baby calf stood up and started to nurse from her momma. The bumpy driveway was irritating me as I was attempting to buckle my seatbelt. . .and then. . .the calf. I just smiled. Every puppy born is a celebration of life for us. We never tire of those little miracles. Our children never tire of hearing how many and what colors and how many boys or girls. We have been watching puppies come into this world for almost 16 years. And the kids still get excited over each and every one. It’s another late night tonight and most likely, this won’t get published until Thursday as my eyes are getting a little blurry. To my right is the image on the nursery monitor of my 6 month old baby girl sleeping soundly. To my left on the sofa is my 15 year old daughter snuggled in a blanket just waiting for me to look up from this computer to talk to her. And in front of me, a TV is on but the sound is down. The house is quiet. Tomorrow will be here in a flash and the sounds of silence will disappear as I begin to hear mom, mommy, and mama fill the hallways. The busy will set in and at least once in the day I will look to the ceiling and cry out, “Oh Lord!!! !” Yep, I will fall victim to the stress of doing it all and being expected to do it all at one time. But then someone will do something silly. . .a puppy will lick my cheek. . .a teenager will crack another joke and I will push pause, look up and see all of this life in front of me and smile. LIFE. Thank you all who are on this journey with us. We love our puppy families and friends. 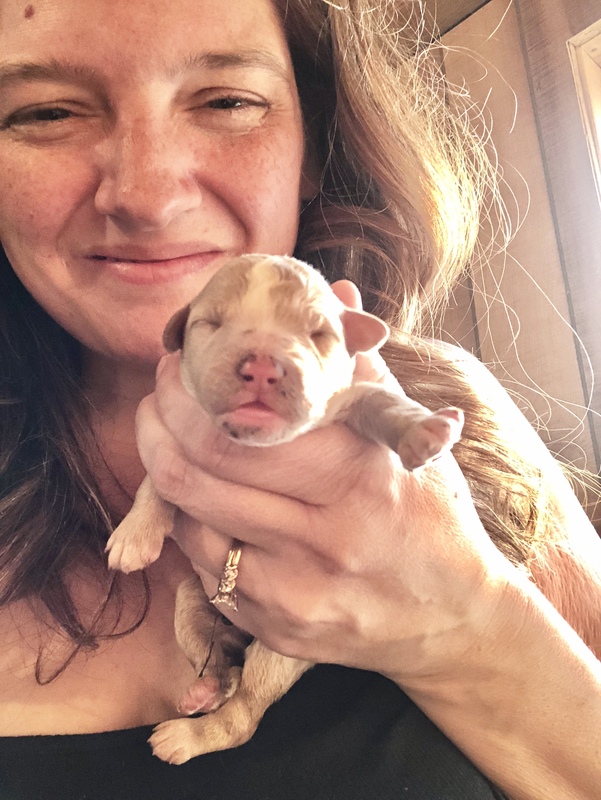 Now, before you fall asleep. . .scroll on down to see just what is happening in each of your litters this week. . .
It’s week 4!!! The puppies have grown so much over the past few weeks. They are walking and talking and now playing with toys and each other. This week we will begin to see those little personalities emerge. 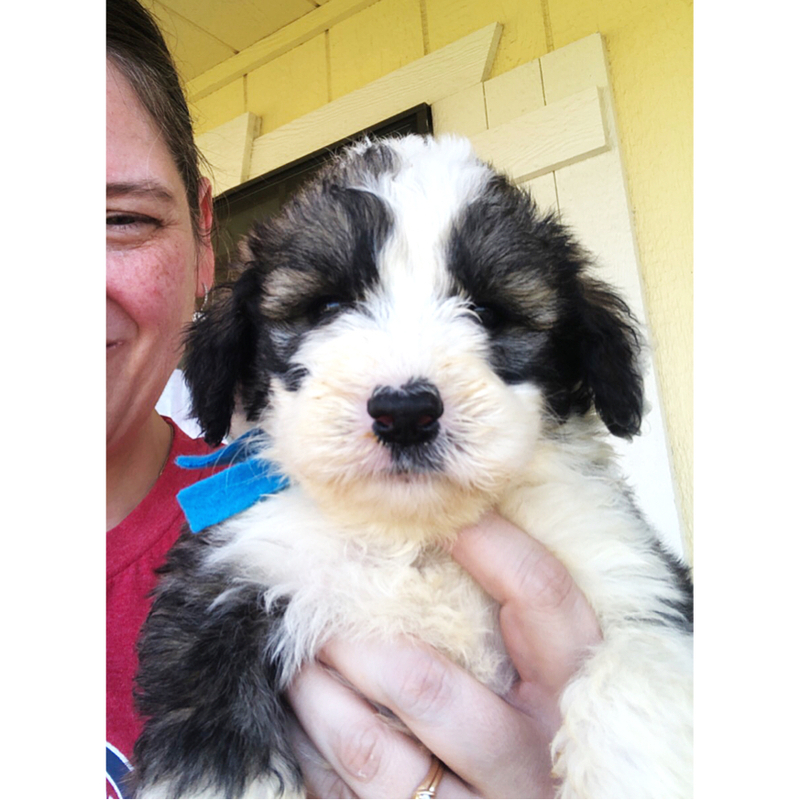 Each of you should have received directions to the farm as well as an email with puppy picking/pick up instructions. The puppies have been enjoying their gruel and this weekend they will be introduced to a few sprinkles of hard kibble in their food. They’re spending more prolonged periods without momma each day to prepare them for complete weaning. Momma is also enjoying more play time, especially in this beautiful weather! 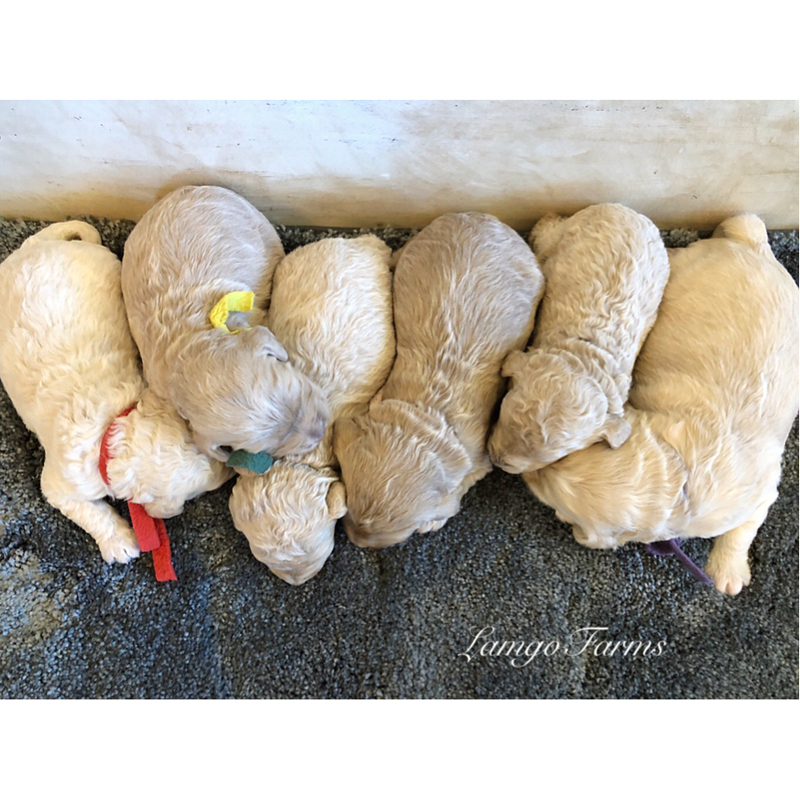 Next up is temperament testing, more socialization and the big one. . .the end of the weaning process and more potty training on grass! Week 6 we’ll administer the first set of shots and begin crate training. Look who is 3 weeks old!!! All eyes are open and we are seeing these sweet ones start to walk around instead of crawl. They have such adorable personalities already. They still do sleep a lot, but when they are awake, they pull out all of the cuteness. Right now the puppies have had their first deworming and are being socialized three times a day. 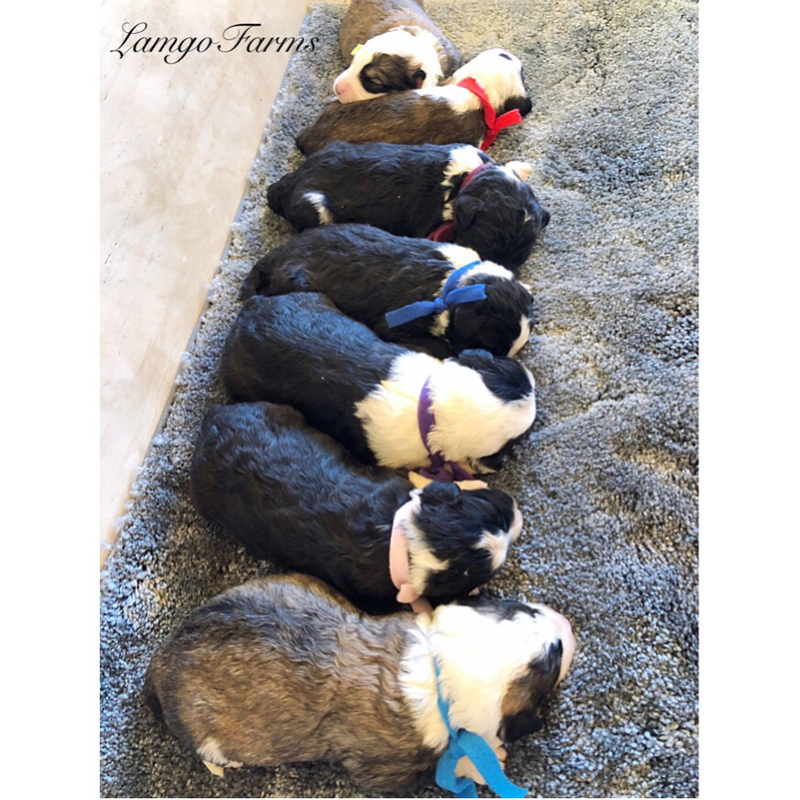 We work on sensory socialization meaning we turn them over onto their backs and massage their ears, paws and belly and then touch their nose. This constant human touch helps them bond and relax around people. 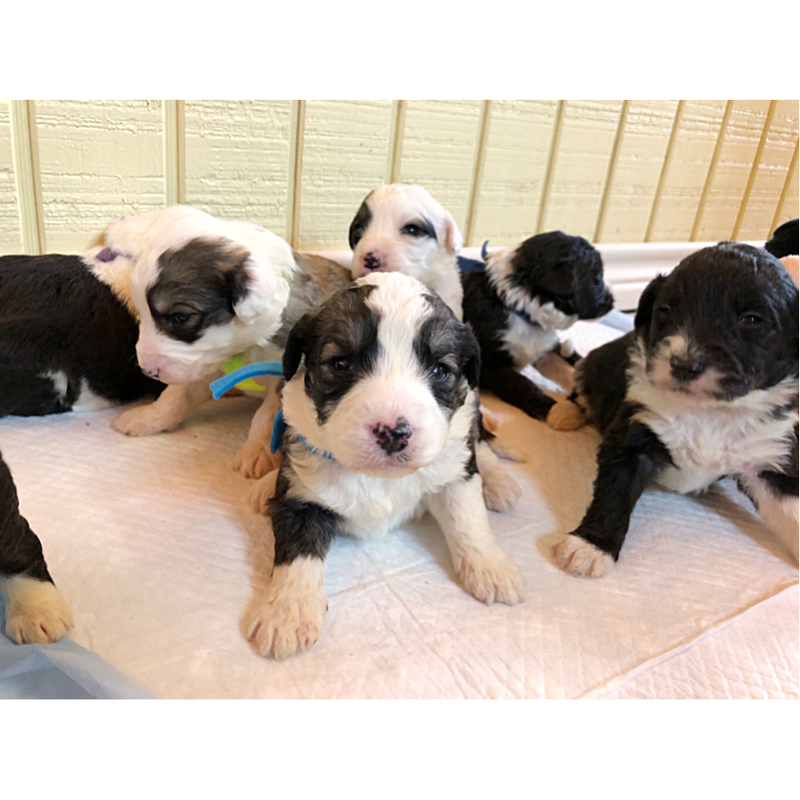 Although the puppies have plenty of milk from momma, we will begin the first stages of weaning which means they will start eating their fist food called gruel. 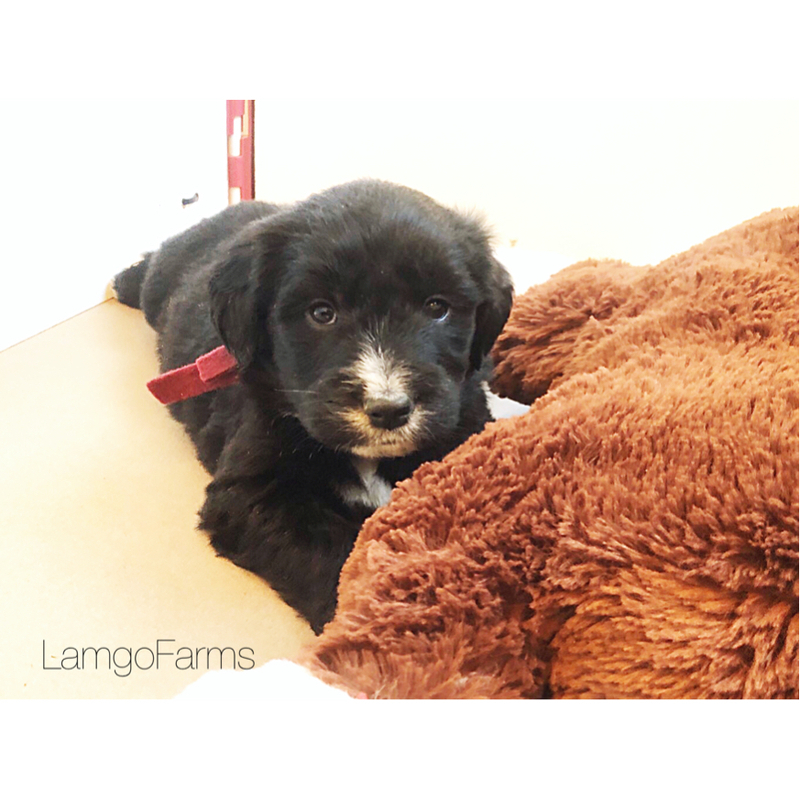 This is a little puppy mash that we make made up of premium puppy food, nutritional supplement, milk replace and warm water all blended to an oatmeal consistency. They absolutely LOVE it! During week 4 you will see those personalities really come out. We will also be emailing your directions to the farm as well as puppy picking/pick up instructions. This will all help you prepare for your selection as well as what needs to be done before going home. During week 5 we will have our temperament testing and will be emailing the results along with some reading material to assist you in training and to prepare you for upcoming stages. Lina’s inseminations are now complete. She took a little longer to ovulate- so our final insemination was just this weekend. Puppies will be due very end of April instead of mid April and will go home around late June. 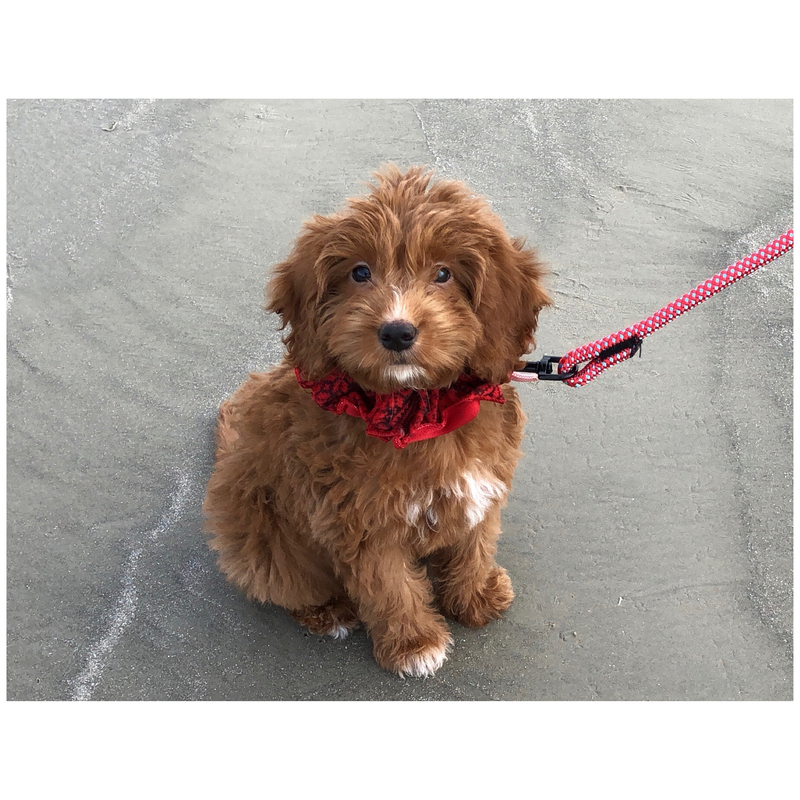 For those who will be on vacation during that time, please consider www.HiltonButler.com for boarding and puppy training. 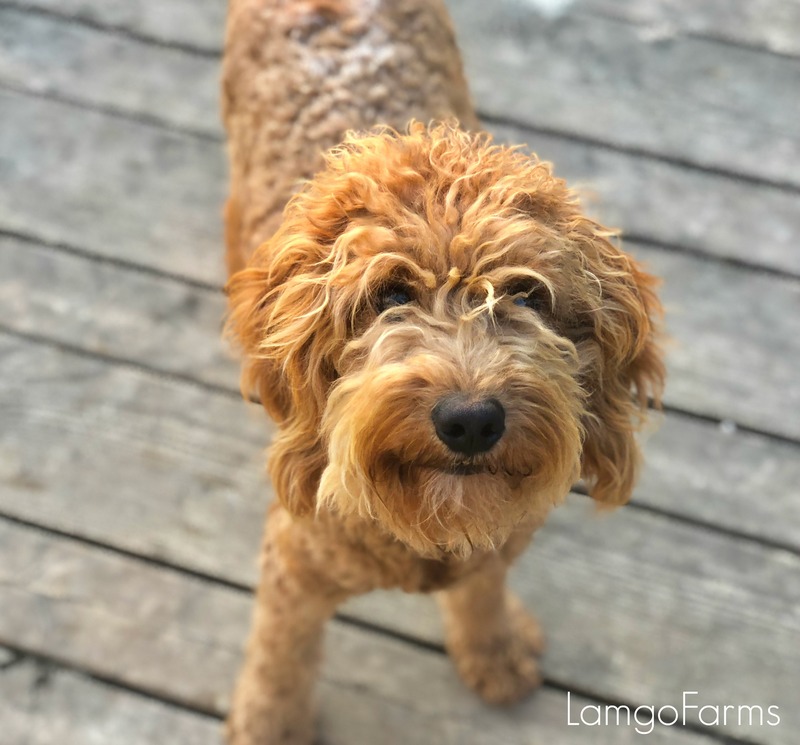 Welcome back to another update at Lamgo Farms! Happy St. Patrick’s Day! I trust everyone is doing well and getting some good rest this weekend. This week’s update is a little behind, but I wanted all picking lists too be updated prior to my posting. So, at this time, with the exception of a few double listings- I believe all lists are in order! Although I’m posting this on Sunday- the next update will be posted on Wednesday. So, we won’t have to wait long to see more pictures and hear more about what is happening. I think it’s finally spring on the Farm. And with that in mind- we will begin planing the gardens! I’m still a little shy about planting flowers. So, that might wait a bit. When we lived in Colorado- I planted flowers in July. Yep. That’s because it usually snowed in May and then in June we would get lots of hail. So, not only was July a safe bet weather wise, but there were always huge discounts as well! 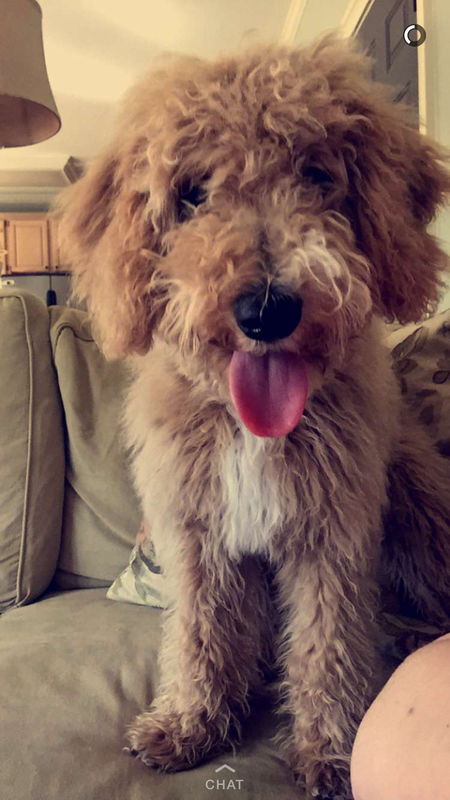 We’re currently up to our ears in puppy fluff and kisses. So, my ability to speak on the phone is now zero. Maybe once puppies go home. 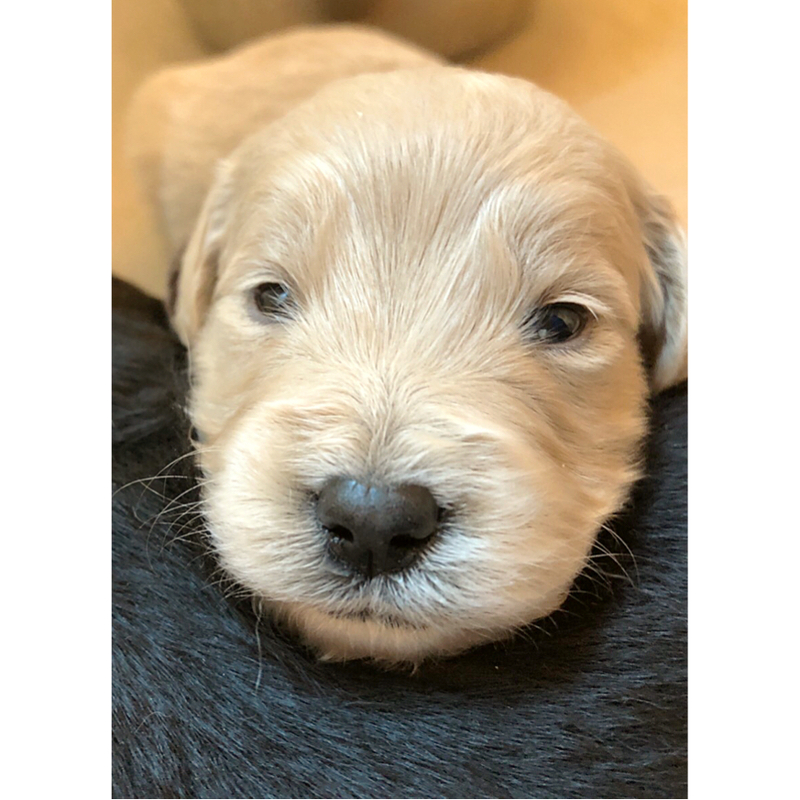 But for now, between the puppies and finishing up the school year- we’ll need all communication to be via text or email. Thank you all sooo much for your unending patience and kindness. Right now we are getting a lot of inquiries about upcoming litters. 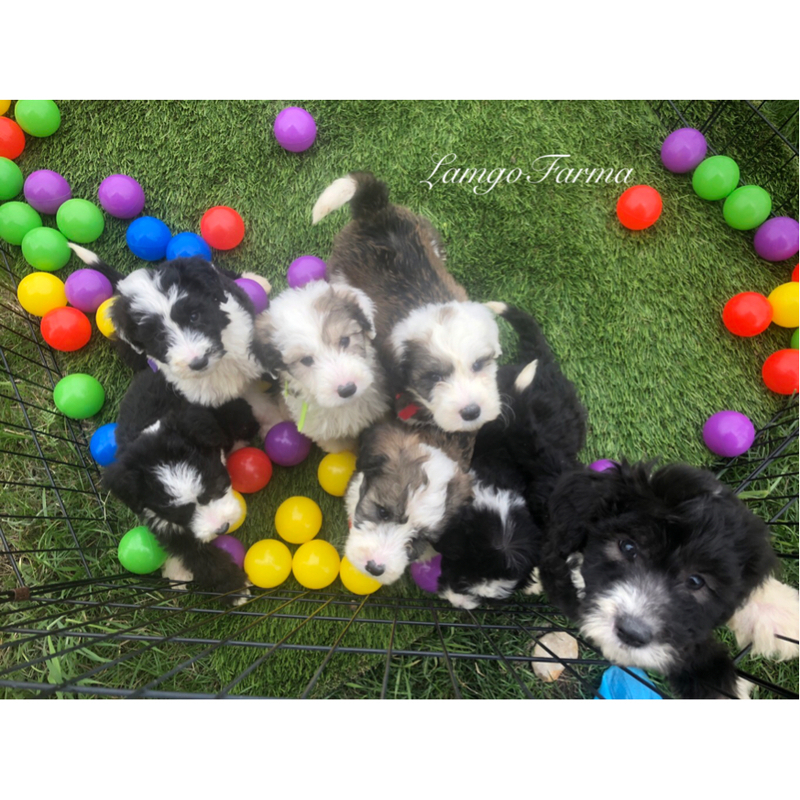 If you are new- you can scroll down and look through each litter. If you see the word “open” in a picking spot. . .right now, that means that spot is available. 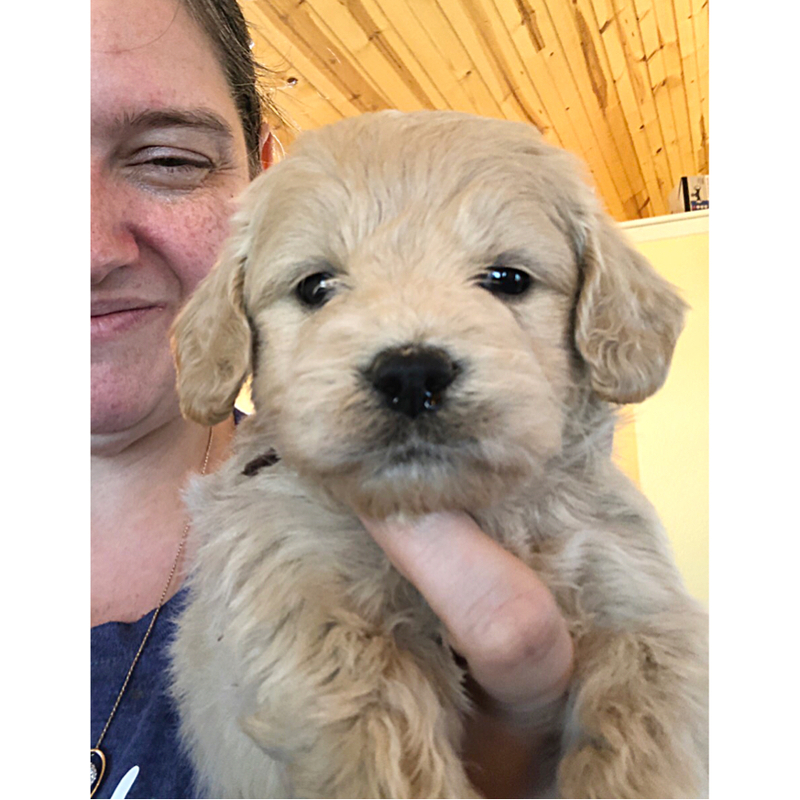 We have Brie/Duke Mini’s available, a few Golden Sheepies left, a few Sheepadoodles available and picking spots available in our Fall litters for Double doodles, Mini Goldendoodles and a Pocket picking spot available. 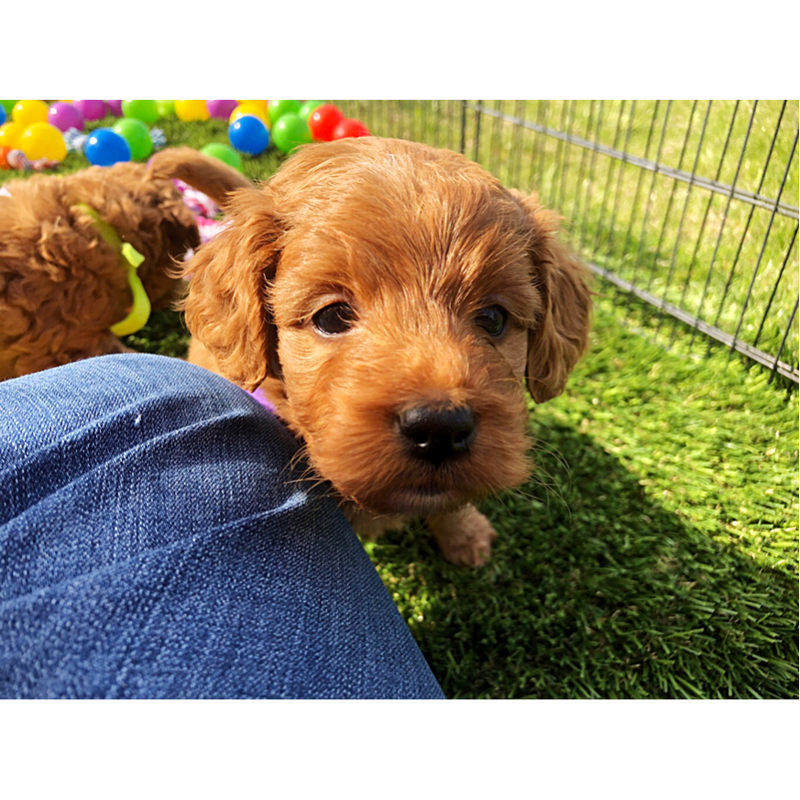 Otherwise, right now it is wait list only for our petites and other litters. As we’ve touched on before, we have several older momma’s retiring this next season. So our younger moms along with a few new ones will be taking over. At this time, we already have homes for some of those retiring and a few others will simply stay here since they are our pets and family. They just won’t be breeding. 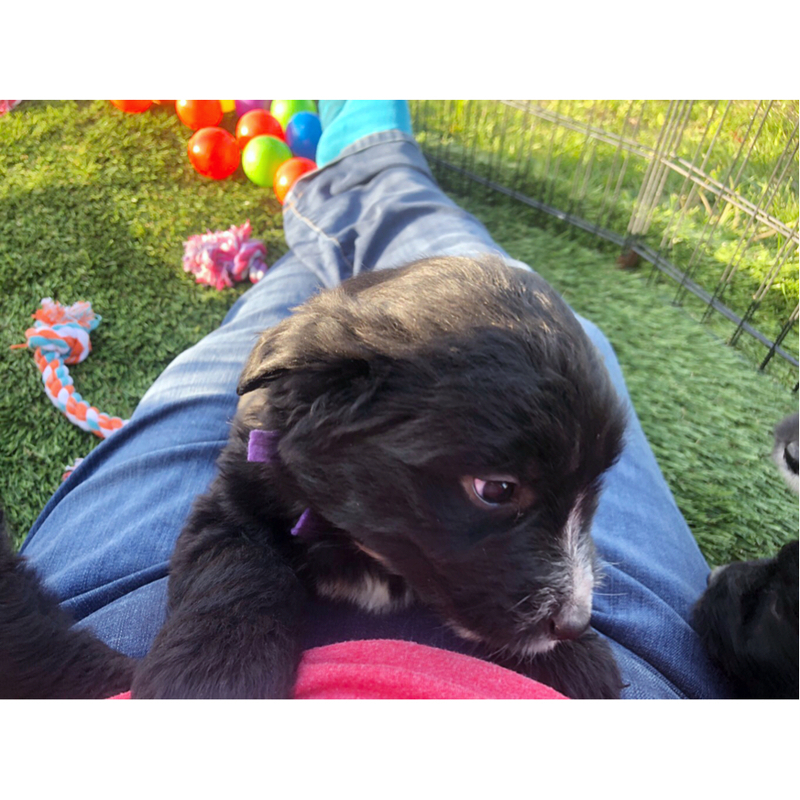 I won’t keep you any longer. . .scroll on down to see just what is happening in each of your litters this week. . .
Oh these little Panda bears have stolen our hearts! They are now moving around and eating their first food called Gruel wife a day. 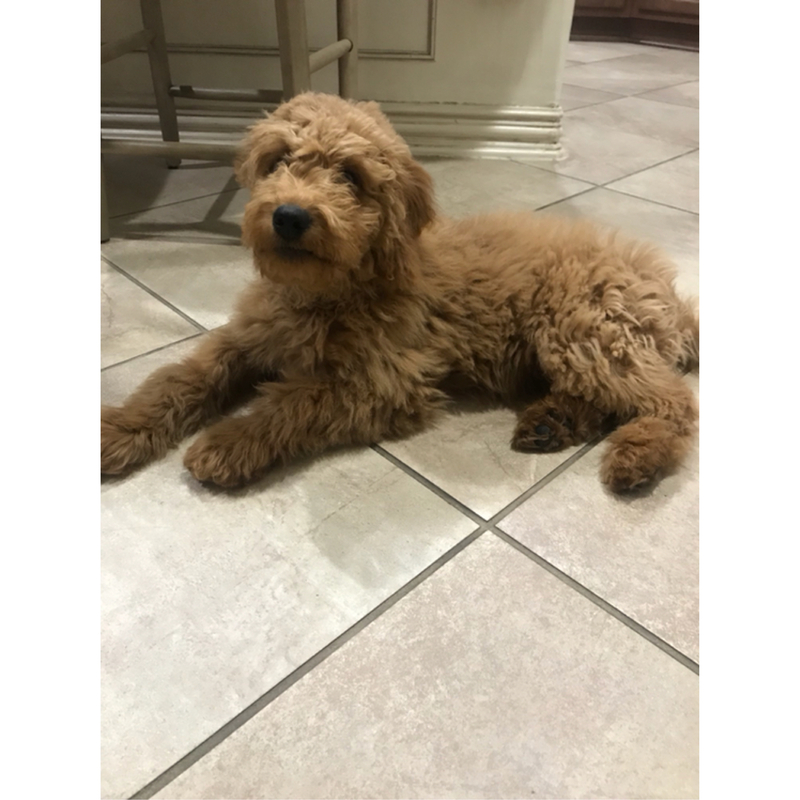 This is our own puppy mash made up of warm water, premium puppy food, nutritional supplement, and puppy milk replacer all blended up to an oatmeal consistency. They LOVE it! Now that the puppies eyes are all open, they are being socialized three times a day. Depending on the day- the mornings usually belong to my husband. Monday and Wednesday’s are my mornings. While the momma’s play outside, he tends to the clean up and holds each and every puppy. Once their school work is complete, my girls get to play with the puppies. 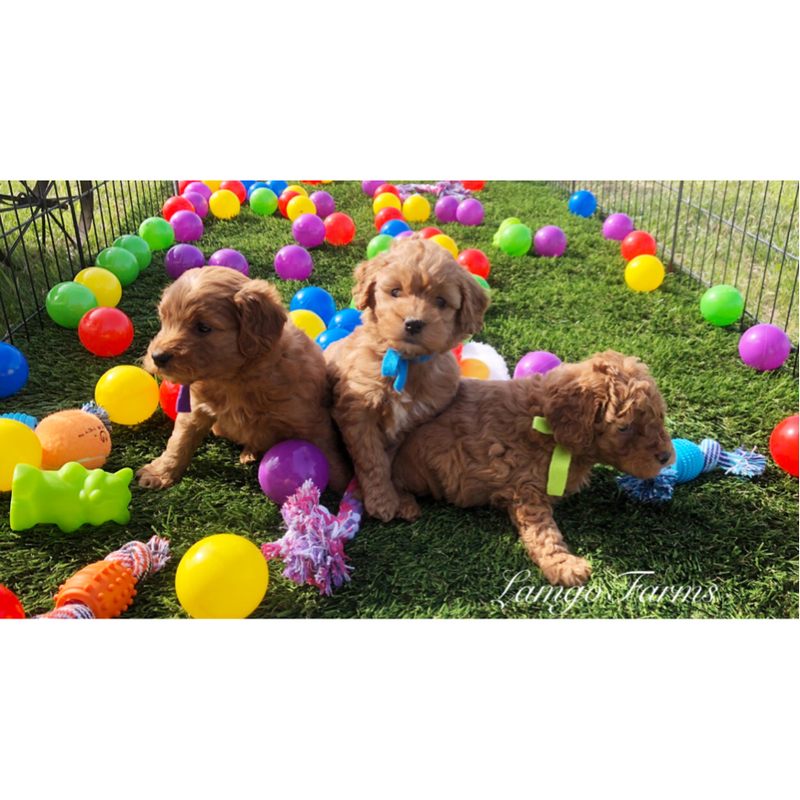 Over the many years of our working with puppies, they have learned how to properly socialize these little ones. They are held on their backs gently while massaging their ears and paws and then touch their noses while talking to them. This is a sensory technique to calm them, get them use to the human touch and to trust their new alpha. . .people. Finally, after their gruel time in the evening, my husband and I take turns in the final socialization moments of the day. During week 4 we will start to see those little personalities emerge. 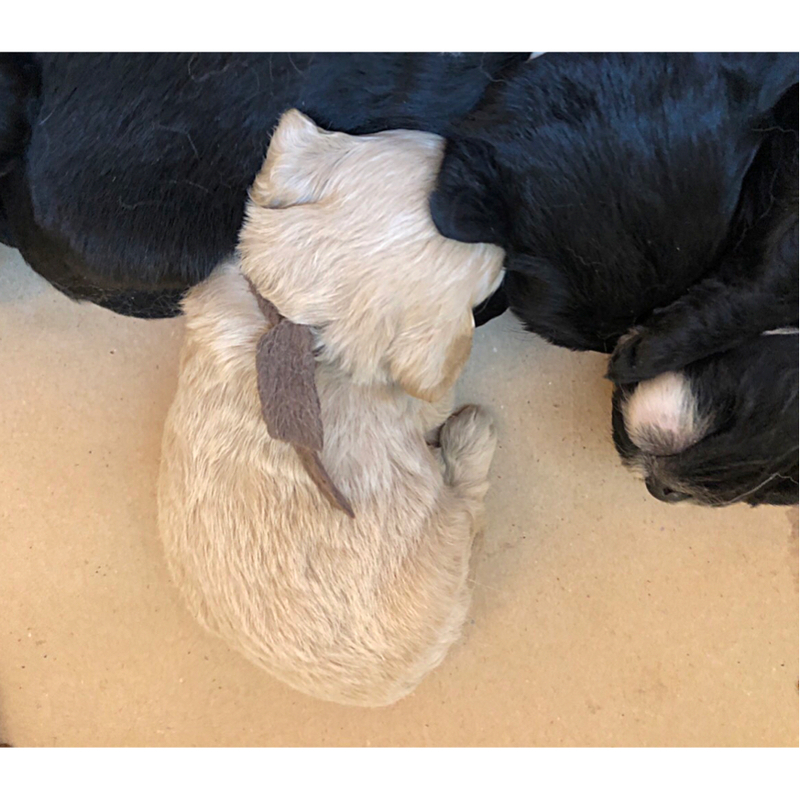 Everyone in the family that works with the puppies will begin carefully observing each behavior as we approach temperament testing during week 5. 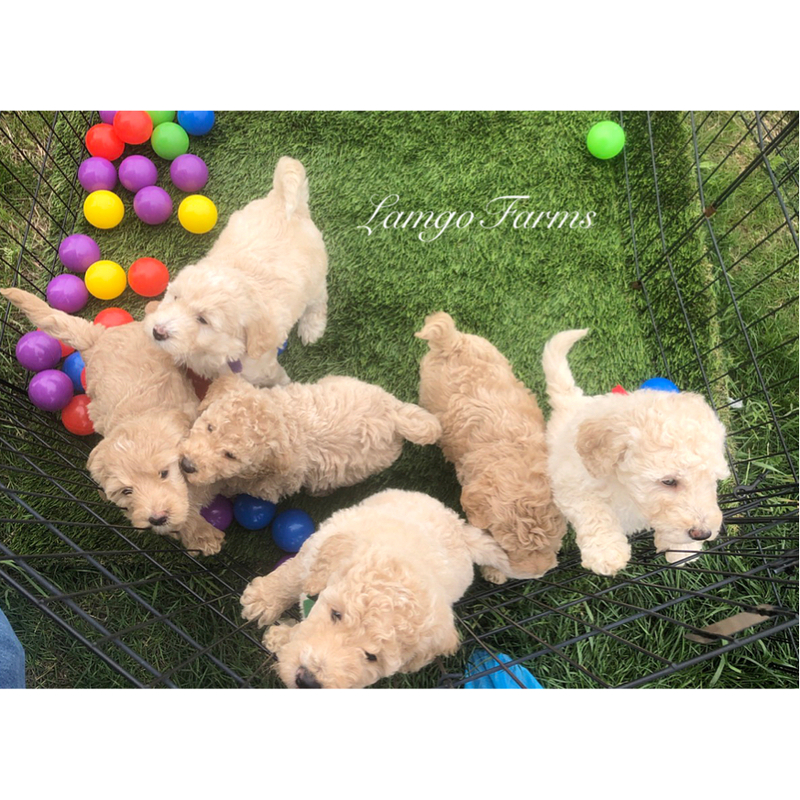 During week 4 each of you will receive an email with puppy picking instructions, directions to Lamgo Farms and a few more specifics about what will happen during puppy picking and pick up. 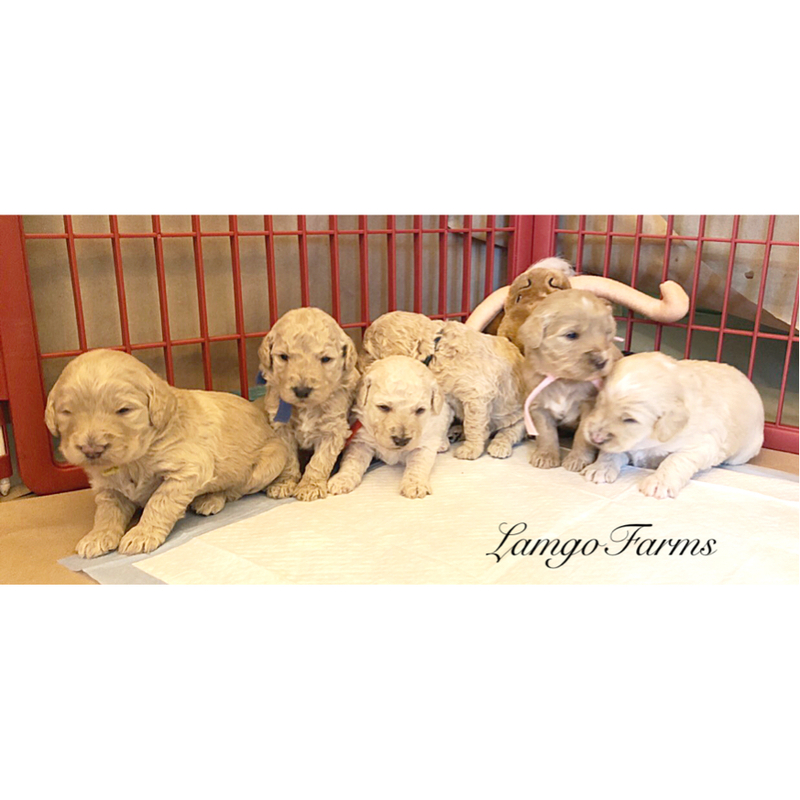 During week 5 you will receive an email with the temperament testing results and recommendations for each puppy. At week 6 you will receive a few more emails. One will be reading material to help prepare you for those first nights home. 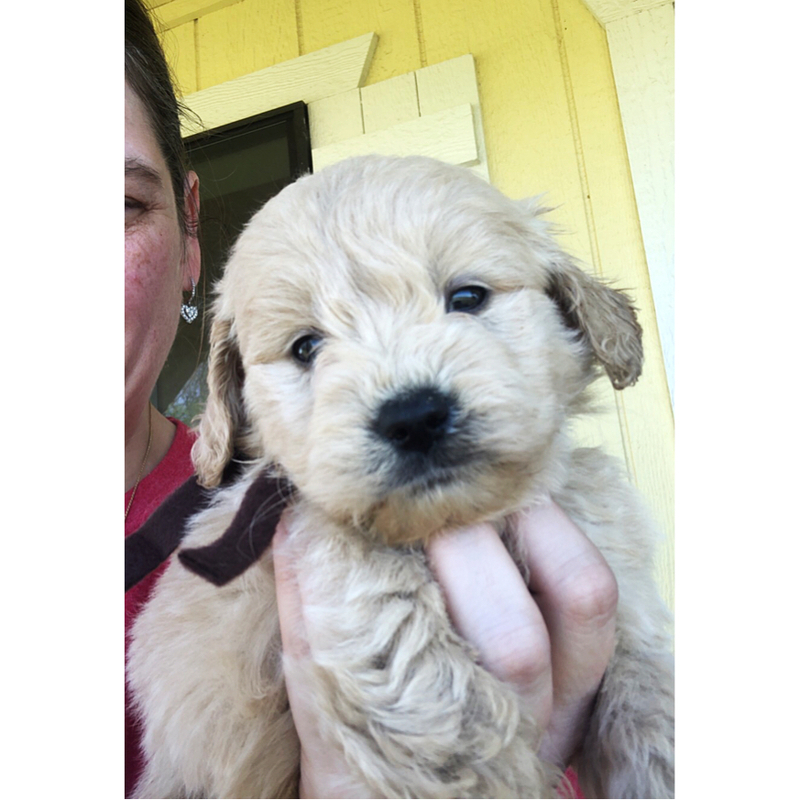 This will include our crate training procedures, potty training tips and the puppy’s schedule. Finally, you’ll receive your invoice for balances due. 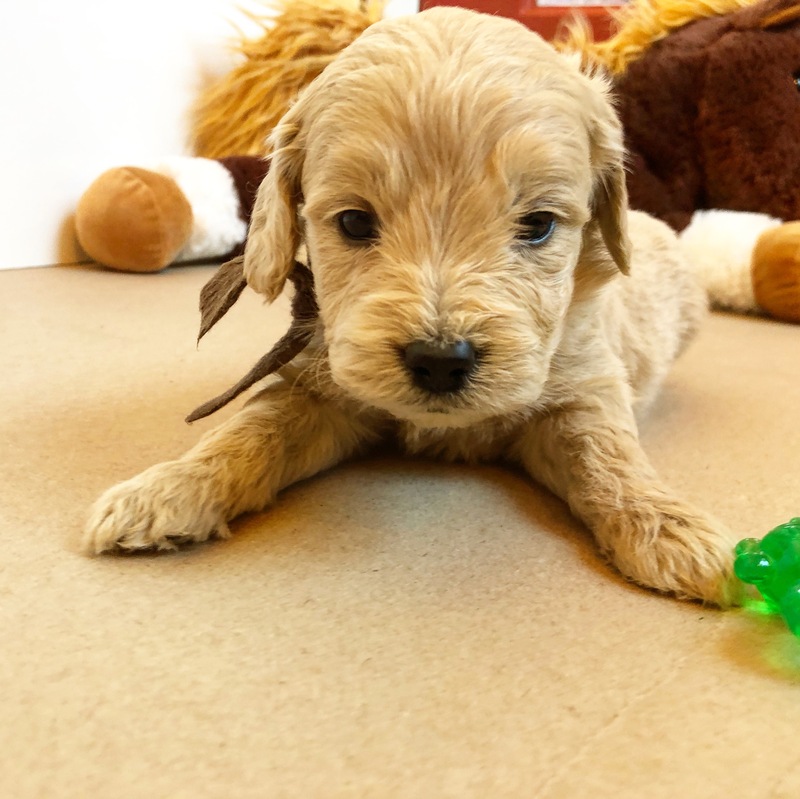 Hopefully this will all be well before you choose and pick up your puppy to allow you the time to prepare for the big day when puppies go home! 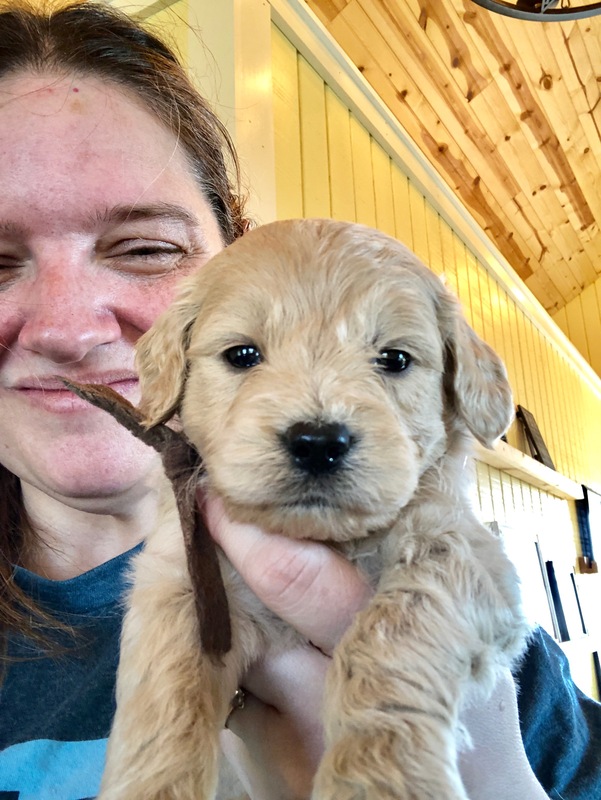 Puppy Picking/Pick up Schedule: We are having our picking and pick up on the same day this season. Right now, we are scheduling on Friday, April 19th. Please let me know what times of the day work best for you. Eavenson- would Friday around 10am work for you? If not, we can re-arrange. N. Campbell- Female preference- Let me know what works for your schedule. 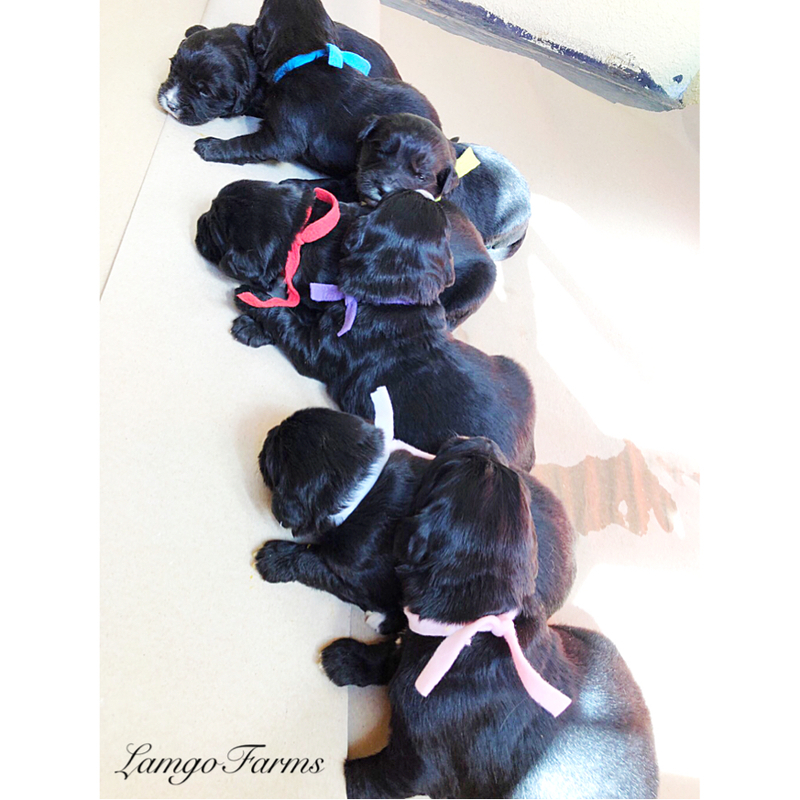 The girls’ collar colors are: Bright Blue (Turquoise), Light Pink, Purple, White, and Burgundy. The boy’s collar colors are lime green and red. I cannot believe these adorable little faces! I’m loving being able to watch them grow. They are now moving around and eating their first food called Gruel wife a day. 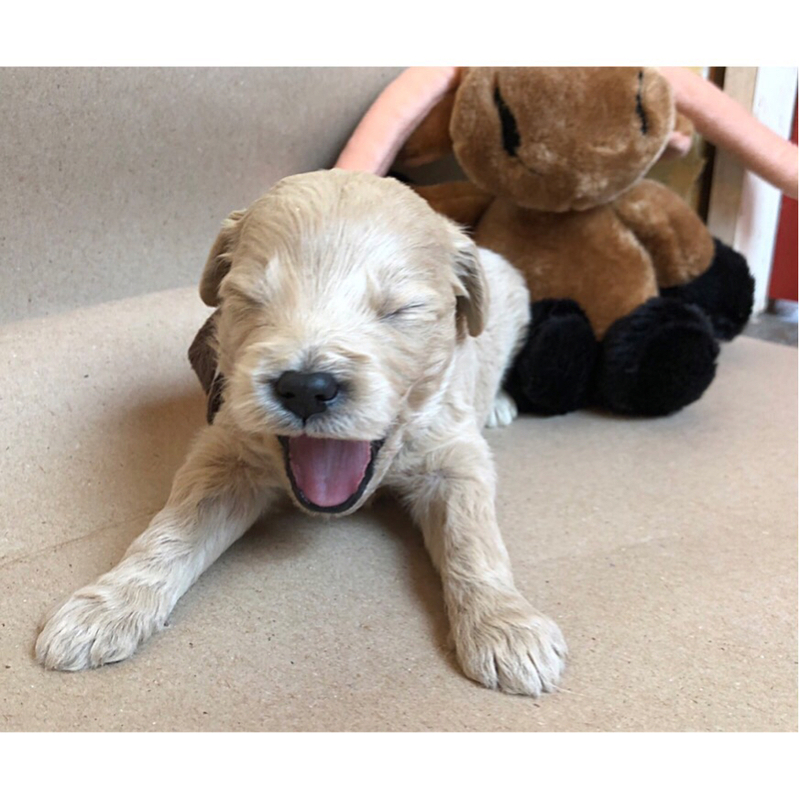 This is our own puppy mash made up of warm water, premium puppy food, nutritional supplement, and puppy milk replacer all blended up to an oatmeal consistency. They LOVE it! Now that the puppies eyes are all open, they are being socialized three times a day. Depending on the day- the mornings usually belong to my husband. Monday and Wednesday’s are my mornings. While the momma’s play outside, he tends to the clean up and holds each and every puppy. Once their school work is complete, my girls get to play with the puppies. 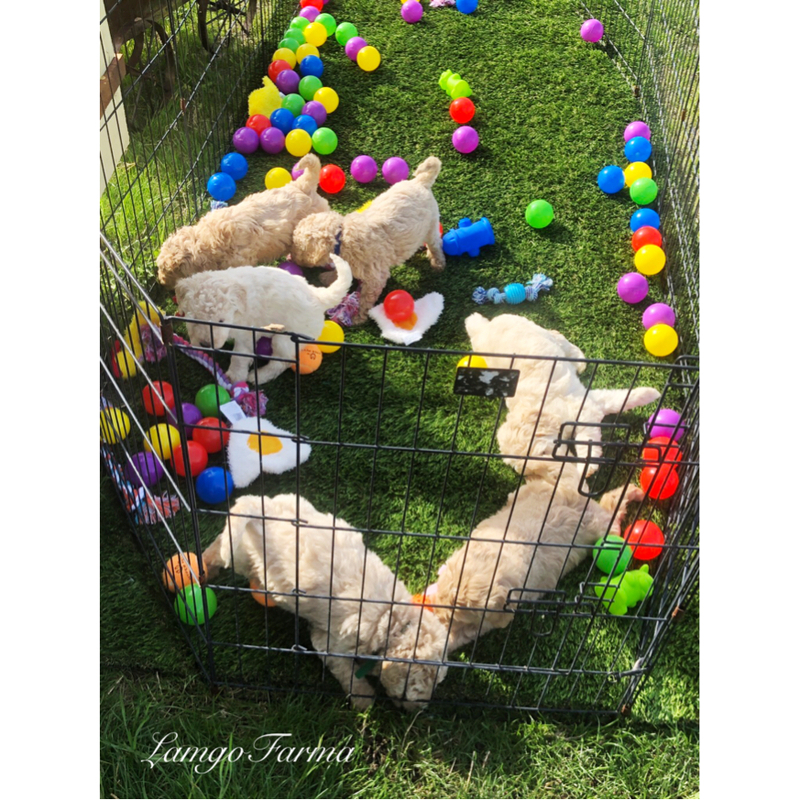 Over the many years of our working with puppies, they have learned how to properly socialize these little ones. They are held on their backs gently while massaging their ears and paws and then touch their noses while talking to them. This is a sensory technique to calm them, get them use to the human touch and to trust their new alpha. . .people. Finally, after their gruel time in the evening, my husband and I take turns in the final socialization moments of the day. They are now moving around and eating their first food called Gruel wife a day. 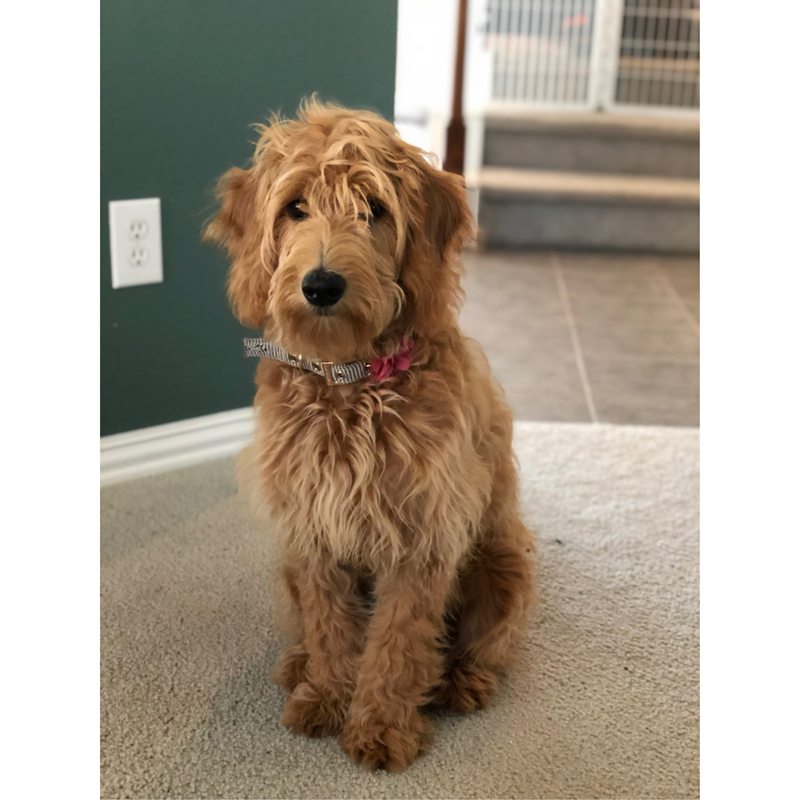 This is our own puppy mash made up of warm water, premium puppy food, nutritional supplement, and puppy milk replacer all blended up to an oatmeal consistency. They LOVE it! Now that the puppies eyes are all open, they are being socialized three times a day. Depending on the day- the mornings usually belong to my husband. Monday and Wednesday’s are my mornings. While the momma’s play outside, he tends to the clean up and holds each and every puppy. Once their school work is complete, my girls get to play with the puppies. 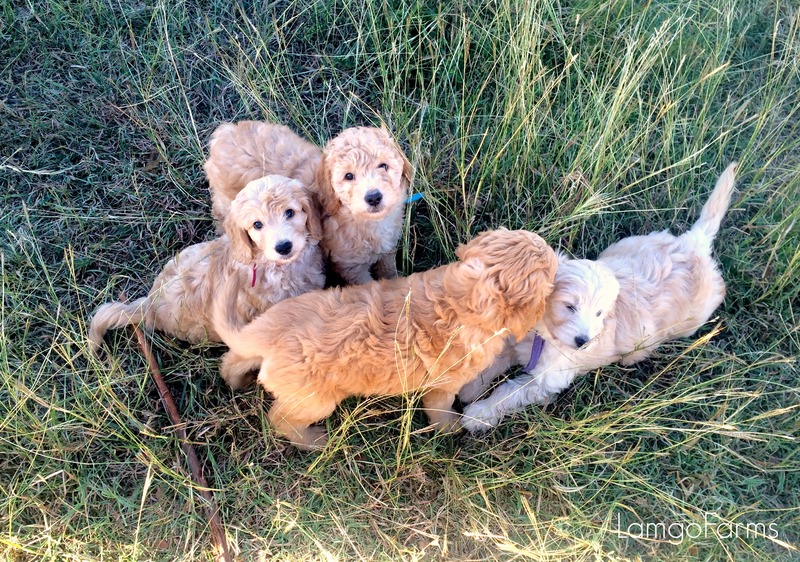 Over the many years of our working with puppies, they have learned how to properly socialize these little ones. They are held on their backs gently while massaging their ears and paws and then touch their noses while talking to them. This is a sensory technique to calm them, get them use to the human touch and to trust their new alpha. . .people. Finally, after their gruel time in the evening, my husband and I take turns in the final socialization moments of the day. Picking/Pick up is scheduled on the same day on Saturday, April 13. For those choosing long distance and flying- we will schedule around the flight Nanny’s schedule. Open (this spot is only available to owners without a gender or coat type preference) 3pm picking time. Eyes and ears are all open now! 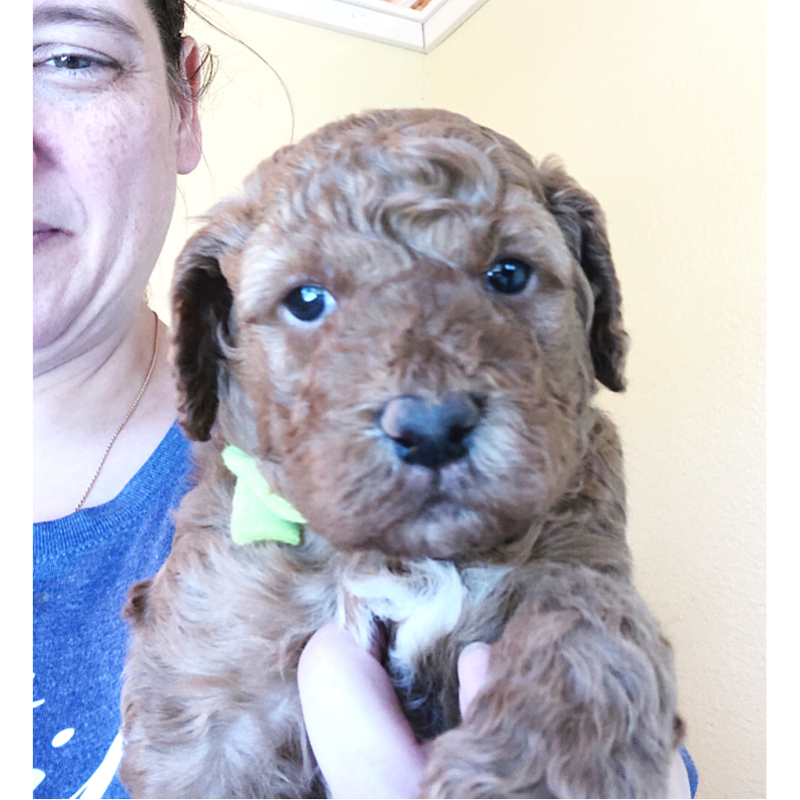 Week 2 begins potty training- so this weekend the puppies will be introduced to their potty pads just off of their bedding. They’ll crawl too the pad to potty and then they’ll crawl back into bed. We will eventually start moving the potty pads farther and farther away so they learn to seek them out to potty. This is all part of our potty training process that leads to ultimate house training. During week 2, the puppies will receive their first deworming. After a momma dog gives birth, she can shed worms. I know, it sounds gross, but this is all part of the canine world. 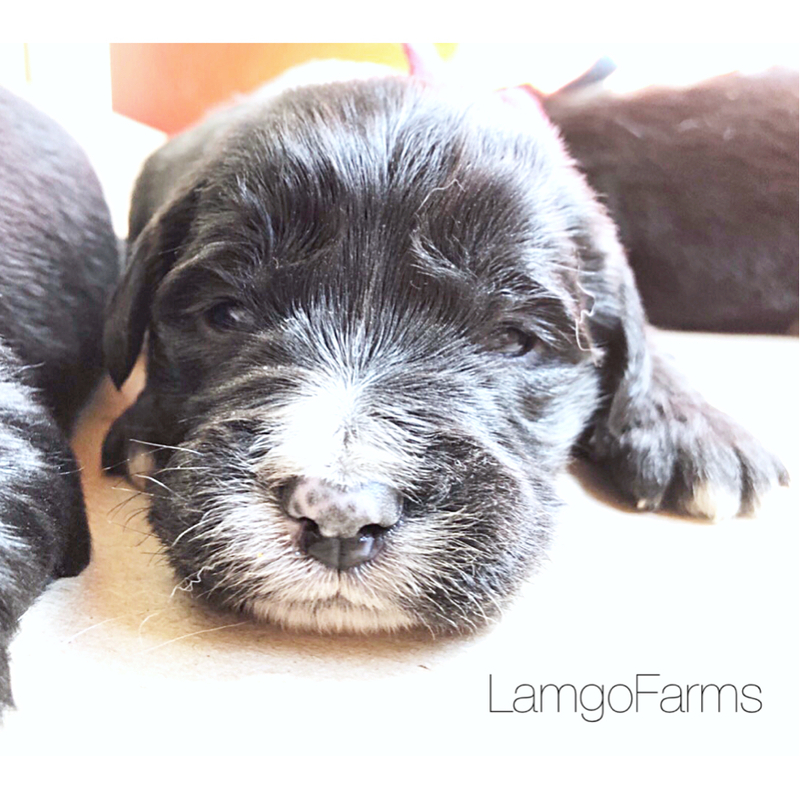 Because worms can travel from momma through nursing, we pre-treat all the puppies by giving them a dewormer as well as their momma at weeks 2, 4 and 6. Your Vet will continue this process until you are on a regular monthly worming regiment. Next, video will begin at week 3. 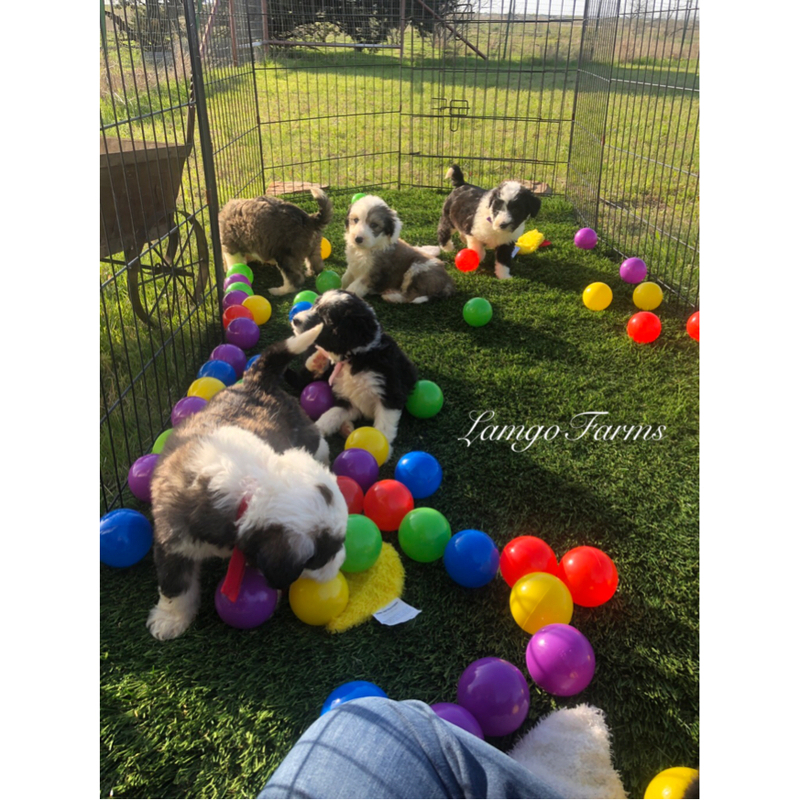 I’ll have a link here to our Youtube channel, “Happenings at Lamgo Farms.” Of course, you can subscribe to that channel as well as our photo gallery at photos.LamgoFarms.com an subscribe as well. By subscribing- you’ll be notified whenever we add something. I usually upload video and pictures prior to the update. Week 3 begins our first weekly video! The first video usually doesn’t have a lot in it as the puppies aren’t moving around very much. But by week 4, you will see them running around and those little personalities will begin to emerge. 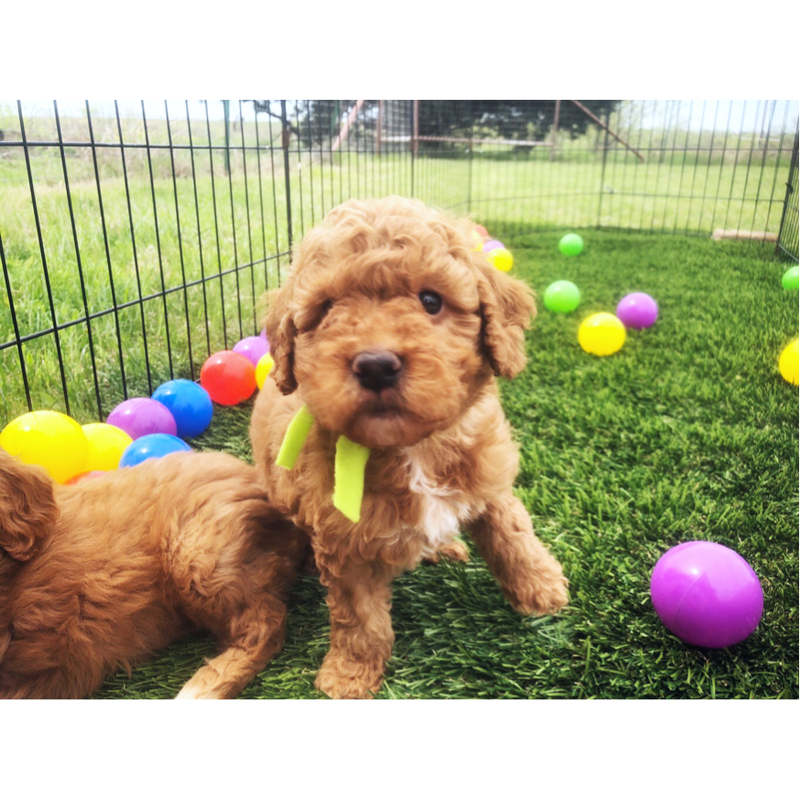 Puppy Picking/Pick up: The puppies will be ready to go home the day before Easter on Saturday, April 20. Because of the holiday- I would like to see which works best for you. The 20th or the following Saturday, the 27th. Shoot me a message to let me know. 817-366-7995. Thanks! Boston has started her cycle early. We will begin inseminations shortly. For those with timing issues- let me know. I see we have several double listed. These are petites. They will be smaller than our miniatures but a tad larger than our pockets. If we begin inseminations this weekend puppies will be due around May 10 with puppies going home mid July. For those double listed- you can stay on both of your lists until puppies are a week old. Then we’ll ask you to choose your litter. 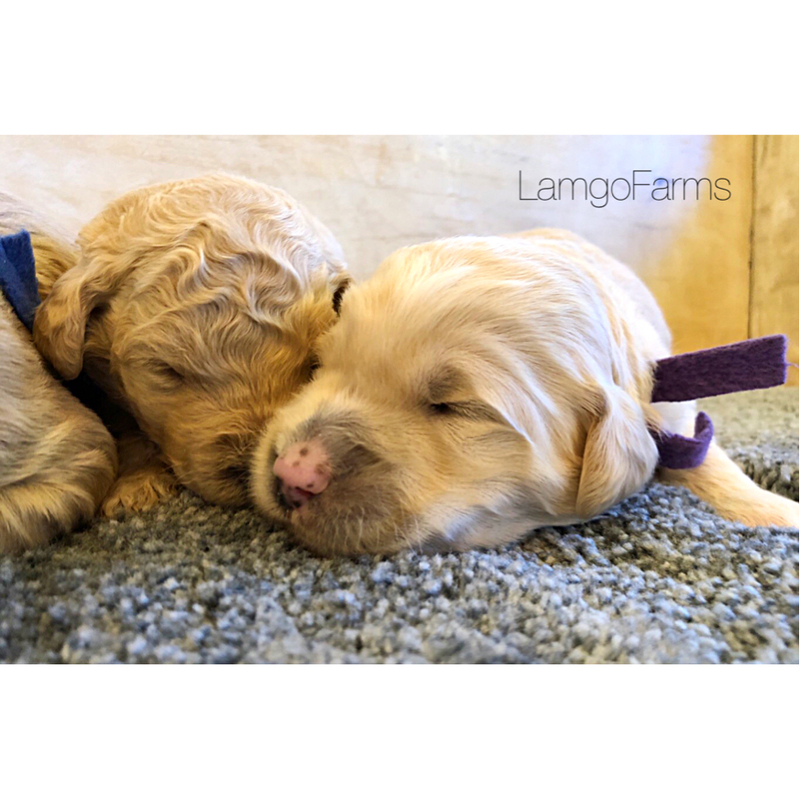 Welcome to this week’s update at Lamgo Farms! I’m so happy you’ve found your way to this page. 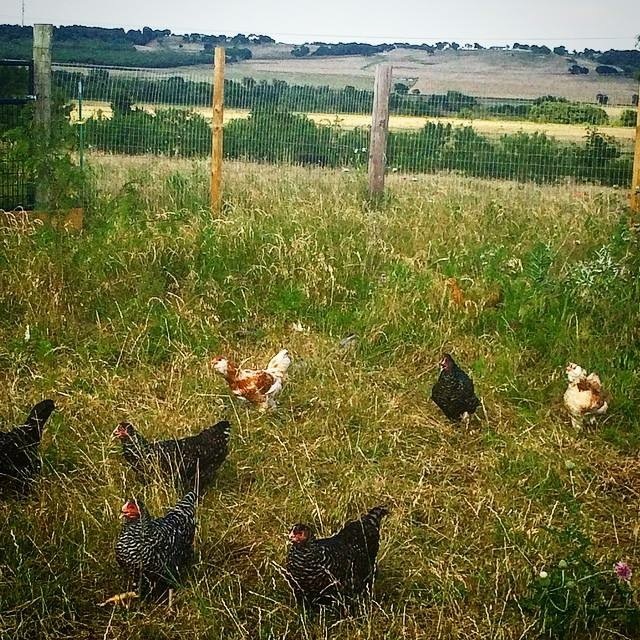 As usual, our lives with our eight kiddos, dogs, horses, chickens, cows and apparently a few barn owls- we have been super busy and going at full speed ahead. We have so many exciting things happening right now, it’s hard to know where to start. 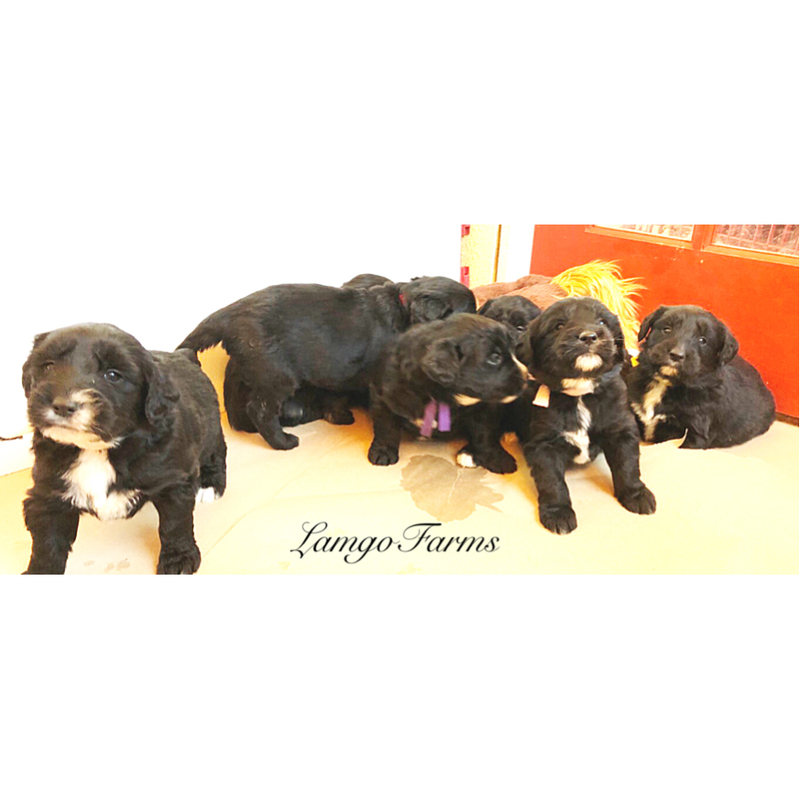 First, we have our four litters of puppies all growing and thriving and just being as cute as ever! It’s hard work. It’s busy work. But it’s great work! I love it. 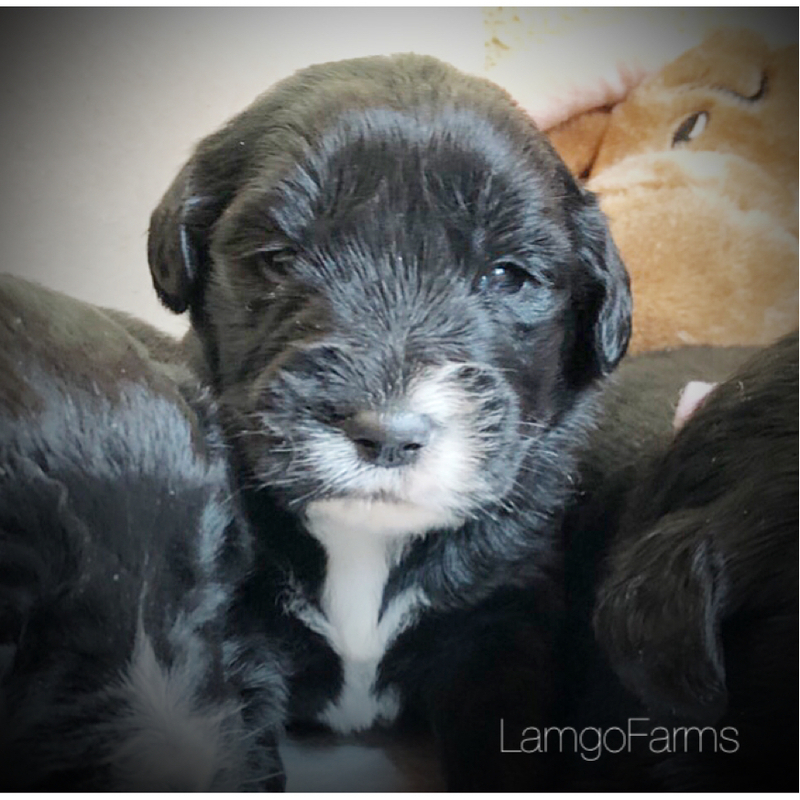 Next and oh so exciting. . .It’s technically Friday the 8th and in about 12 hours, our little girl, Sara will officially join the Lamgo Family. Our youngest three children have joined our family through adoption. And later today, we will go to the courthouse to make Sara’s adoption official! So if you can’t get ahold of me today. . .that’s why! Thank you all so much for your unending patience over the past three years as my time has been divided while we’ve welcomed these three precious people into our lives. 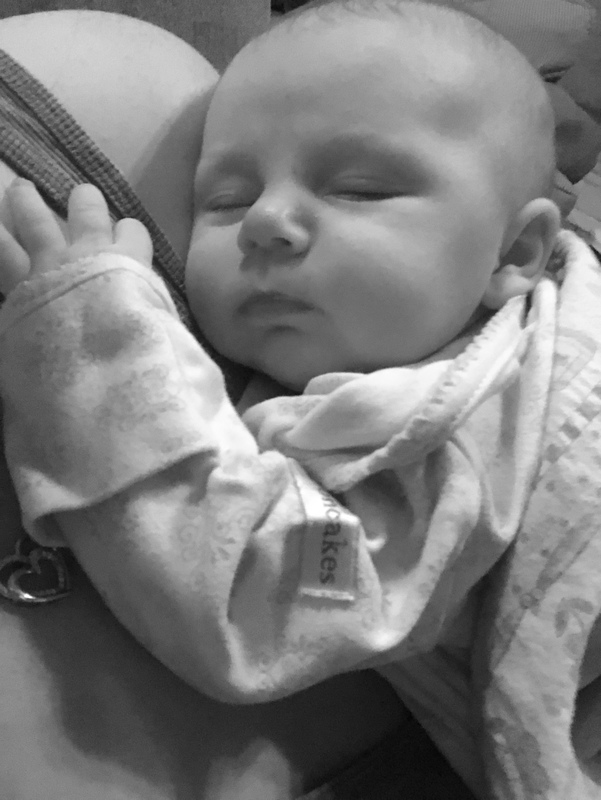 It’s been crazy busy starting all over with newborns, but it’s been the best thing ever! WE cannot imagine our lives any other way. Now, we have updates and pictures of our new litters along with some announcements on Bella and Boston’s litters. 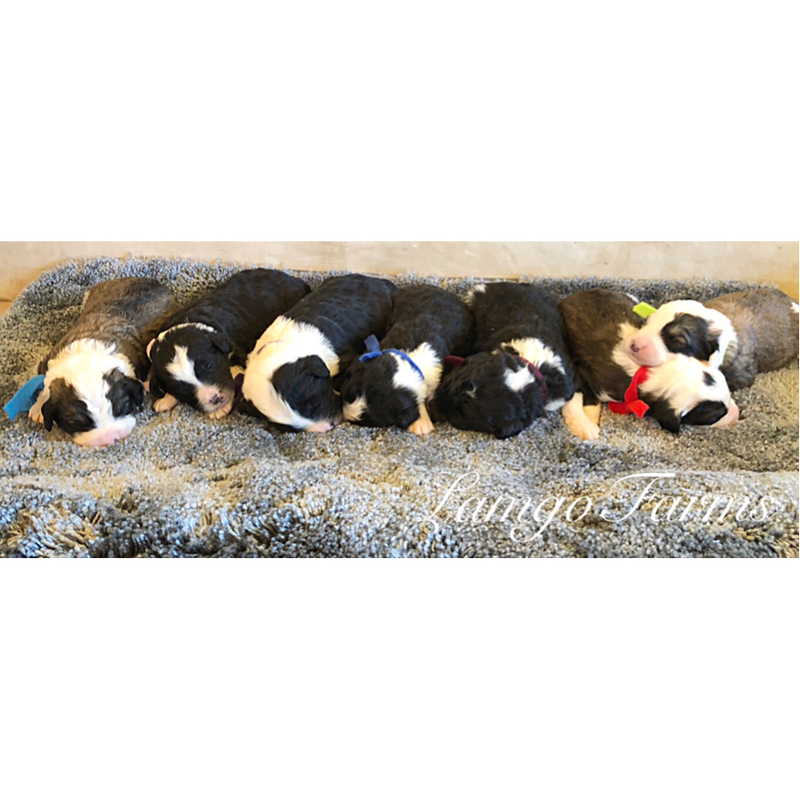 Scroll on down to see just what is happening in each of your litters. I’m gonna back on out of here and try to get Sara back to sleep. She’s currently laying here next to me kicking my hand as I try to type. Haha! God is good guys! Even in the busy and hurry and unexpected. He is oh so good! Poppins is being a great mommy and the babies are growing and just the cutest things ever. We should start to see eyes opening this weekend, so their next pictures will show a little personality! Right now the puppies are still spending their days nursing and sleeping. Since their eyes and ears aren’t open yet, they find momma by sense of smell. Poppins not only feeds the babies, but she cleans up after them too. That will start to change in the next few weeks. We should see the eyes and ears open at any time now. Week 2 begins potty training- so this weekend the puppies will be introduced to their potty pads just off of their bedding. They’ll crawl too the pad to potty and then they’ll crawl back into bed. We will eventually start moving the potty pads farther and farther away so they learn to seek them out to potty. This is all part of our potty training process that leads to ultimate house training. During week 2, the puppies will receive their first deworming. After a momma dog gives birth, she can shed worms. I know, it sounds gross, but this is all part of the canine world. 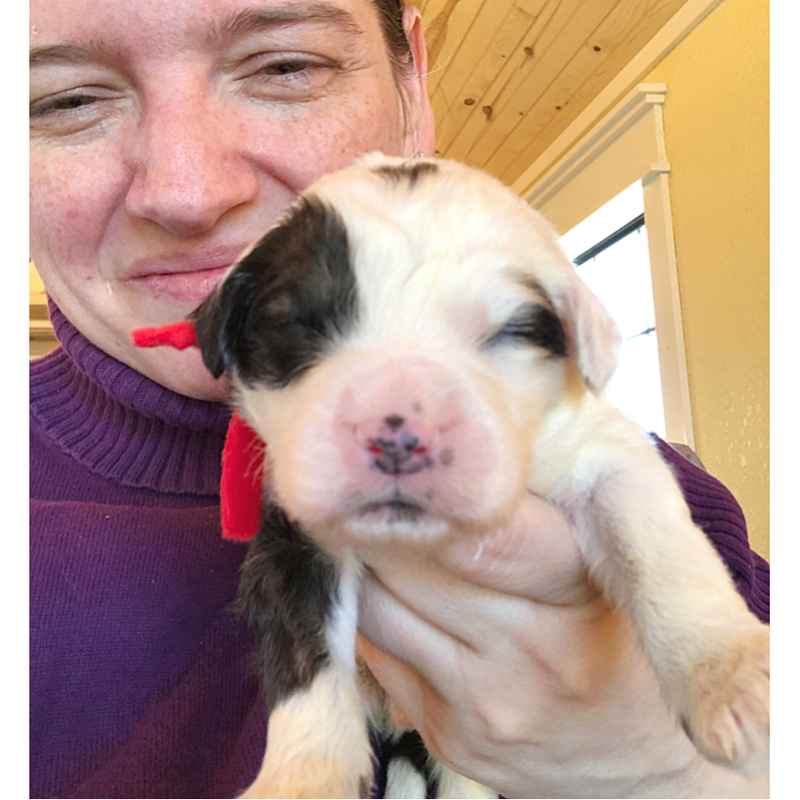 Because worms can travel from momma through nursing, we pre-treat all the puppies by giving them a dewormer as well as their momma at weeks 2, 4 and 6. Your Vet will continue this process until you are on a regular monthly worming regiment. Next, video will begin at week 3. 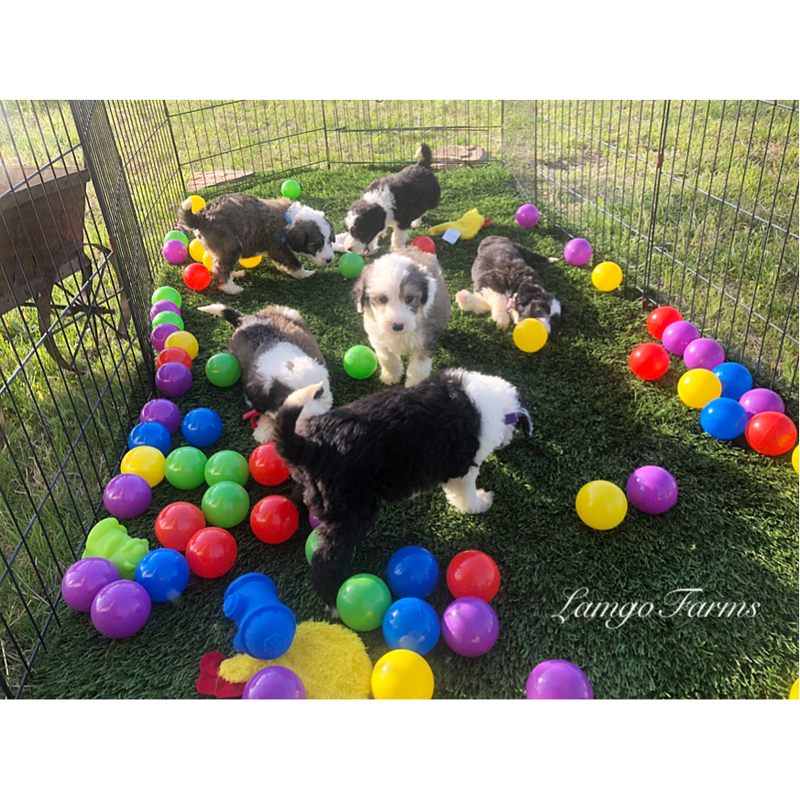 I’ll have a link here to our Youtube channel, “Happenings at Lamgo Farms.” Of course, you can subscribe to that channel as well as our photo gallery at photos.LamgoFarms.com an subscribe as well. By subscribing- you’ll be notified whenever we add something. I usually upload video and pictures prior to the update. 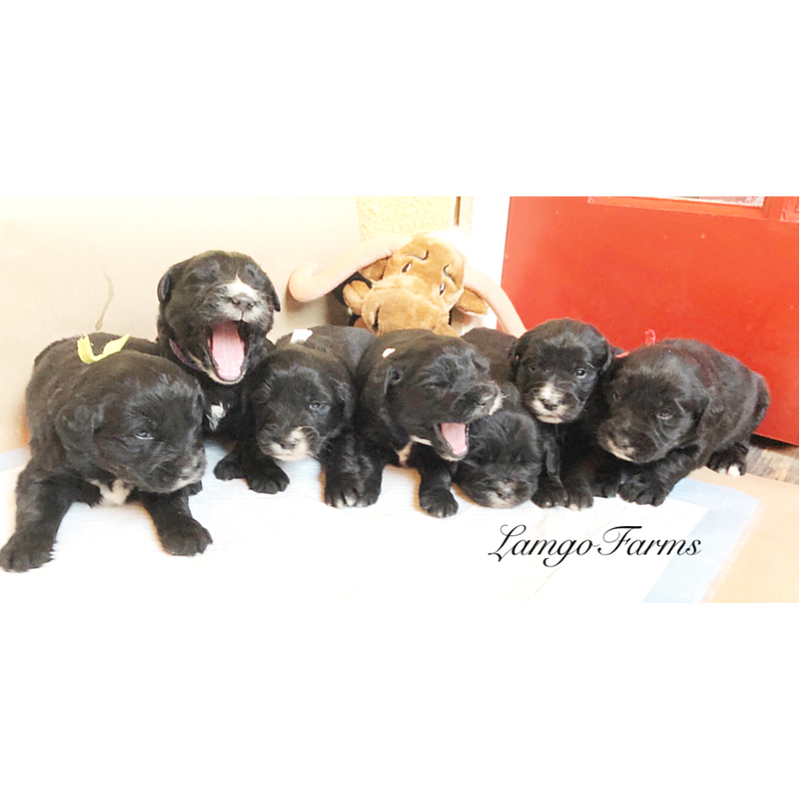 Although this breeding was not originally planned, it seems that God has allowed the most beautiful puppies to enter Lamgo Farms! 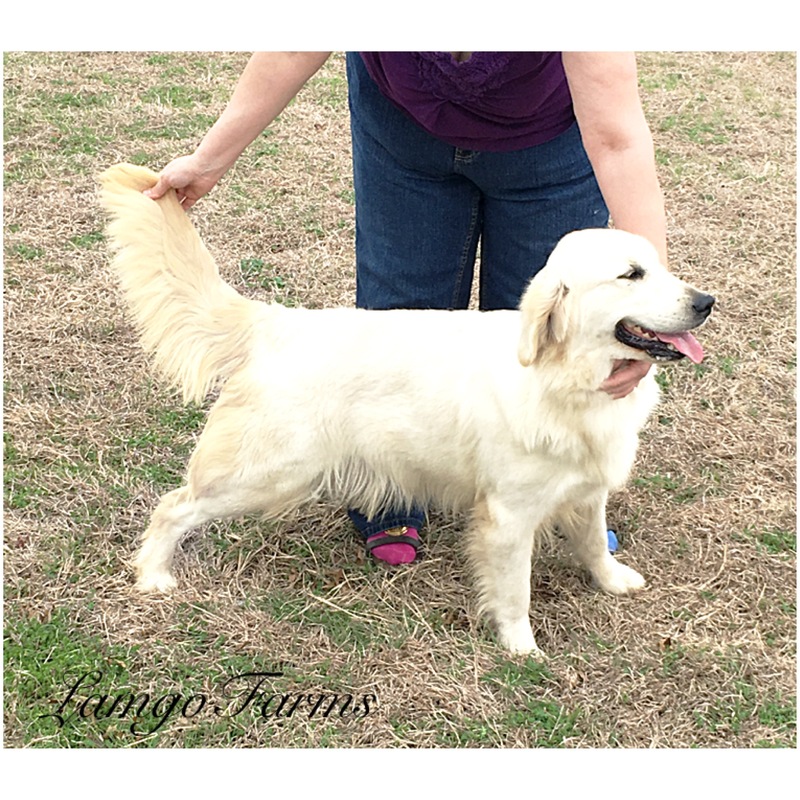 English Golden Sheepies are a mixture of our AKC Registered English Creme Golden Retriever Dam and our AKC Registered Old English Sheep Dog Sire. 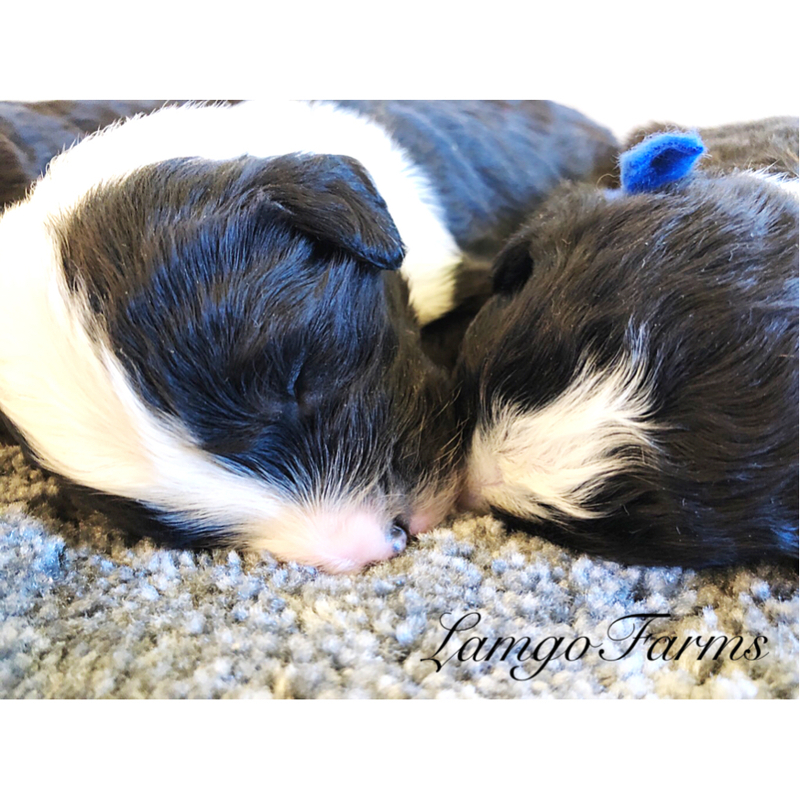 This is a first litter, so we do not have past puppy pictures, but a few links to a few Instagram pages for you to see what one of these beauties looks like fully mature. Oh these sweet plump babies are driving me crazy! I can’t for the life of me imagine picking just one to stay. Little light pink kind of has my eye- but then someone else comes along and I’m torn. I will make up my mind at week 6 prior to the official picking/pick up so everyone will be prepared. The puppies have eyes and ears open and are moving quite quickly to find momma. 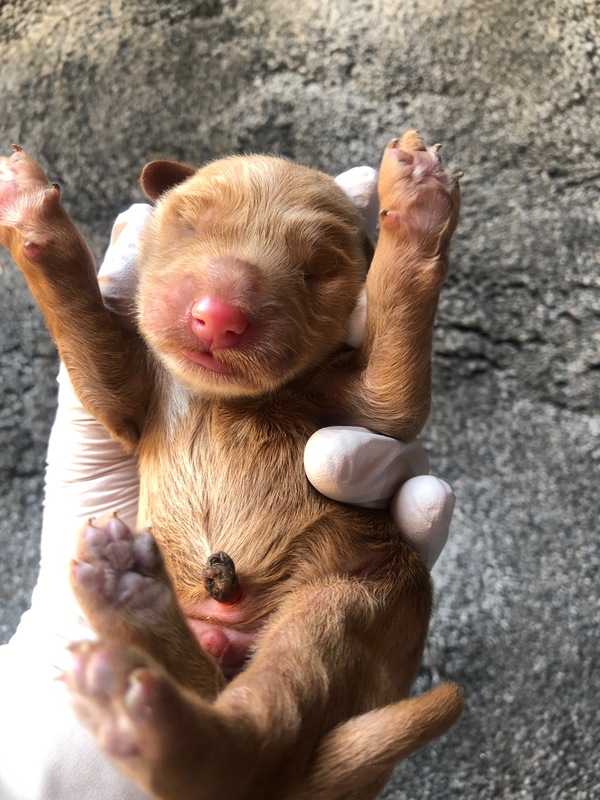 We are seeing only a few eyes open right now, although most of the puppies seem to react to noise, their taking a few extra days for everyone to open all the way up. The puppies are doing great, growing and spending their days nursing and sleeping. Brie is an expert momma and is just chilling with her babies most of the time. She’s been enjoying some outside time the last few days with the nice weather. Lilly is still doing great! She is a wonderful first time momma! While Snowflake, Poppins and Brie are in the puppy picking building, Lilly is here in the house with me. The babies are growing and I’m seeing they are a nice “Mrs. Beasley” size and color. 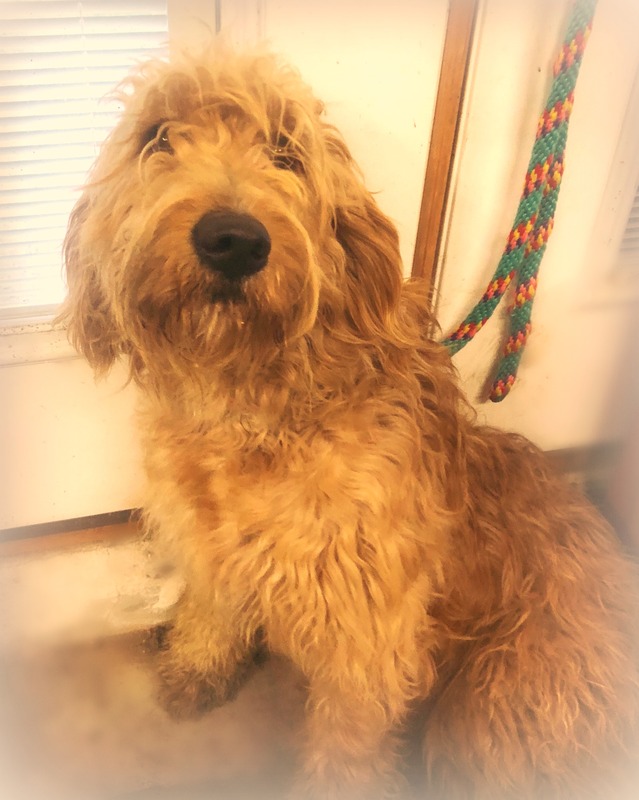 Mrs. Beasley is now retired, but she was one of our most popular red mommas. By day 14 we should start to see the first set of eyes opening and puppies will be crawling around after momma. Right now I have concerns for Bella’s pregnancy as her tummy is actually getting smaller every few days. A tummy stretching and appearing smaller is actually normal. I always see this and I suppose it usually does make me nervous until days later when we see the tummy plump again. This can happen towards the end of the gestation. However, having done this for so many years- I am growing concerned by the length of time her tummy has appeared smaller. With her due date in just one week, we will have her checked out to see if she has lost the pregnancy or if we simply have a small number of puppies. I understand saying this can cause a bit of a panic- but I’m wanting to make sure you know what I know and we all prepare just in case. Bella is acting energetic as usual which is a good sign. If we do have a pregnancy loss, we will of course breed her again the very next cycle. We are noticing lower than usual numbers in our puppies bred this past season. The extreme cold weather can effect male fertility and has given us lower numbers before. I remember a season when Sammy and Pepper went from having 9 puppies down to 2 and 3. The very next cycle they were back up to 9. So if we do have a pregnancy loss- we will breed the very next cycle and follow closely with ultrasound and X-rays. For those listed on this breeding- please let me know if you have an alternate litter you desire. We will be breeding back Lilly and Snowflake as well. If there is a pregnancy loss, we will move you to another litter of your choice or you may request a refund on your deposit. 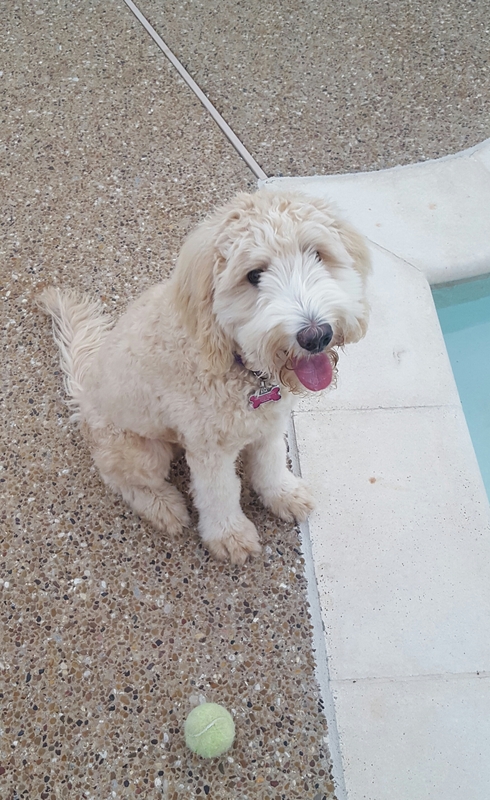 We want what is best for each of you as well as with our puppies. 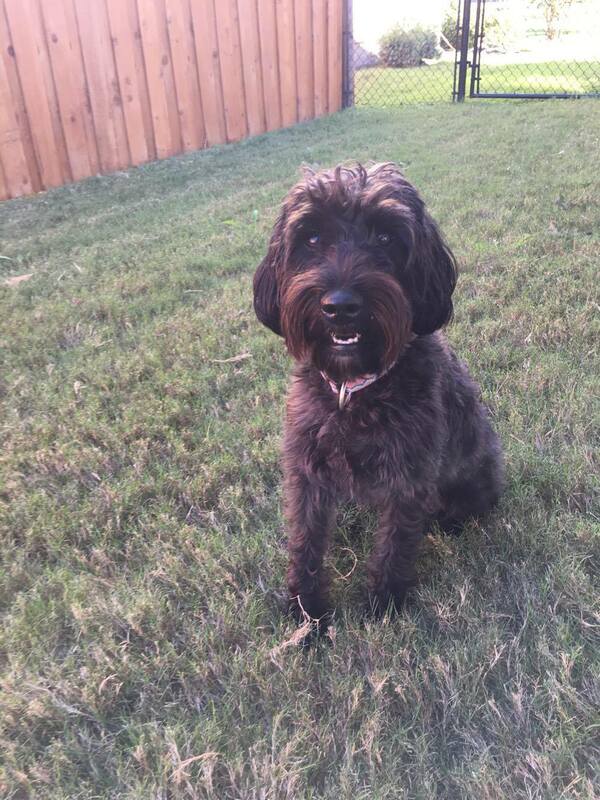 I will be emailing as soon as our Vet has checked out Bella to give results.